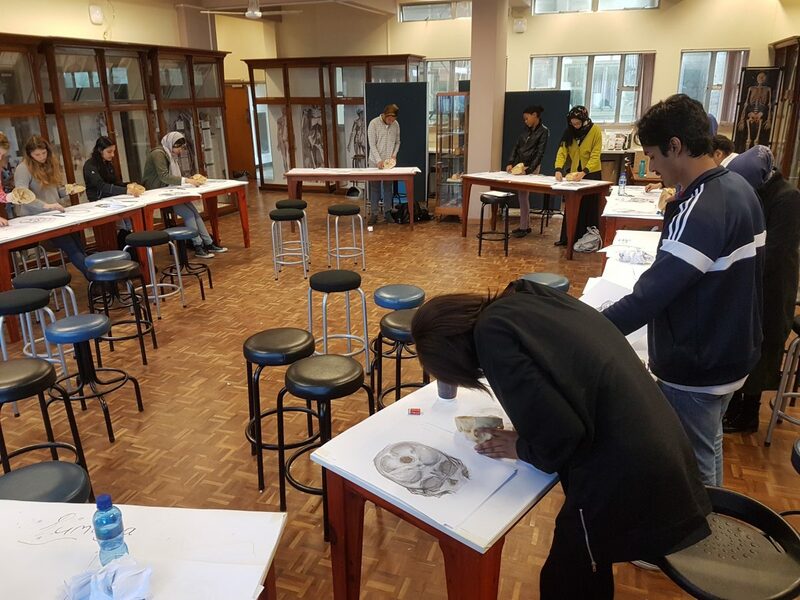 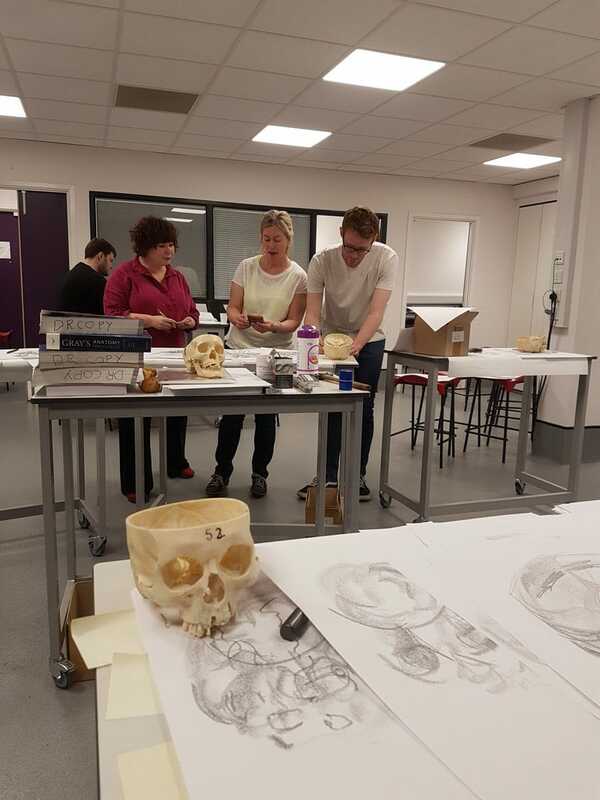 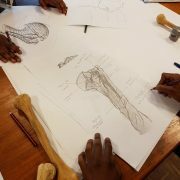 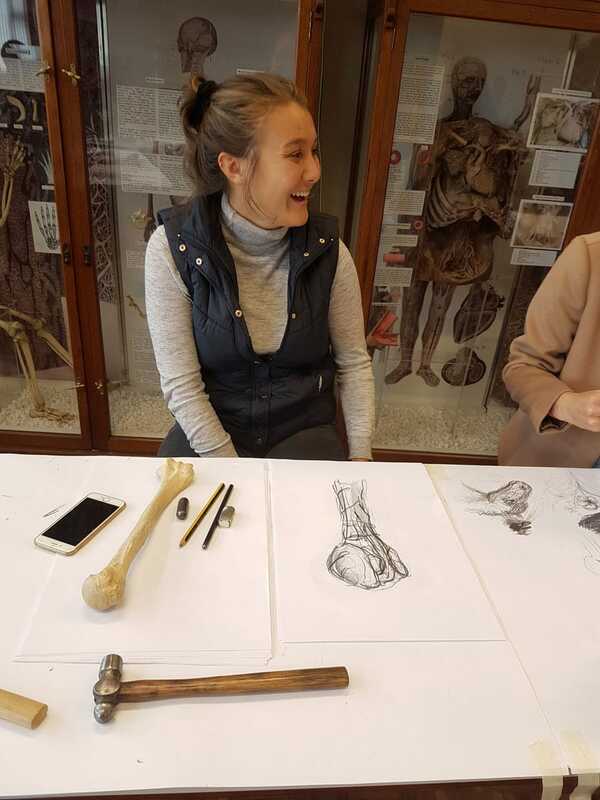 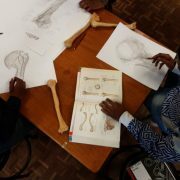 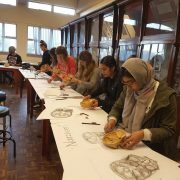 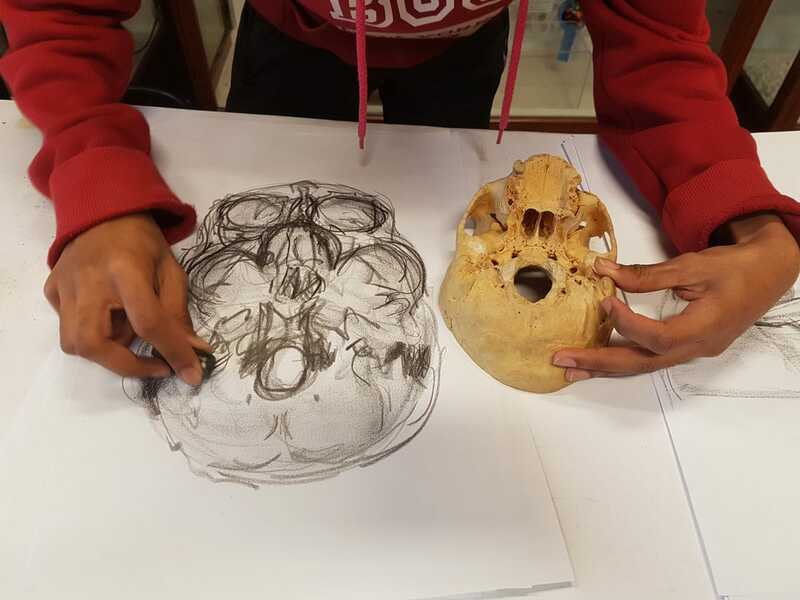 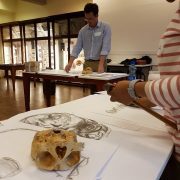 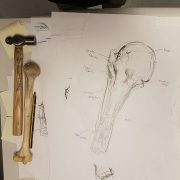 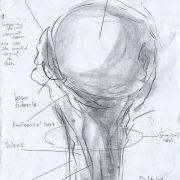 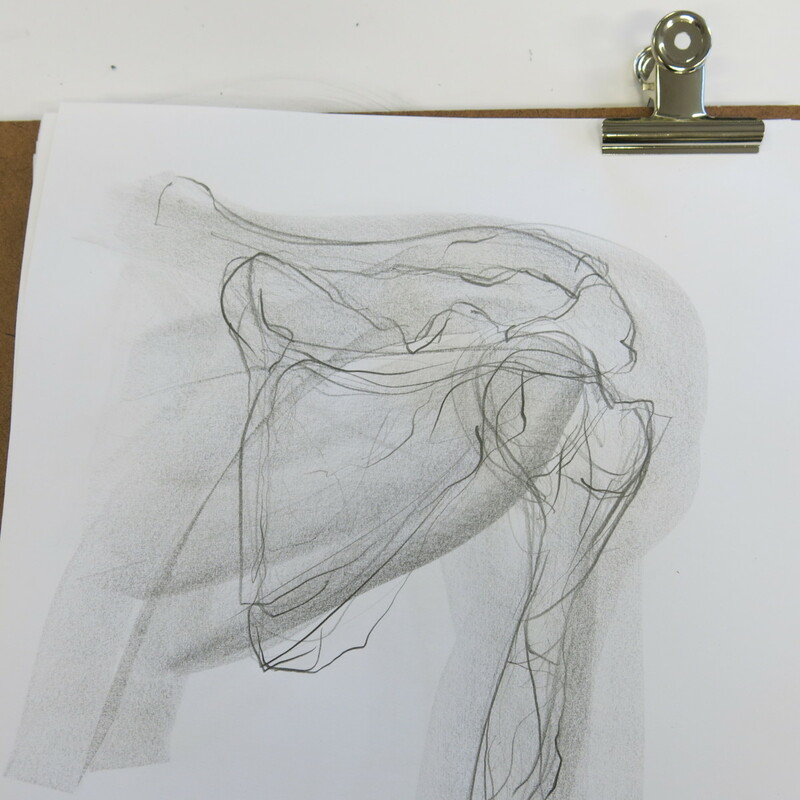 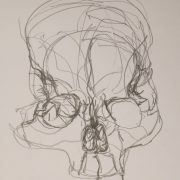 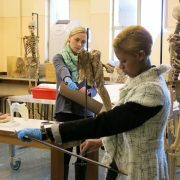 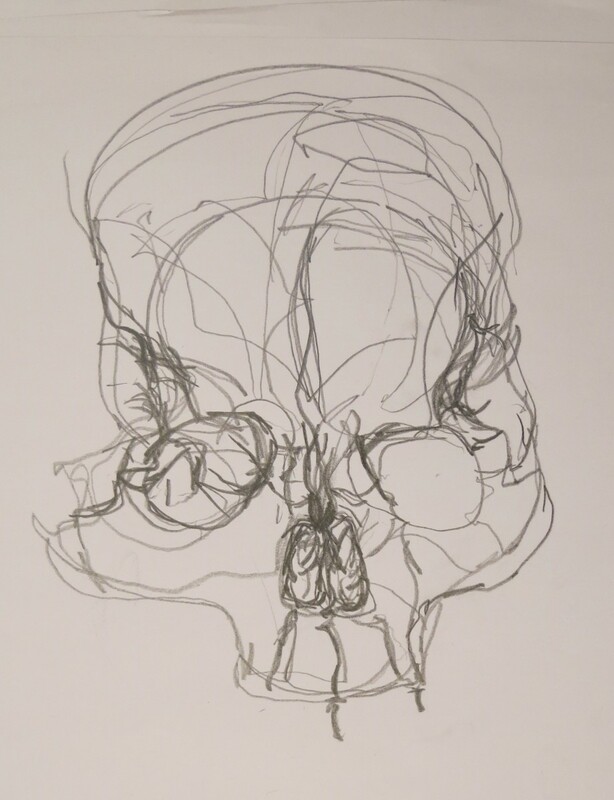 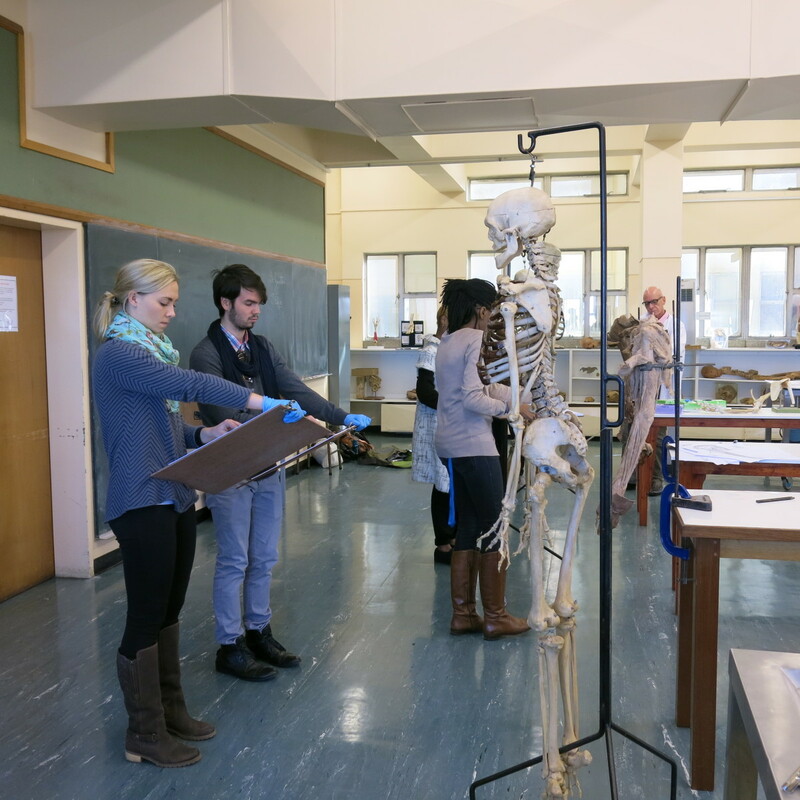 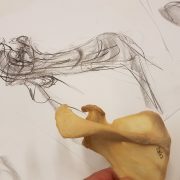 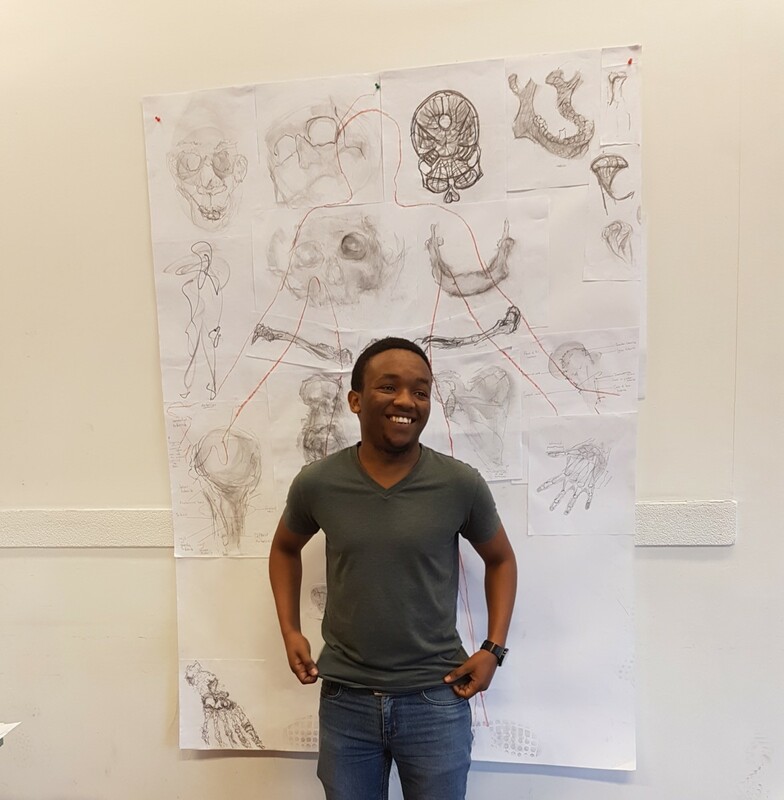 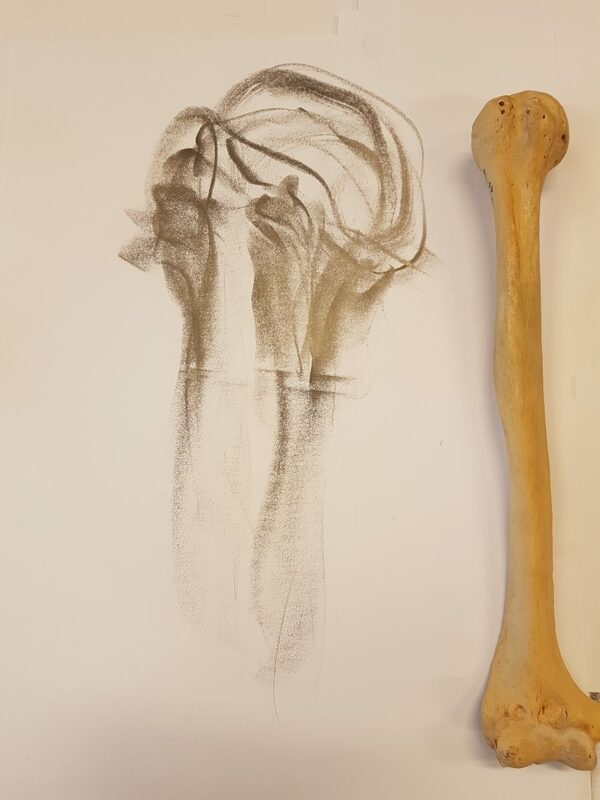 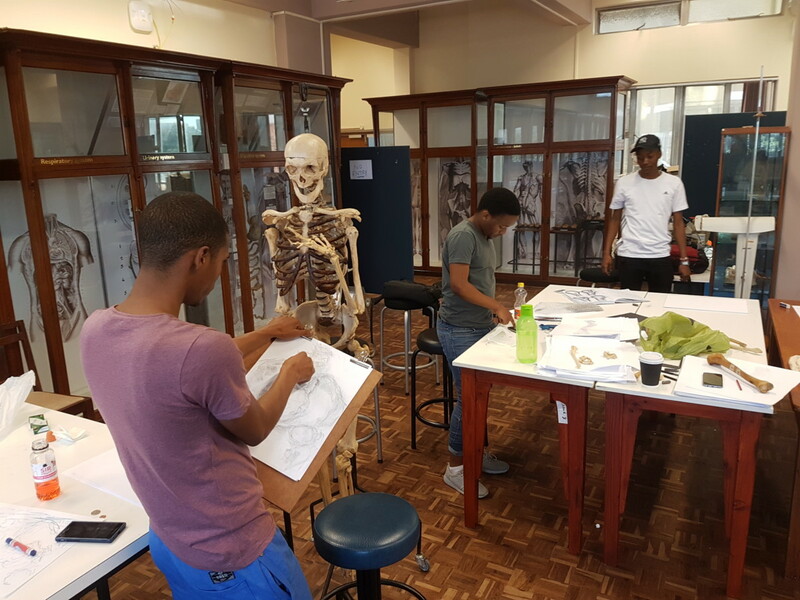 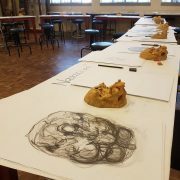 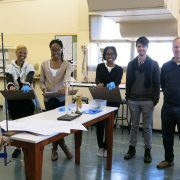 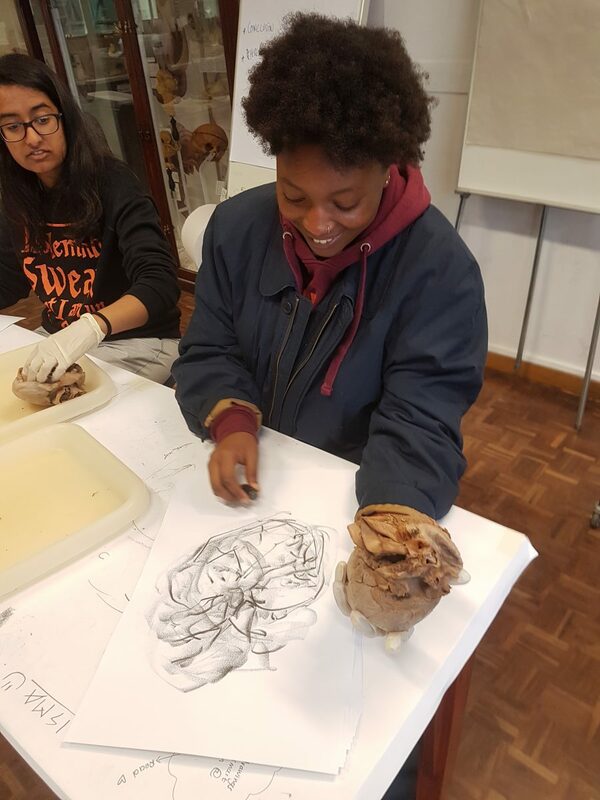 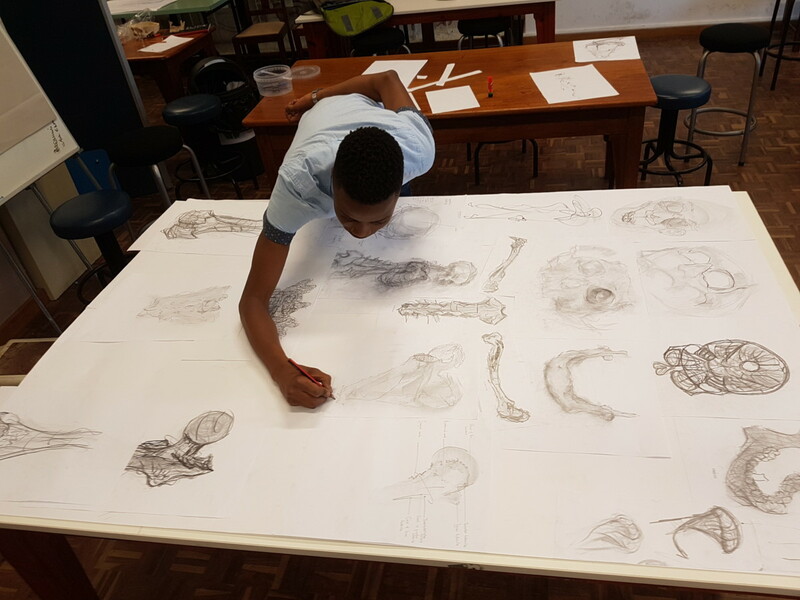 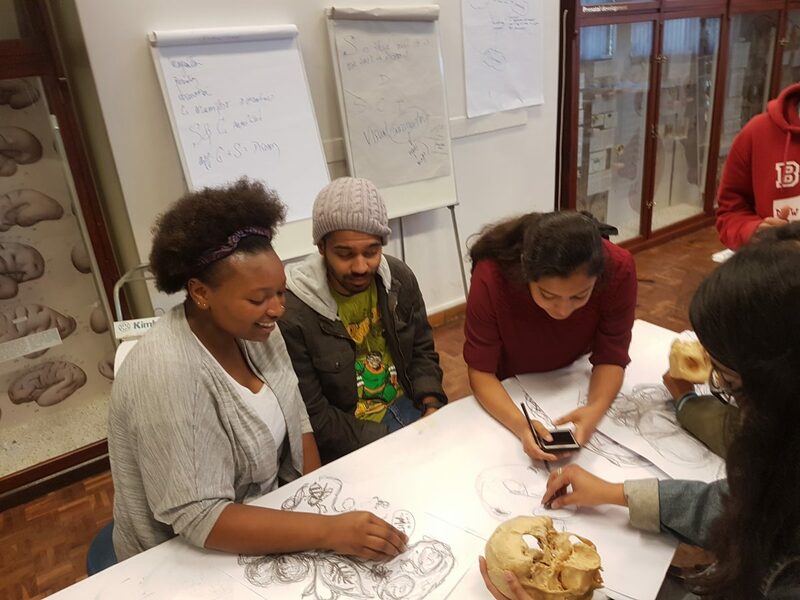 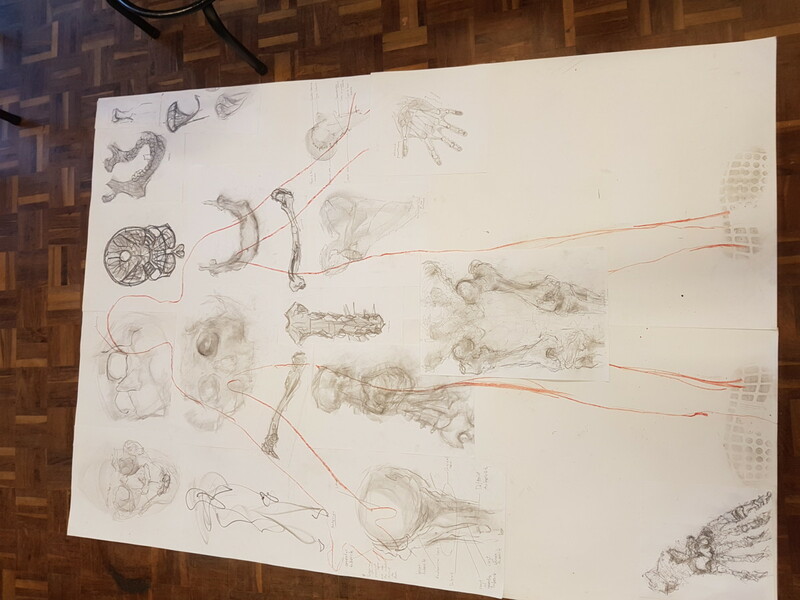 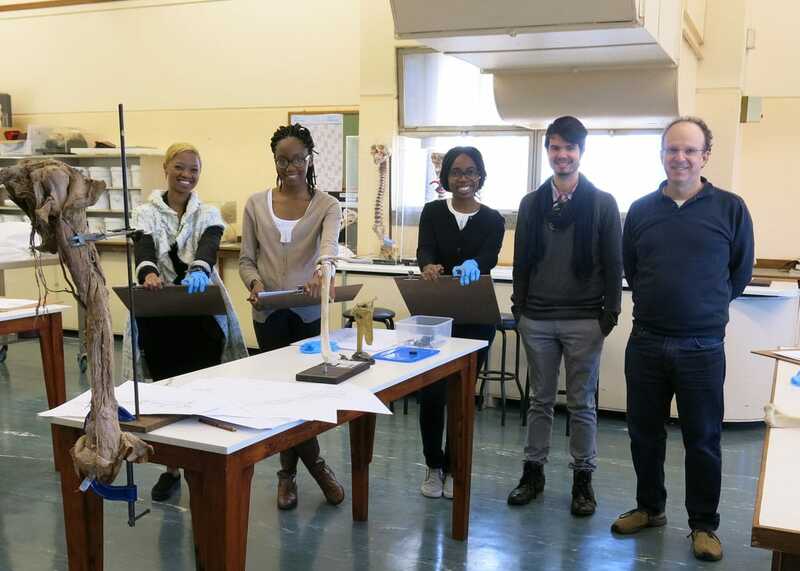 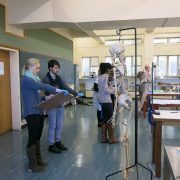 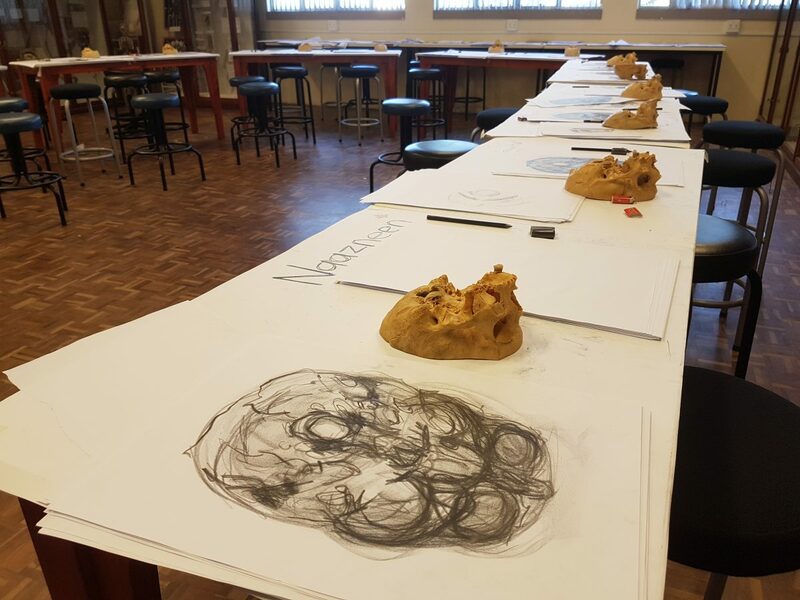 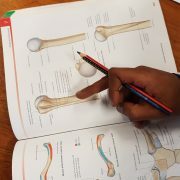 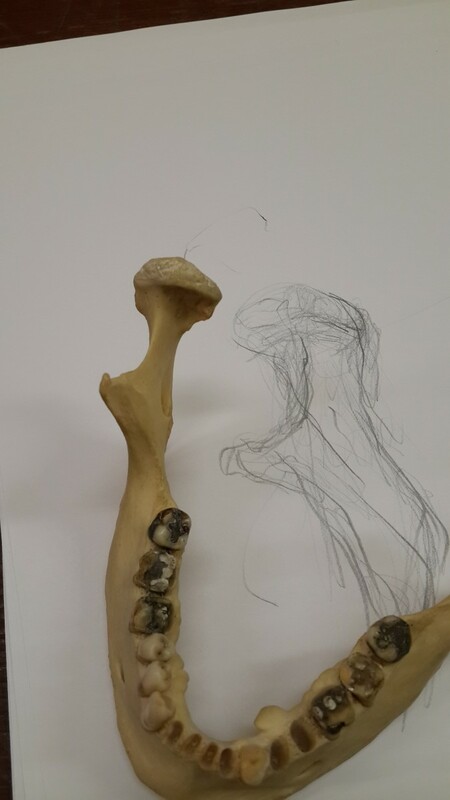 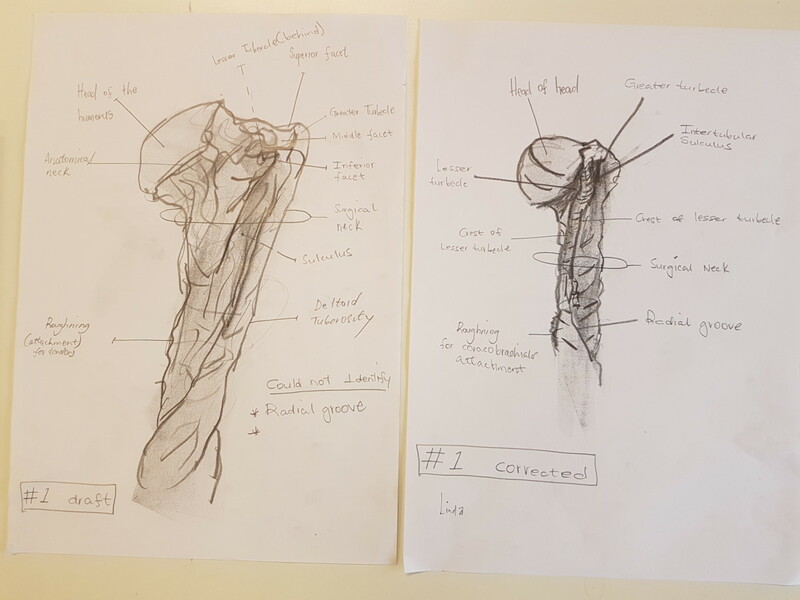 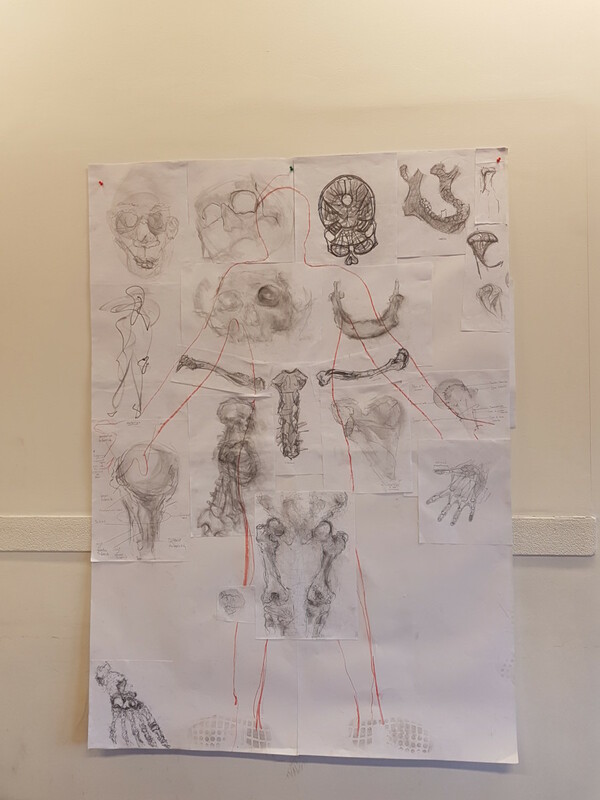 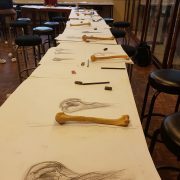 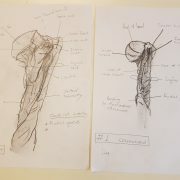 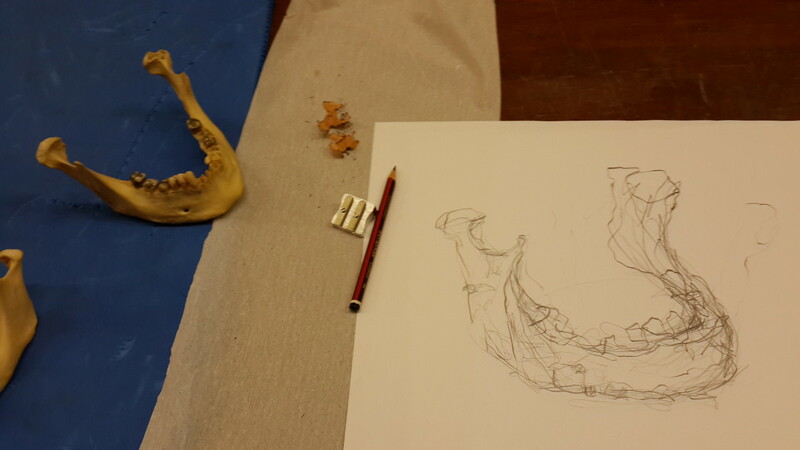 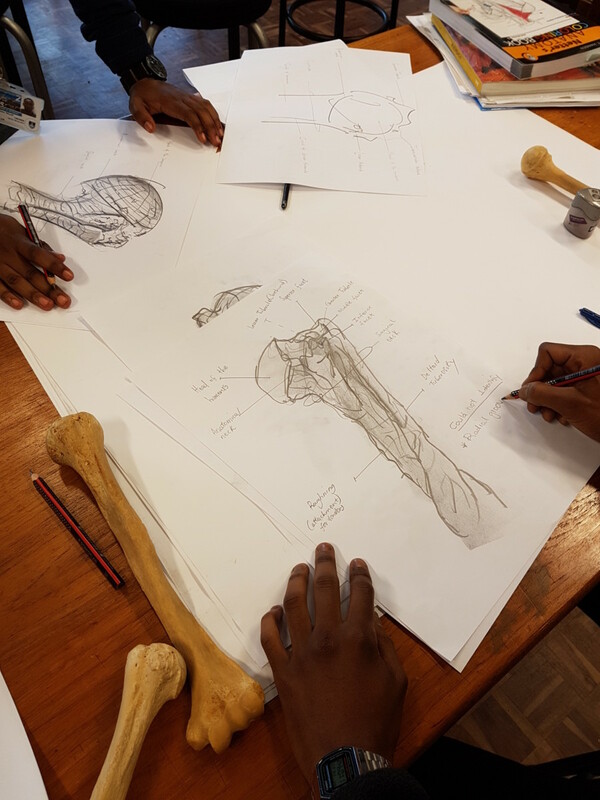 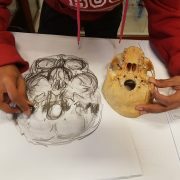 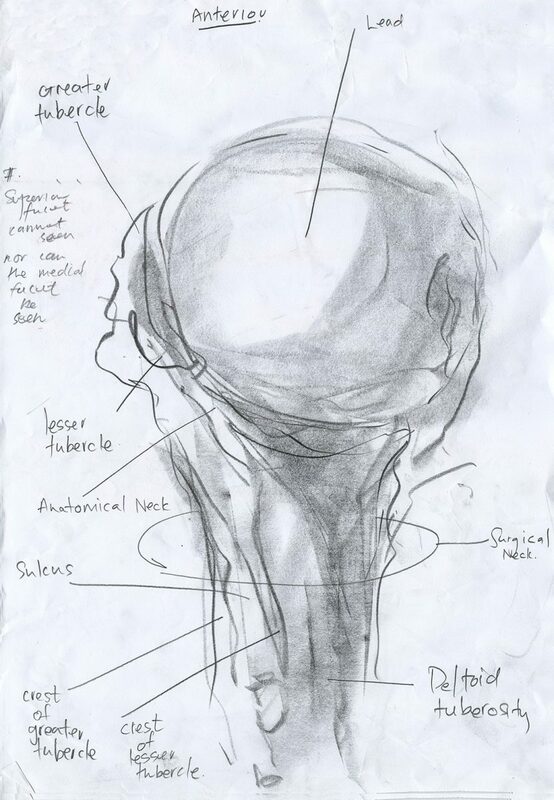 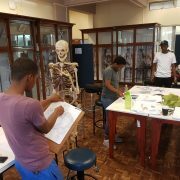 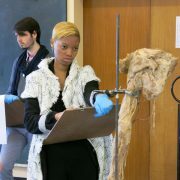 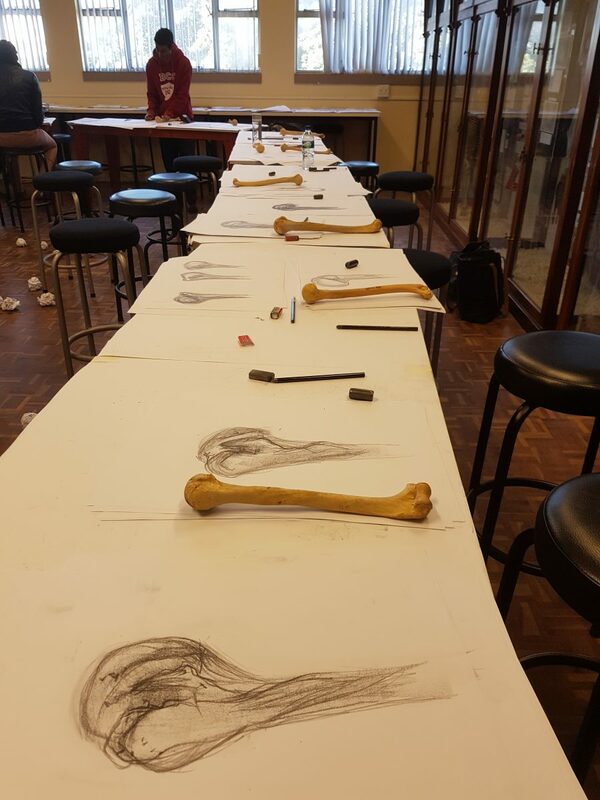 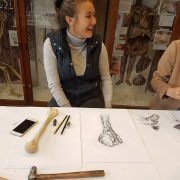 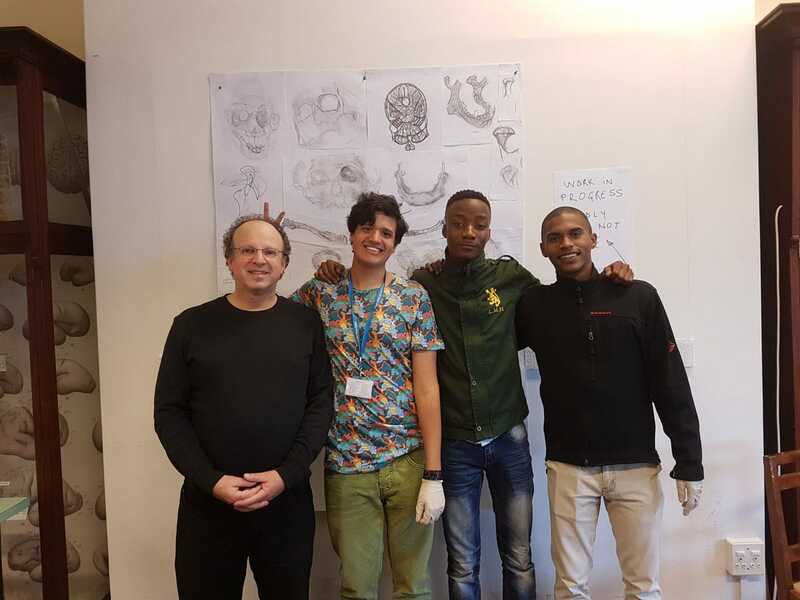 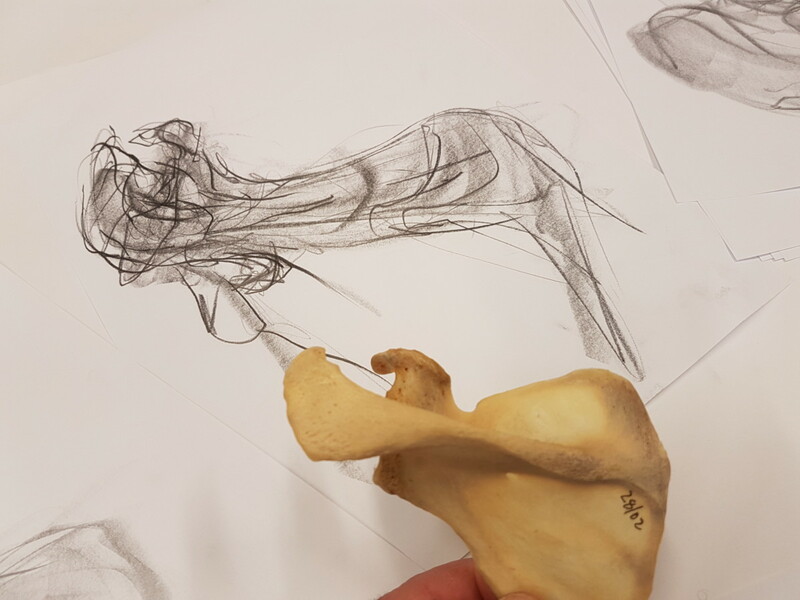 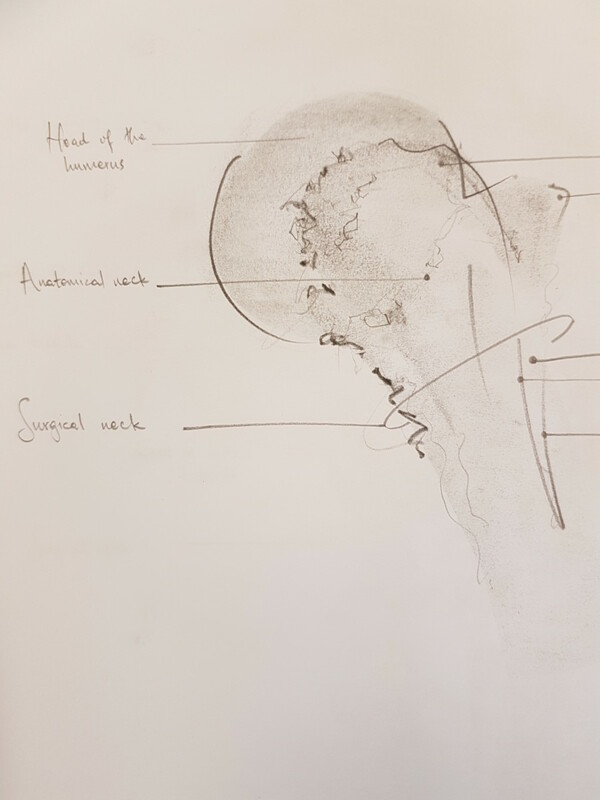 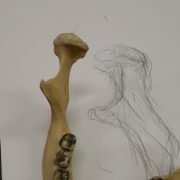 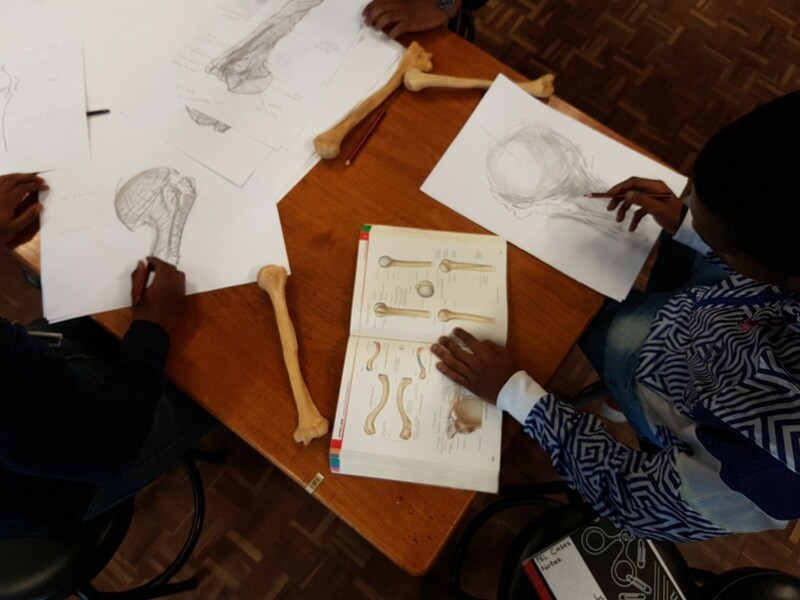 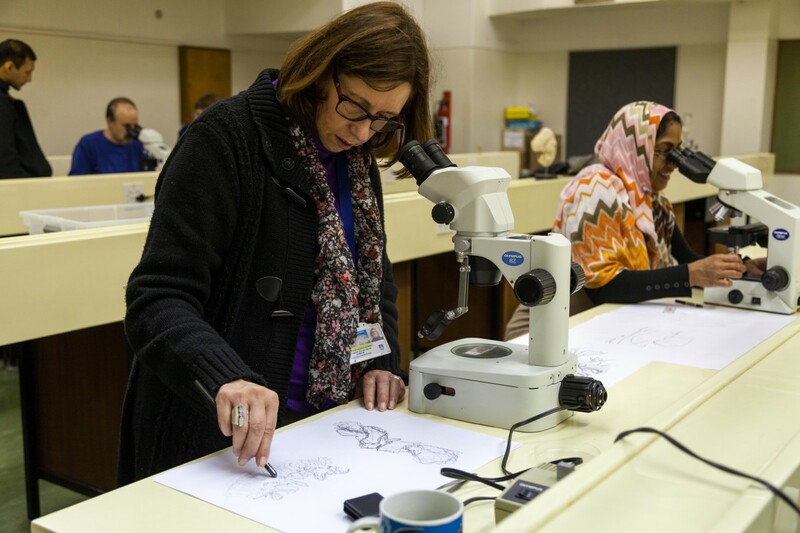 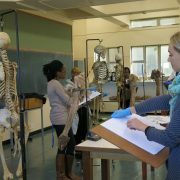 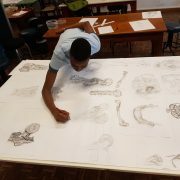 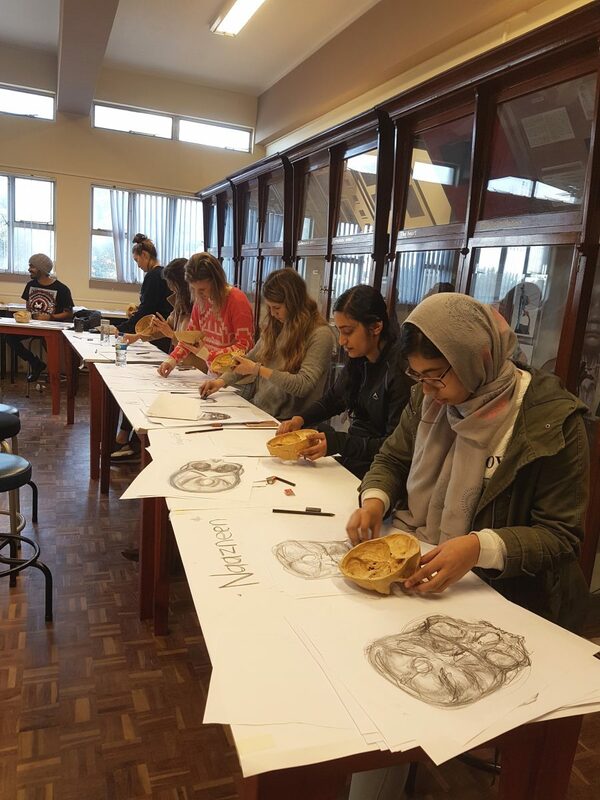 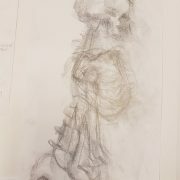 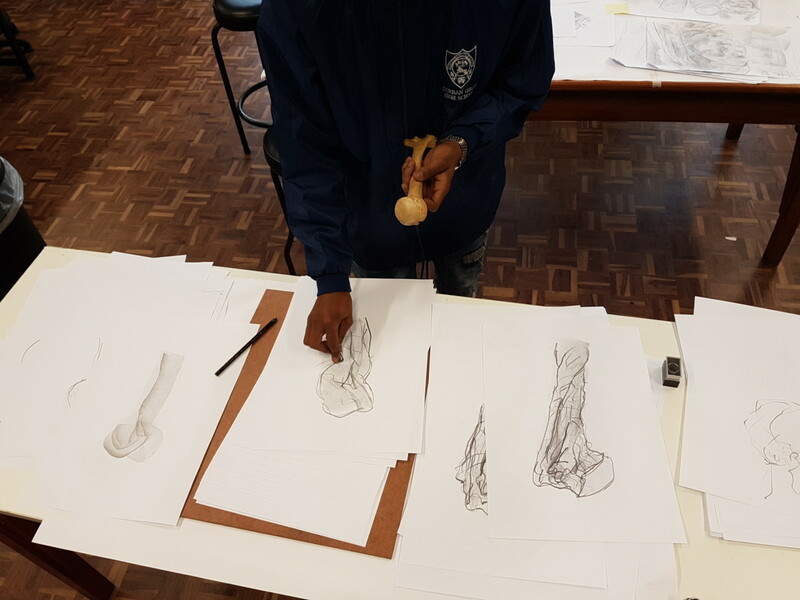 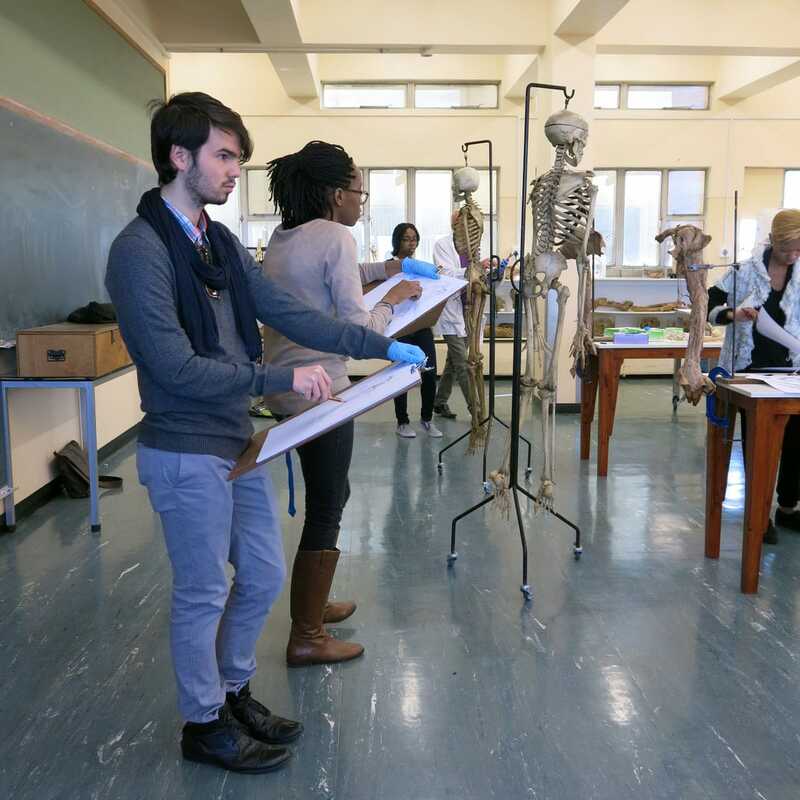 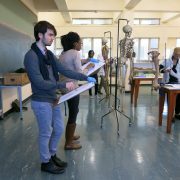 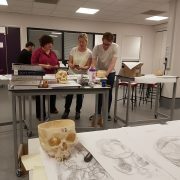 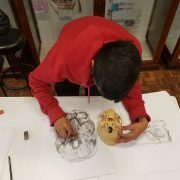 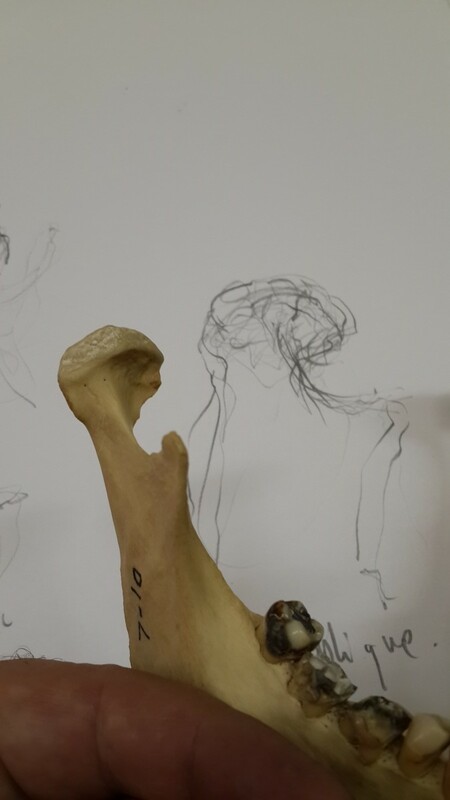 Anatomy Studies: Observation & drawing of gross anatomy to increase observation, memorization and recall. 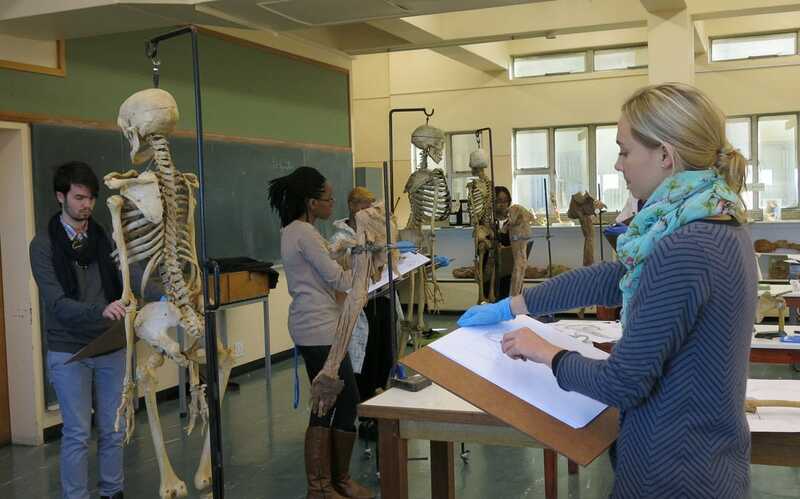 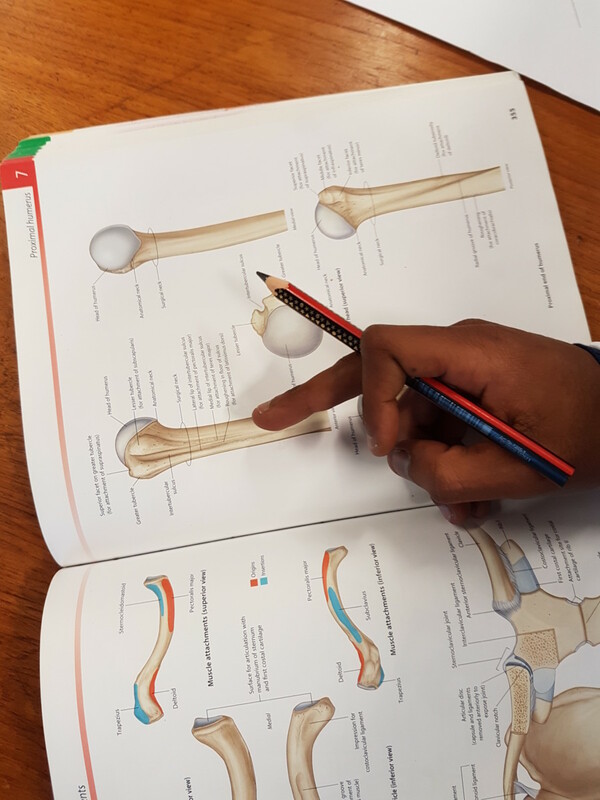 Studying the human anatomy involves observing it. 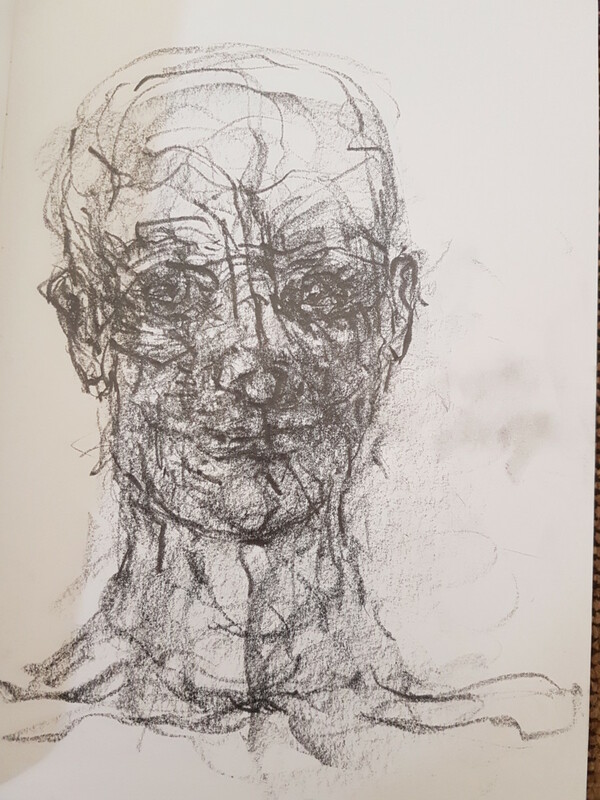 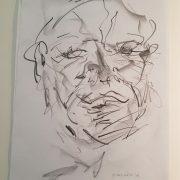 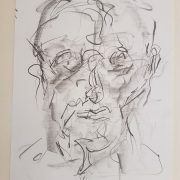 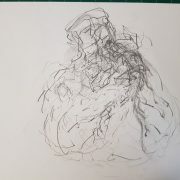 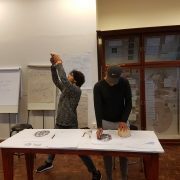 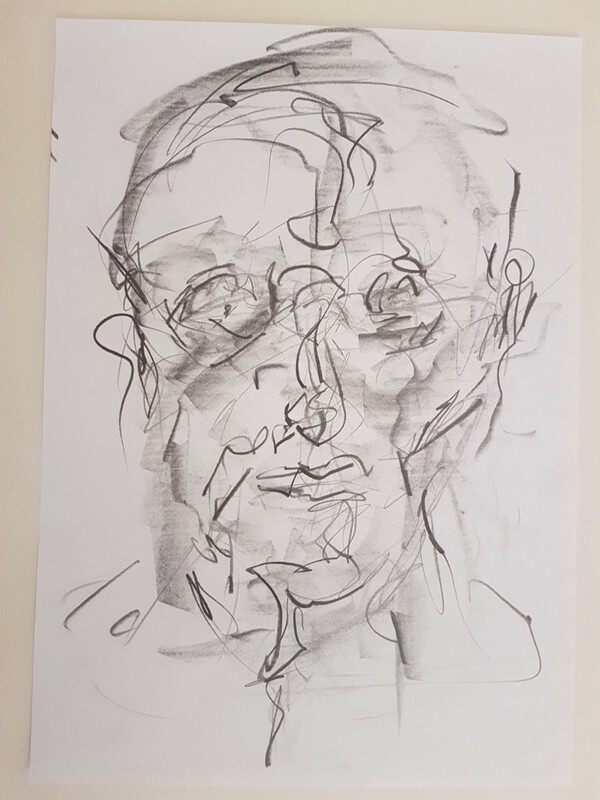 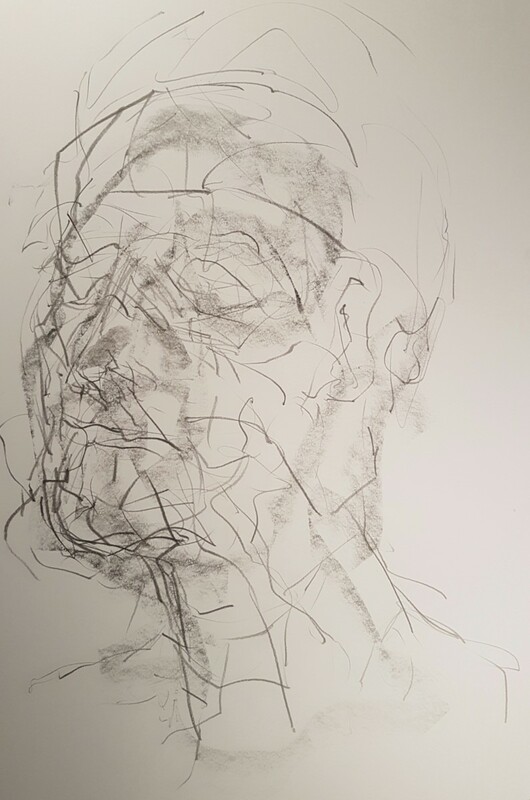 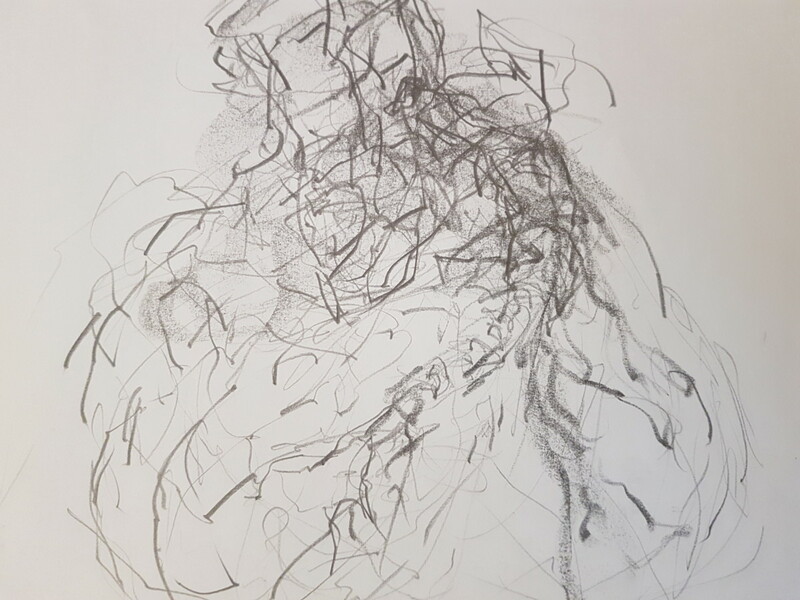 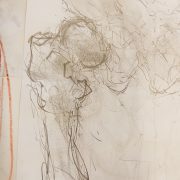 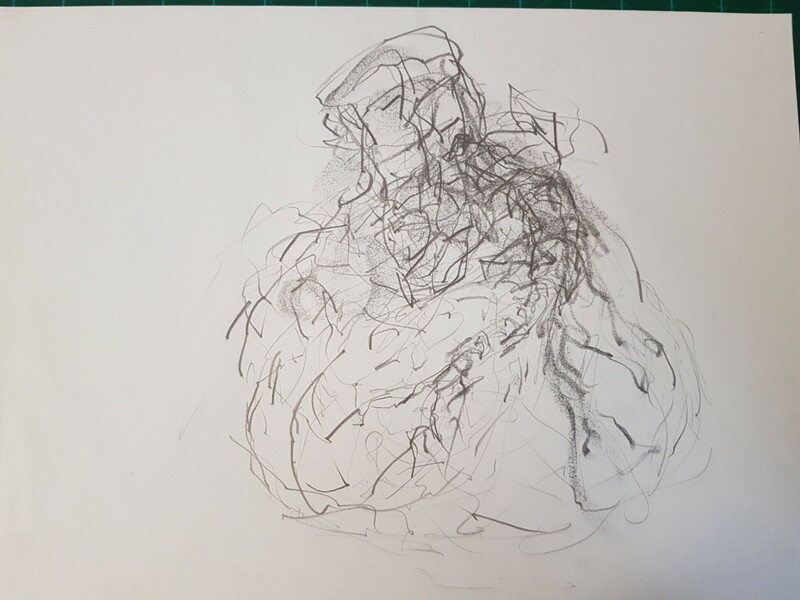 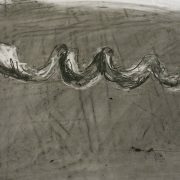 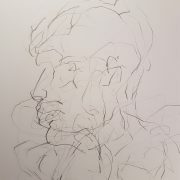 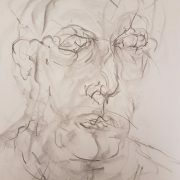 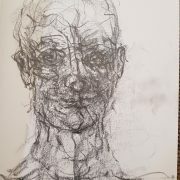 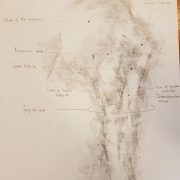 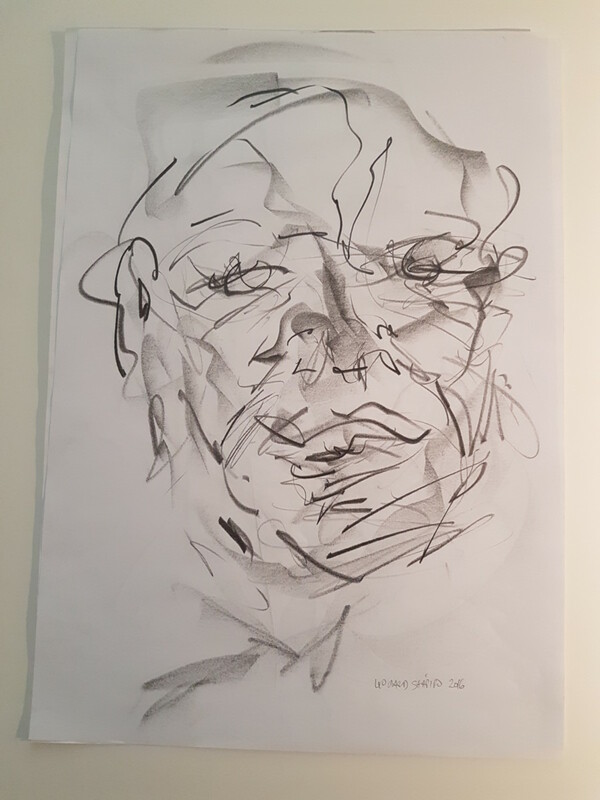 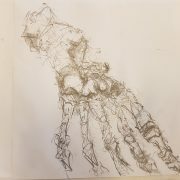 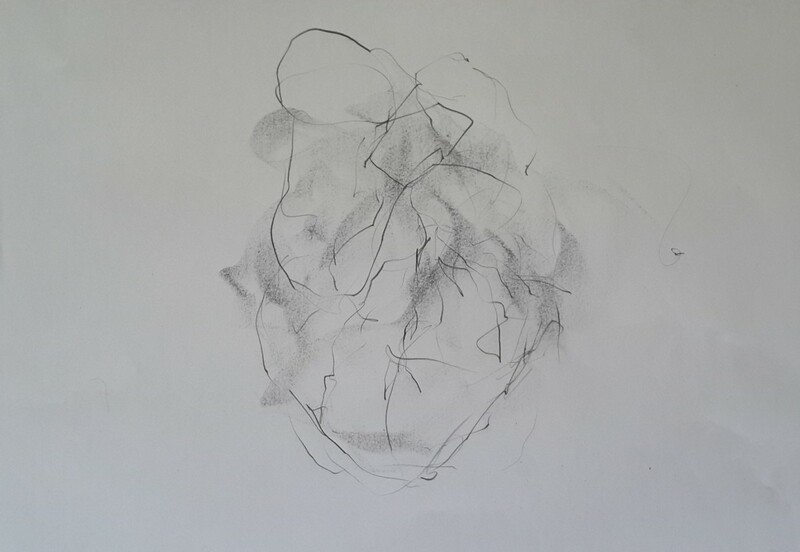 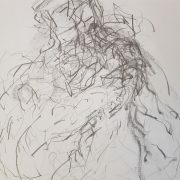 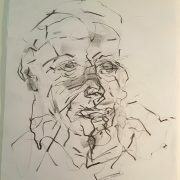 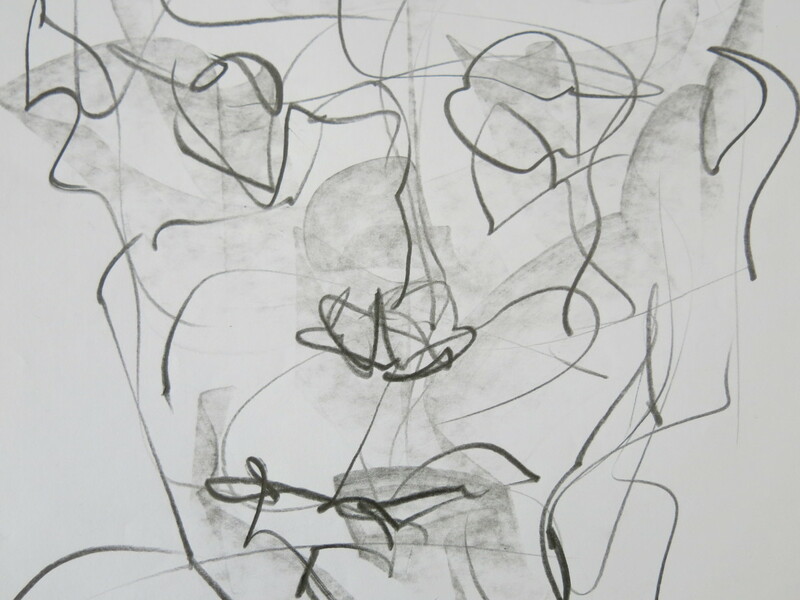 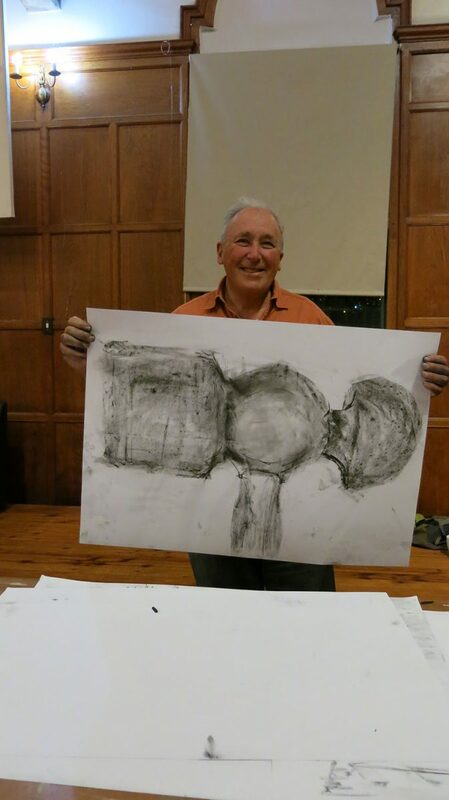 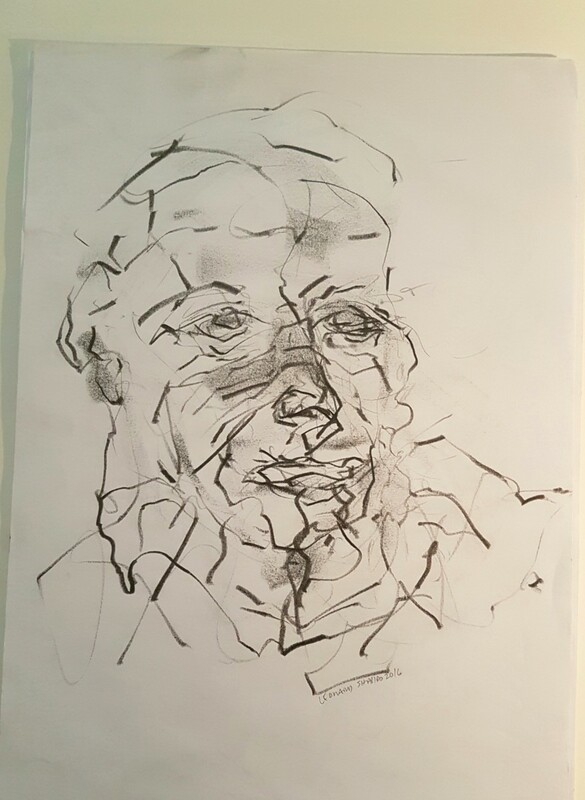 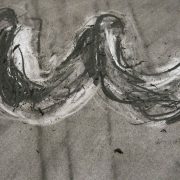 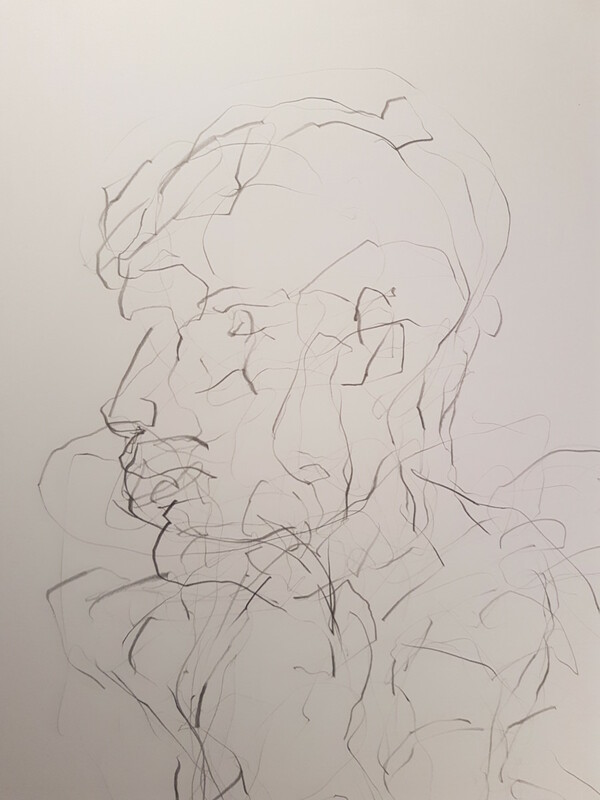 I teach a novel, multi-sensory observation method which crucially involves the sense of TOUCH, as well as sight, and the simultaneous act of drawing (i.e. 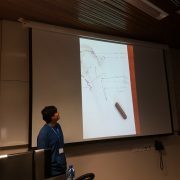 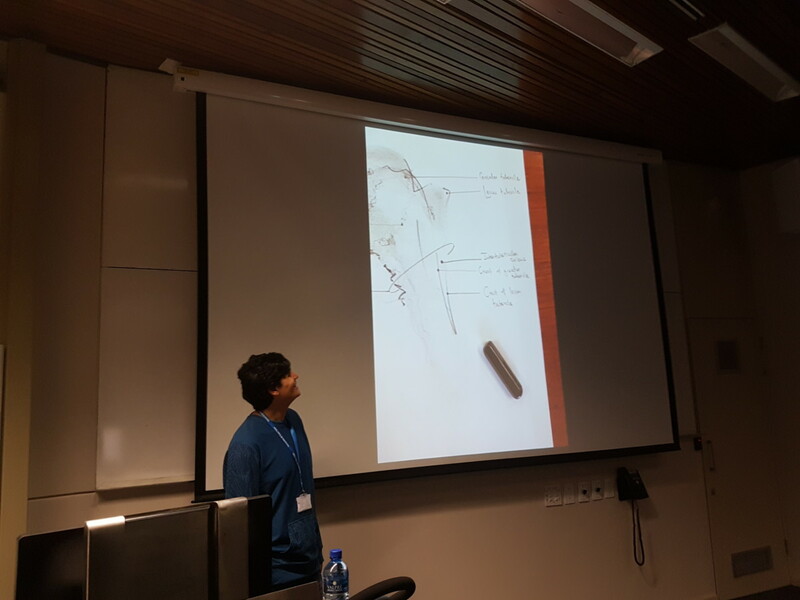 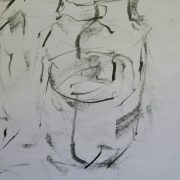 recording in marks on paper) what is being observed. 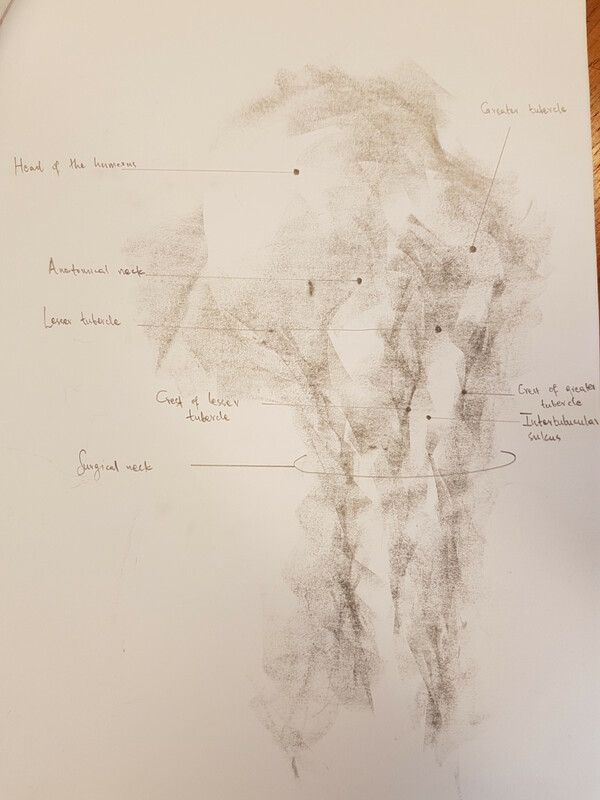 We gather a huge amount of information from an object when we explore it through touch, and this information becomes included in the marks that we make (i.e. 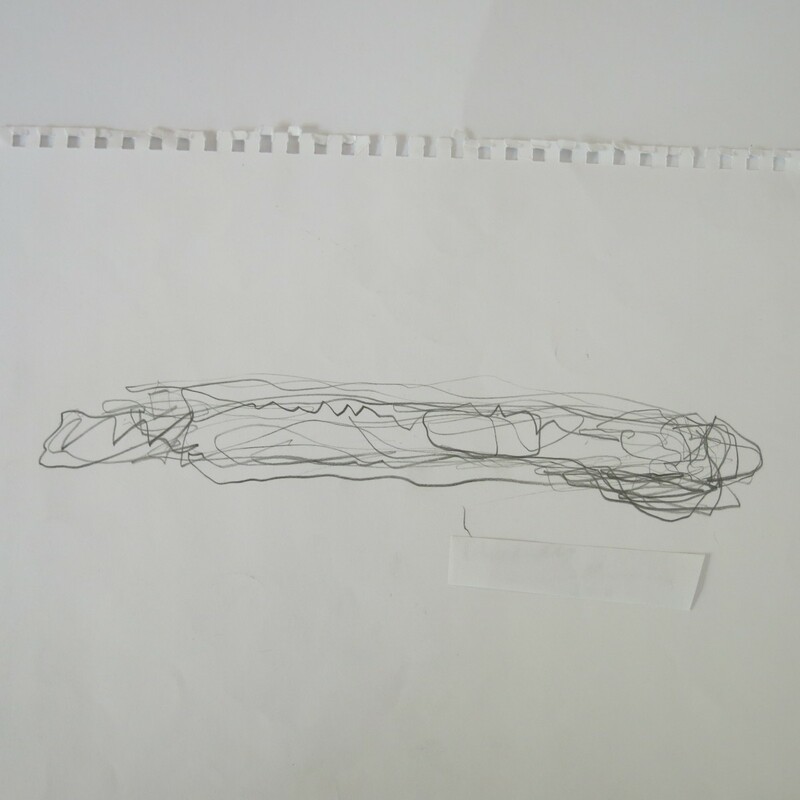 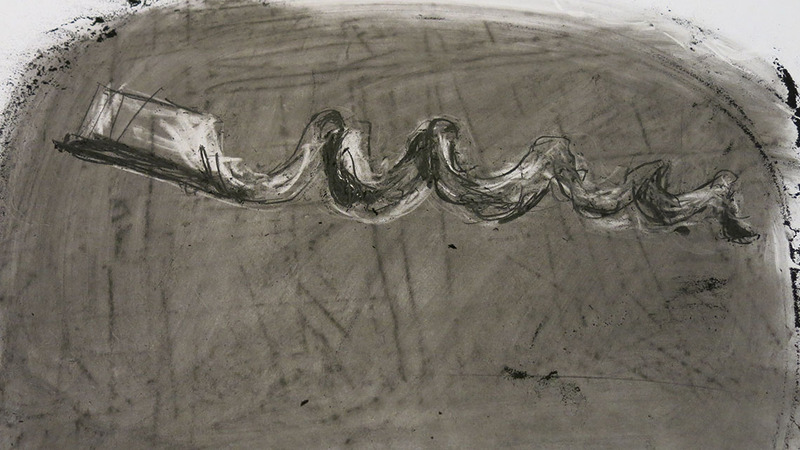 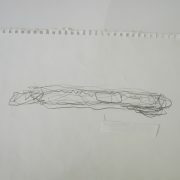 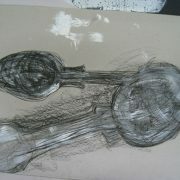 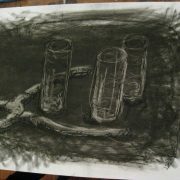 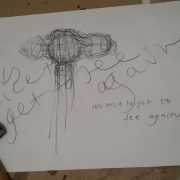 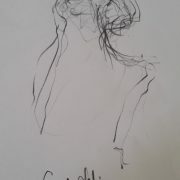 our drawing) in order to reflect what we are touching and seeing. 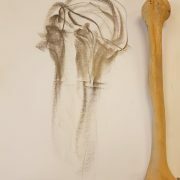 Note that the muscles and nerves of the hand occupy a very large area of the sensory cortex and motor cortex of the brain. 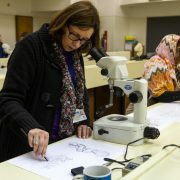 I have called this method of observation the Haptico-Visual Observation and Drawing (HVO&D) method. 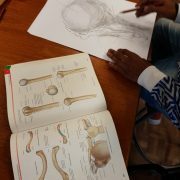 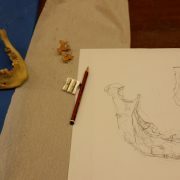 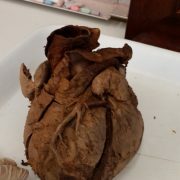 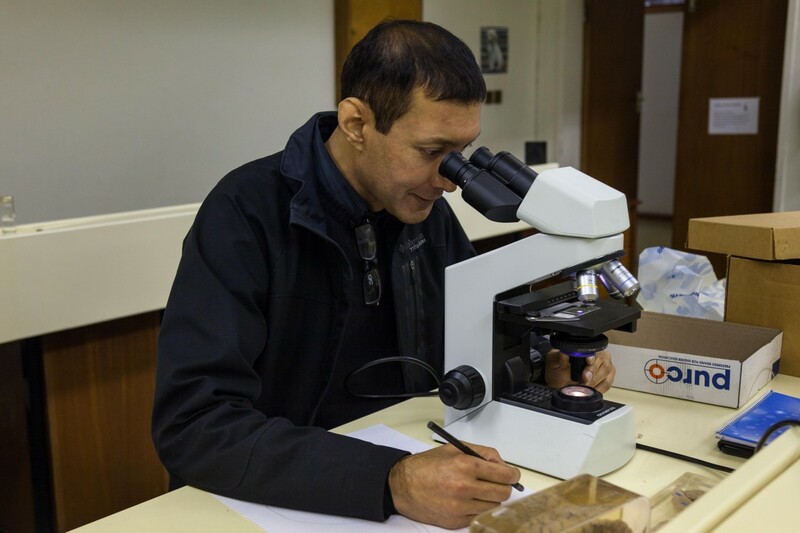 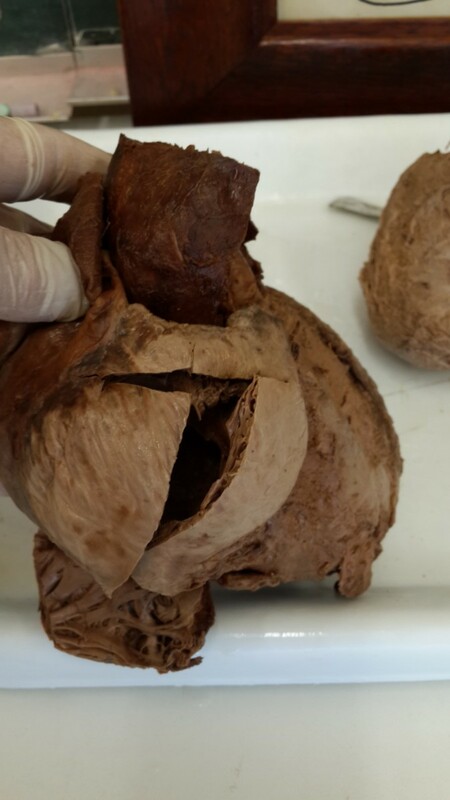 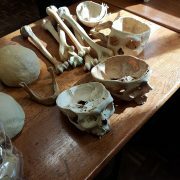 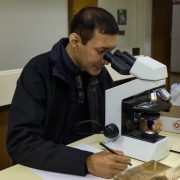 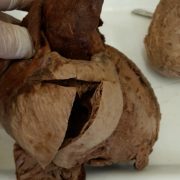 The results of observing in this way are deep observation and memorization of the anatomical part being observed and studied. 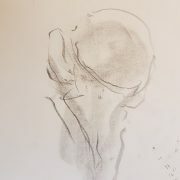 The observer is able to recall the anatomical part from memory long after it has been observed, and they will be able to draw it again with accuracy. 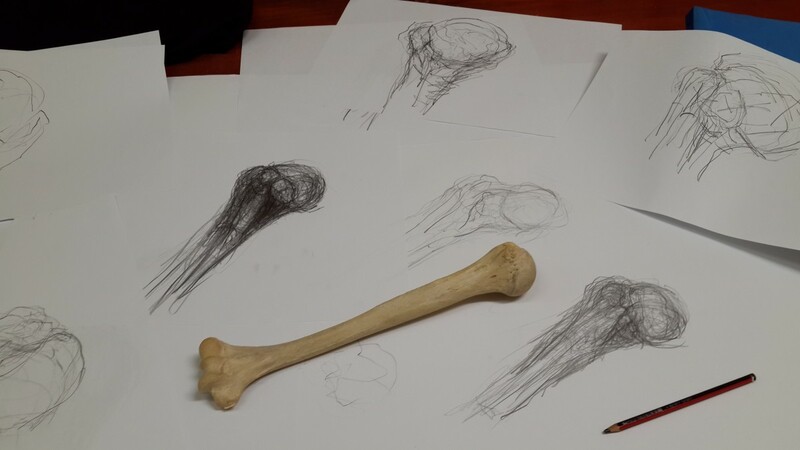 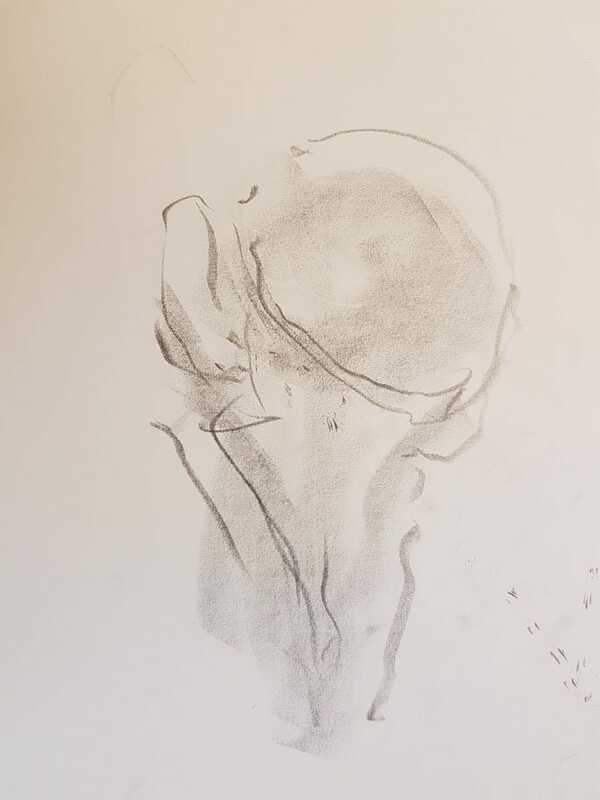 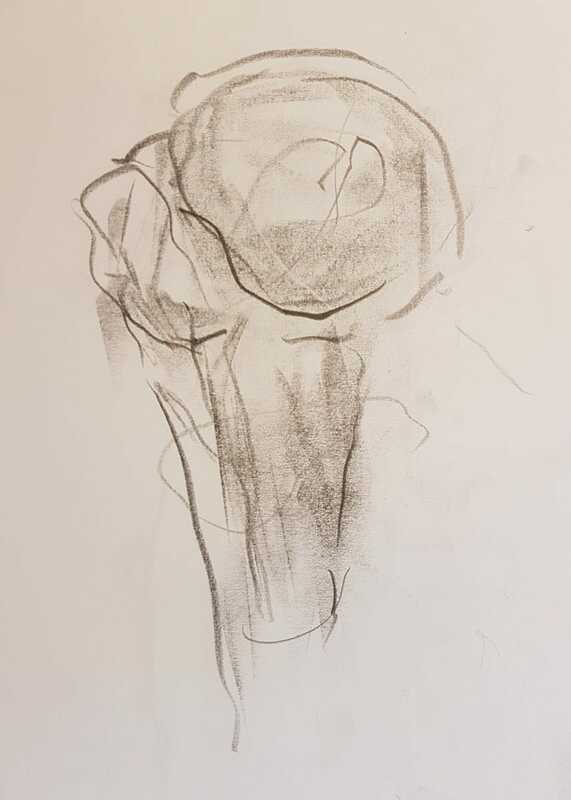 When you draw an object (such as a bone or an organ) in this way, you literally get to notice more of its detail than you would have before you drew it. 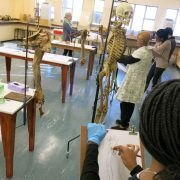 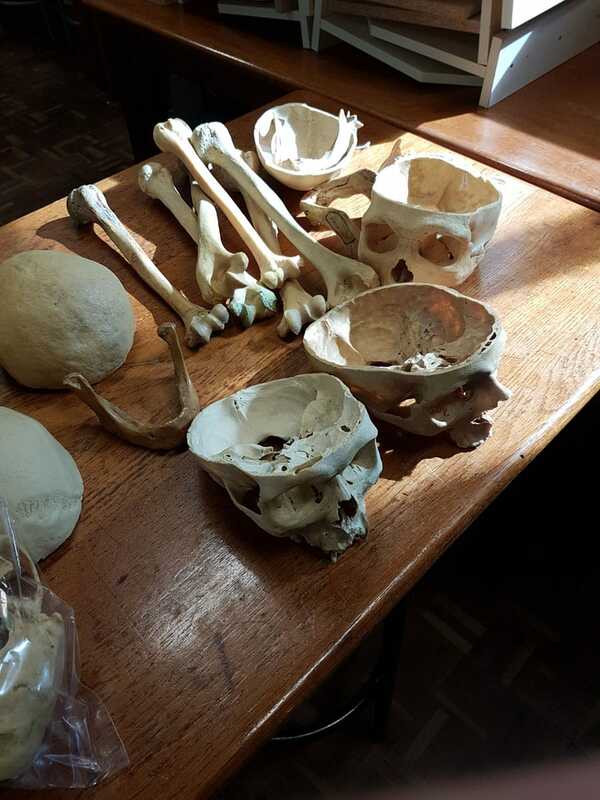 The positive ramifications for anatomy students, anatomists, medical practitioners and related scientists are obvious. 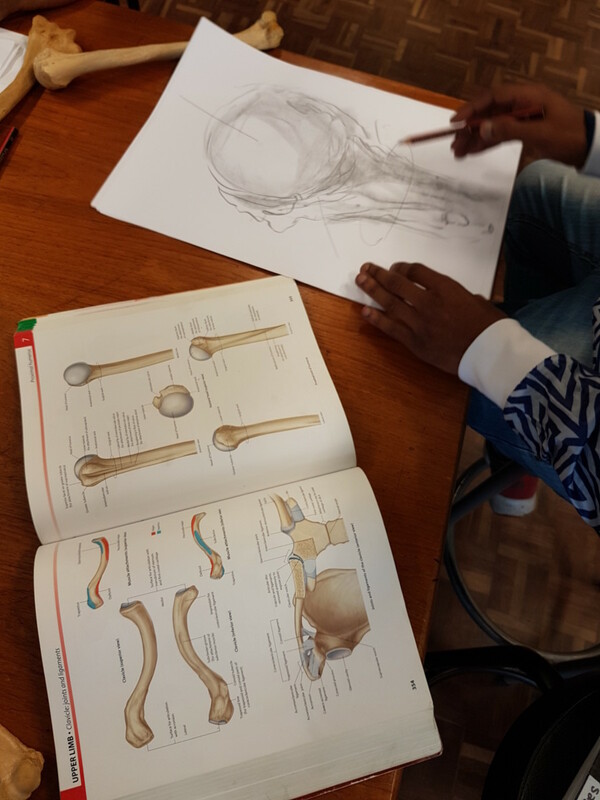 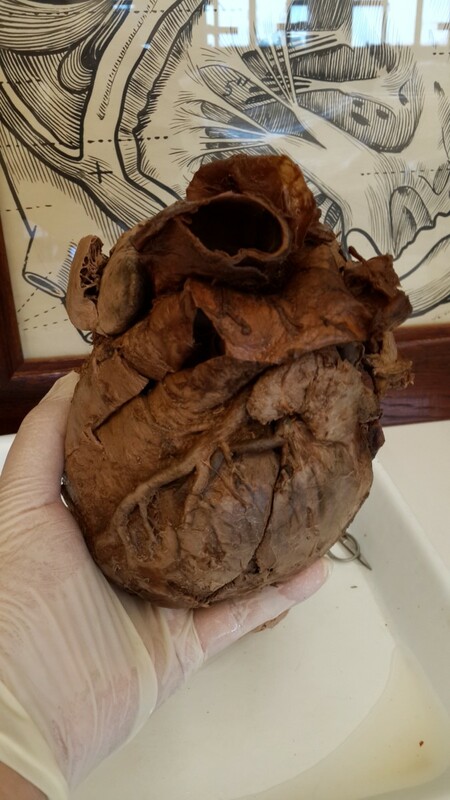 "Let someone say of a doctor that he really knows his physiology or anatomy, that he is dynamic - these are real compliments; but if you say he is an observer, a man who really knows how to see, this is perhaps the greatest compliment one can make" - Jean-Martin Charcot. 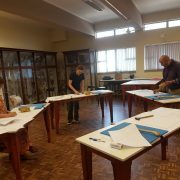 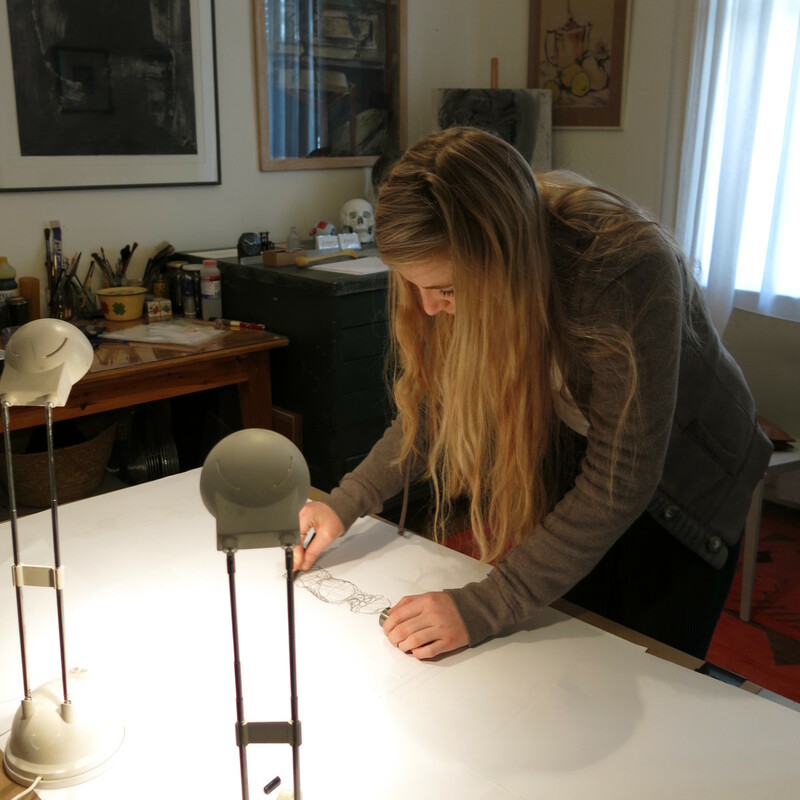 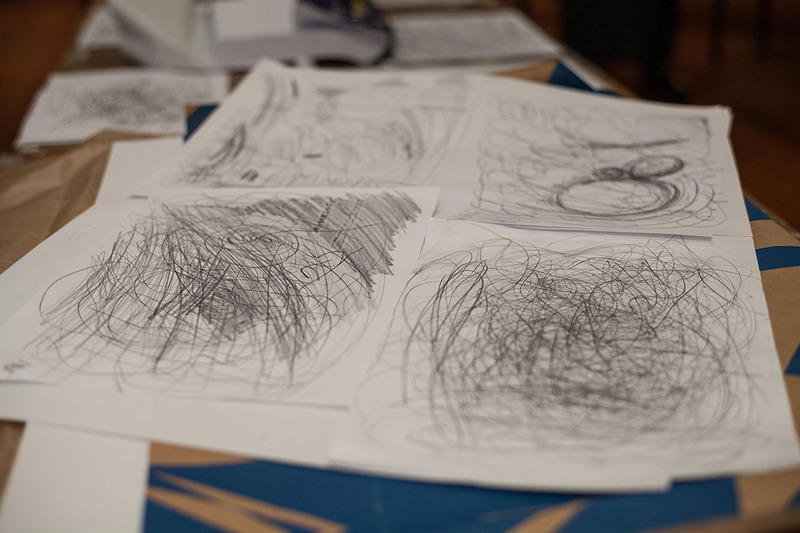 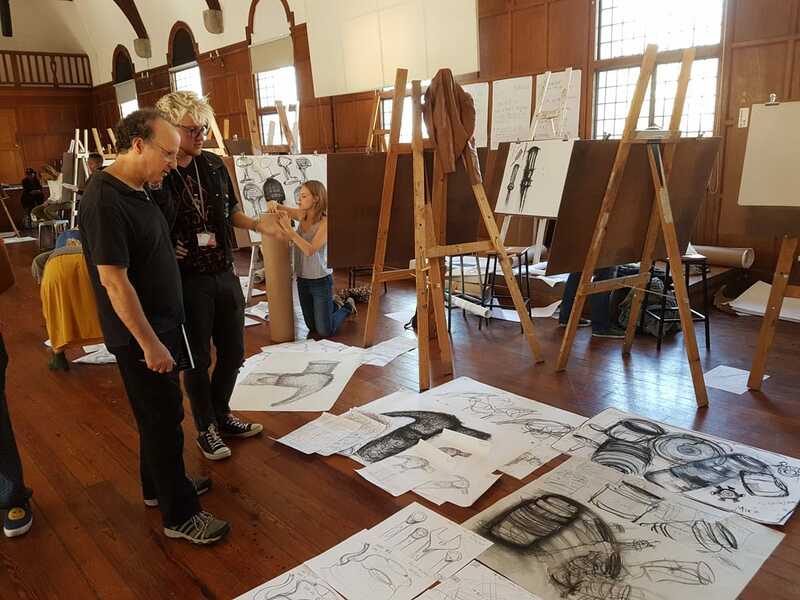 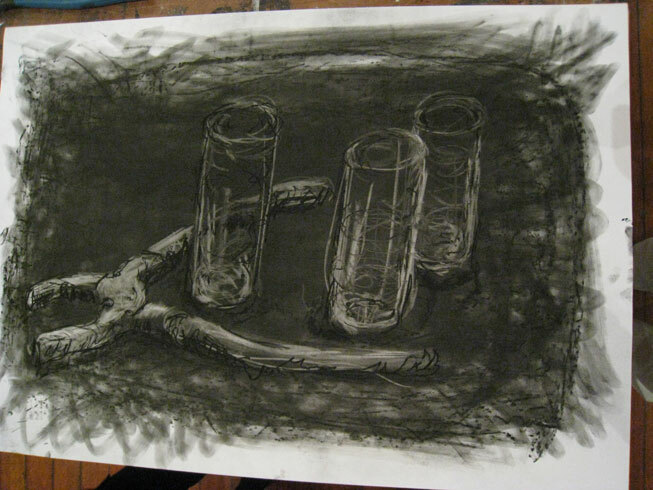 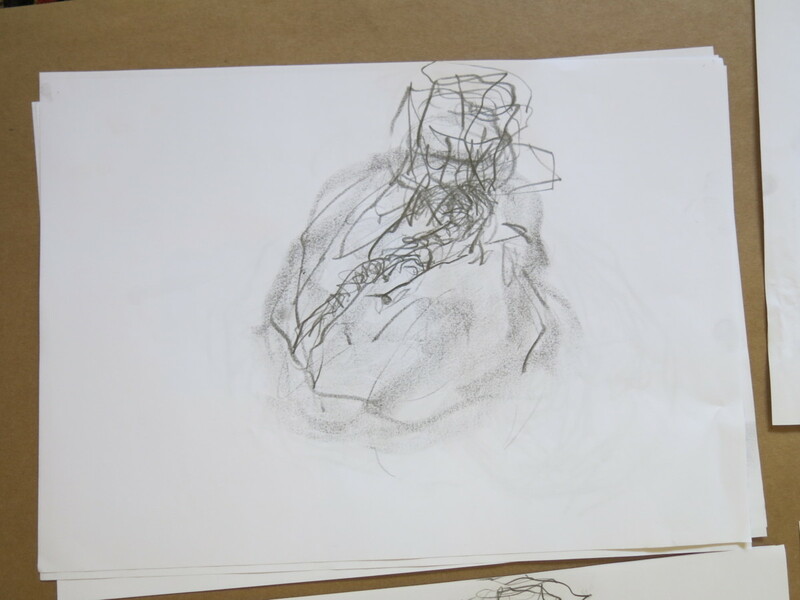 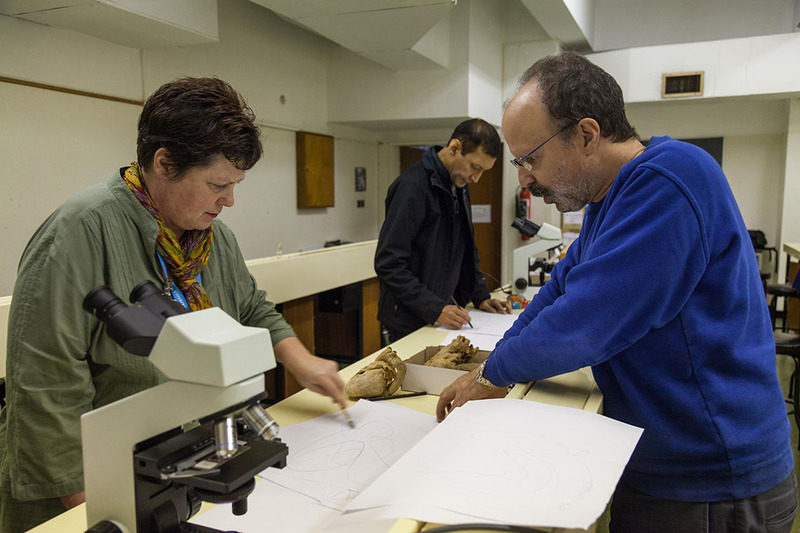 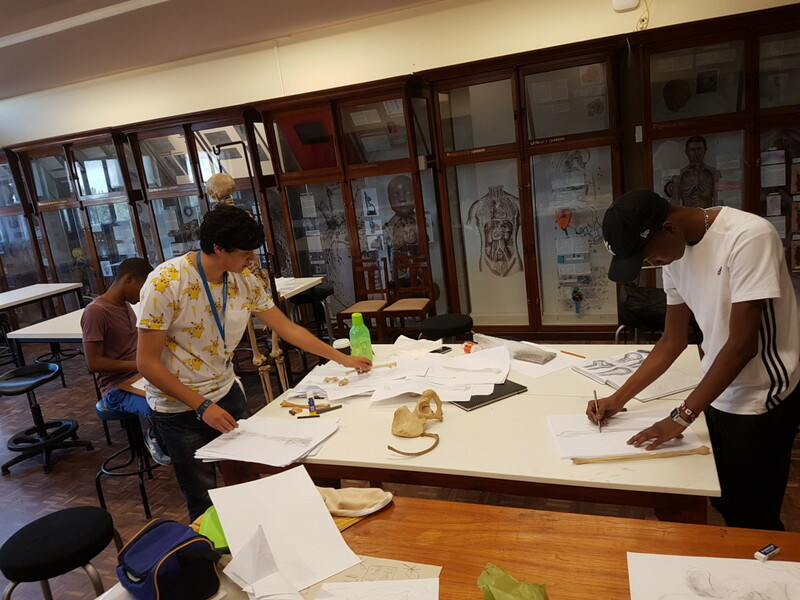 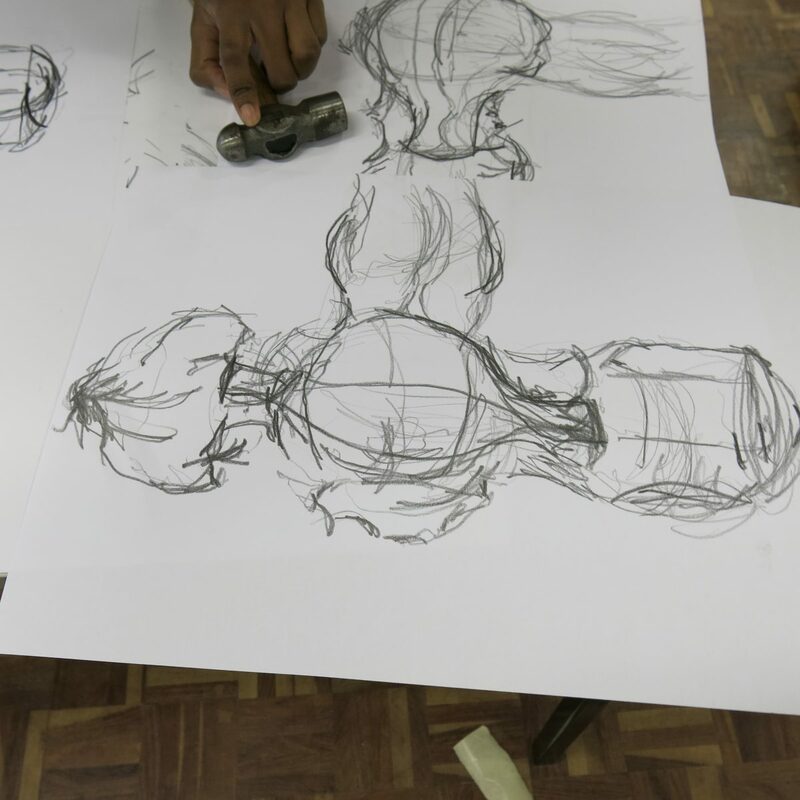 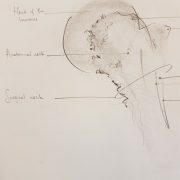 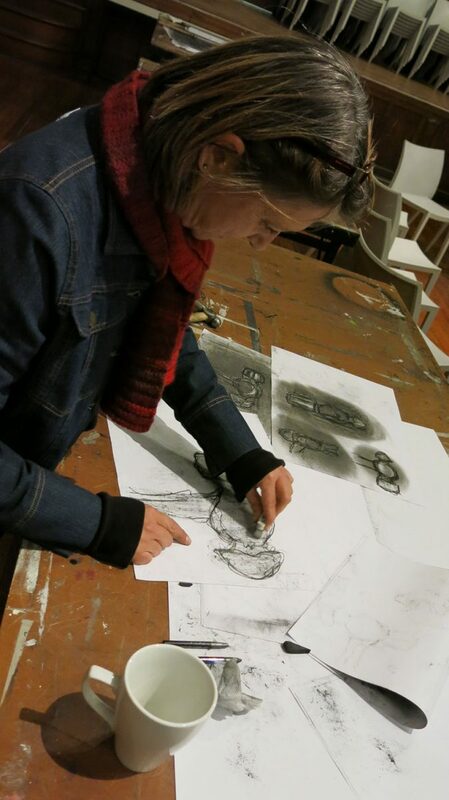 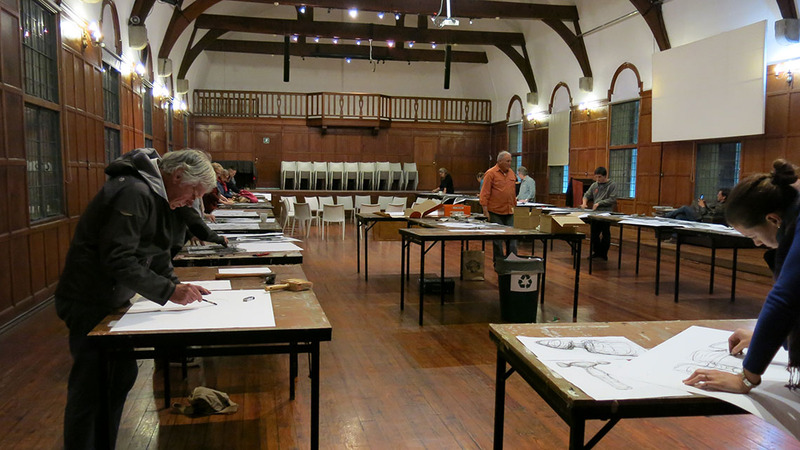 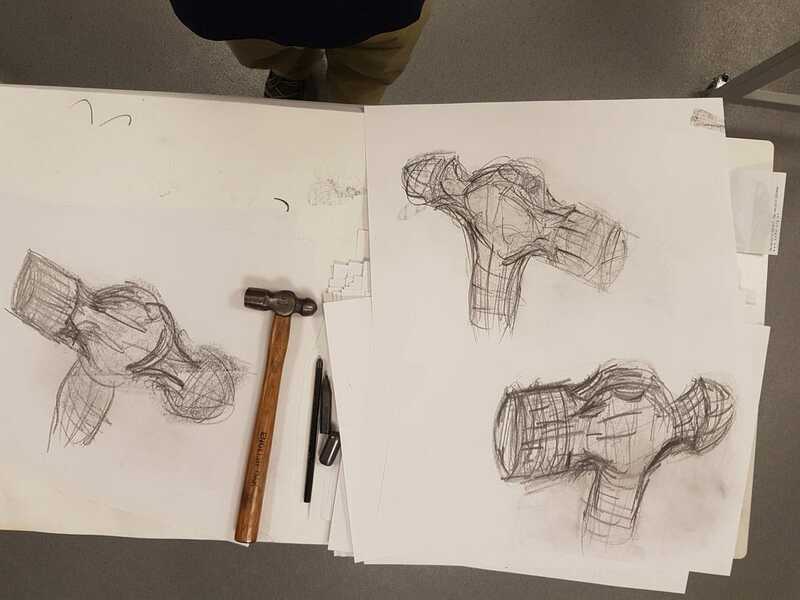 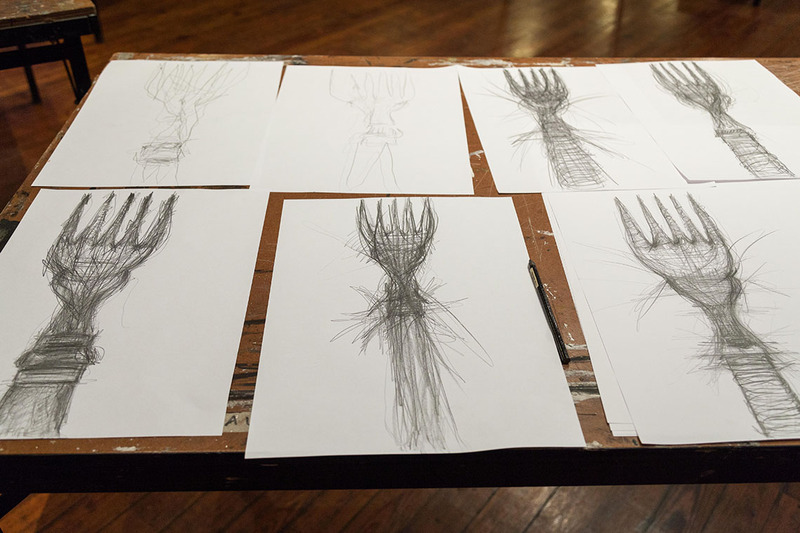 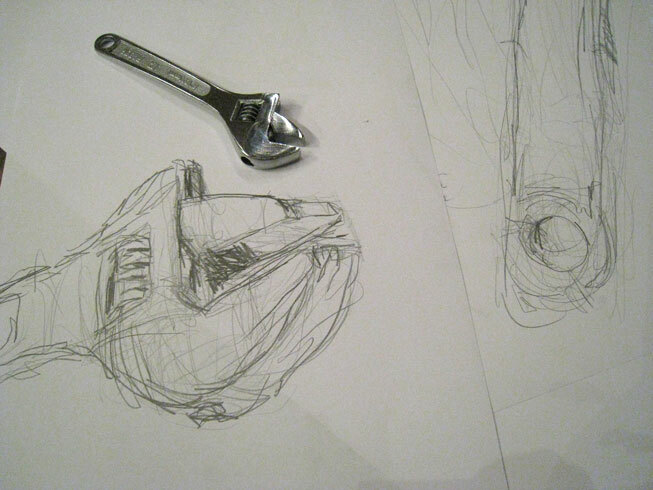 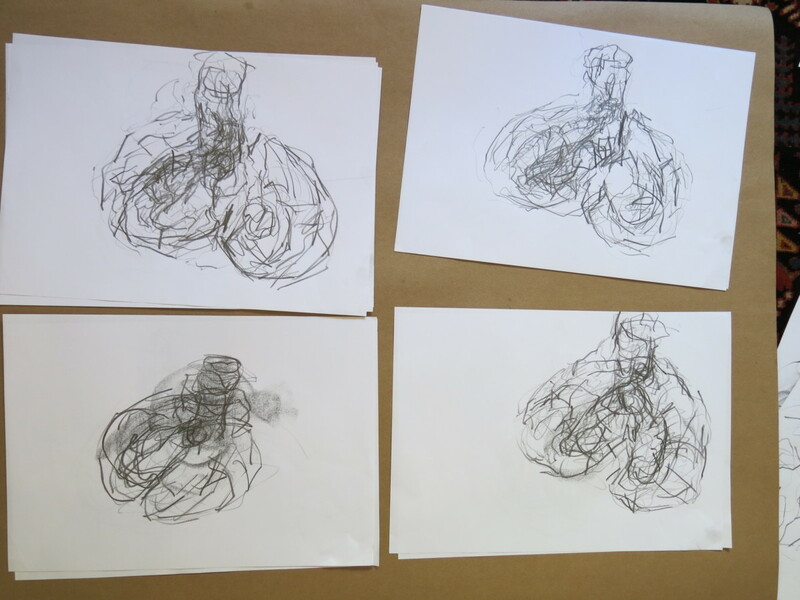 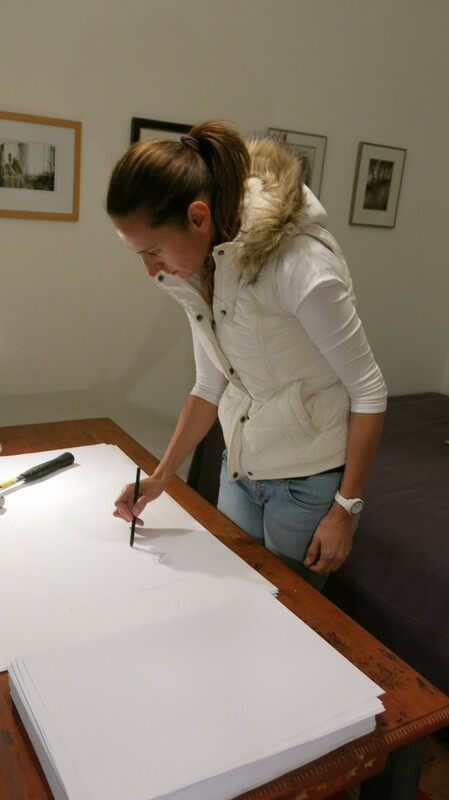 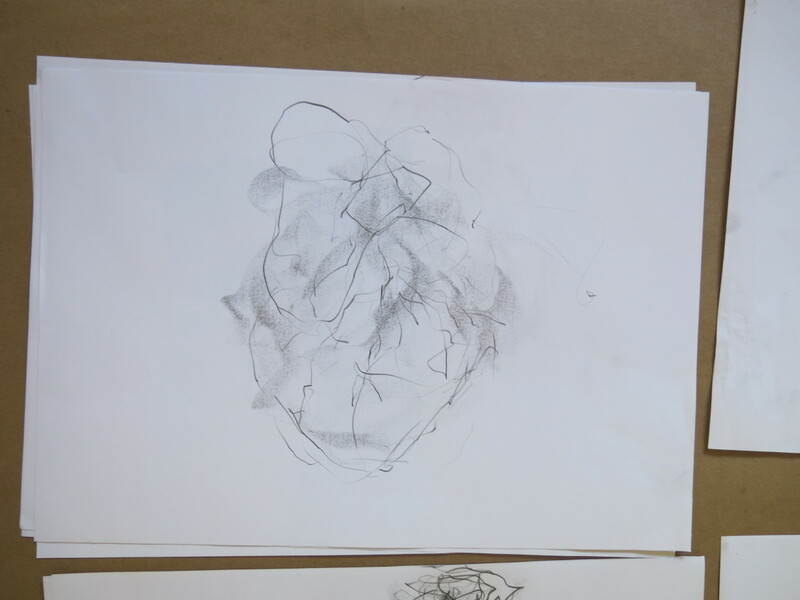 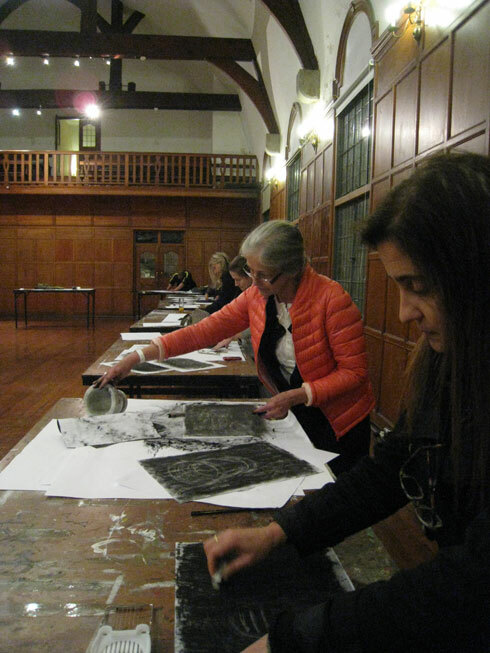 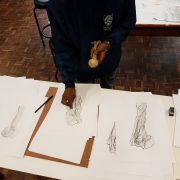 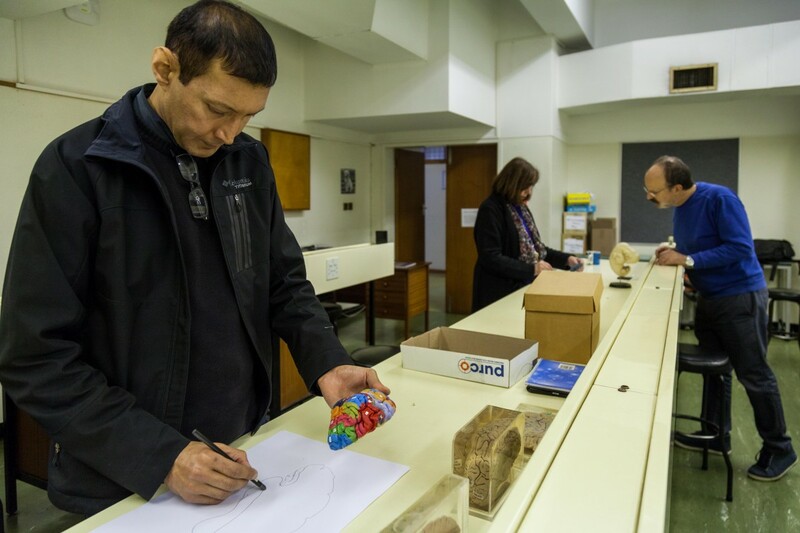 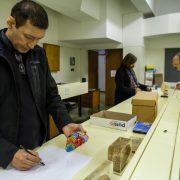 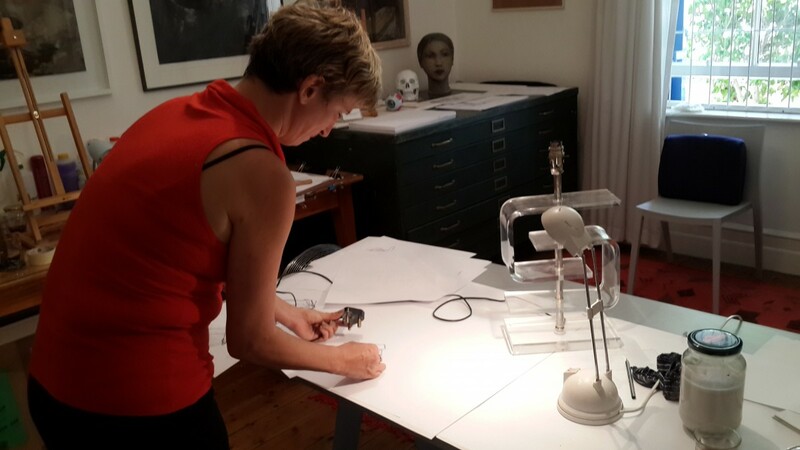 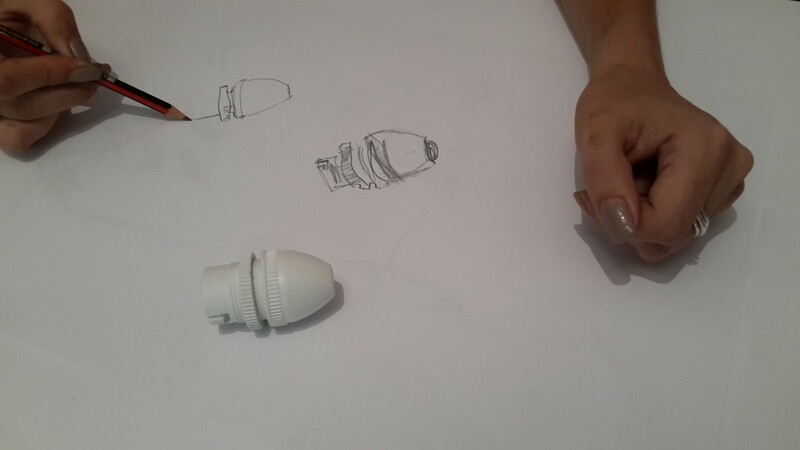 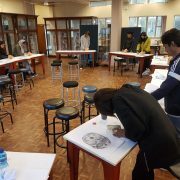 This method of observation through drawing significantly increases the drawers' perceptual understanding of the 3-dimensional form of the object they are drawing. 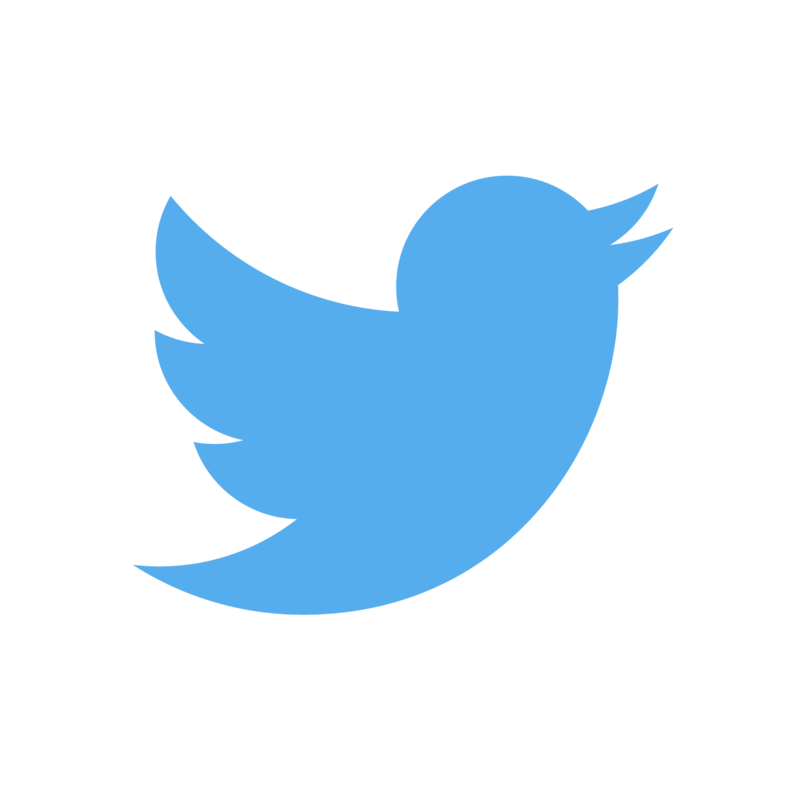 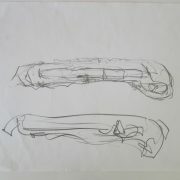 As a consequence, the cognitive memorization of the form of the object takes place. 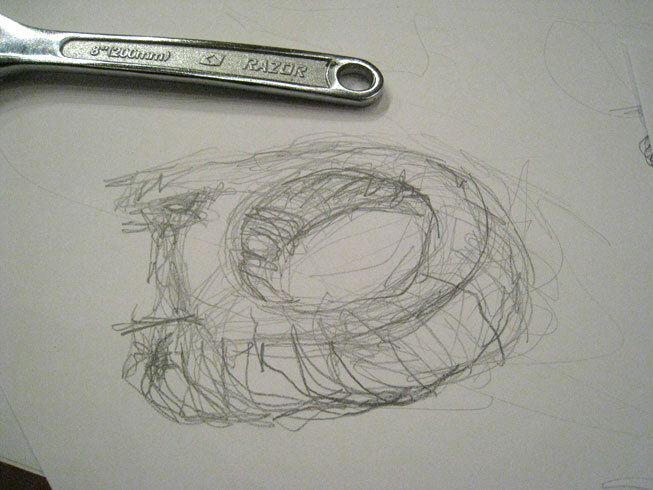 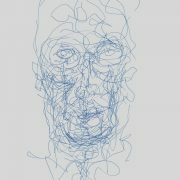 After studying an object through drawing in this way, the drawer-observer is able to retrieve this information directly from their memory without looking at the object. 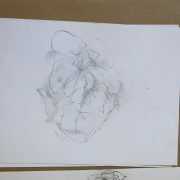 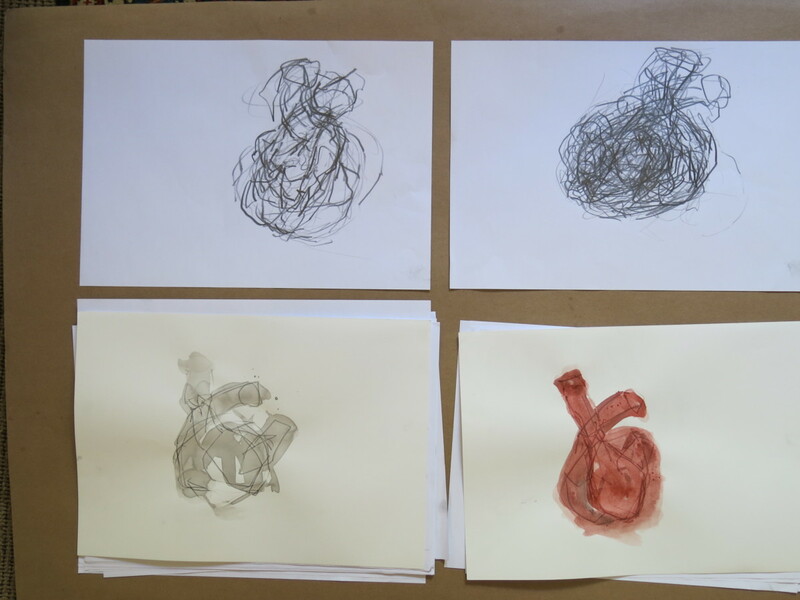 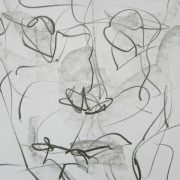 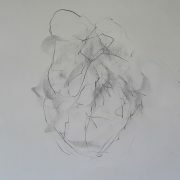 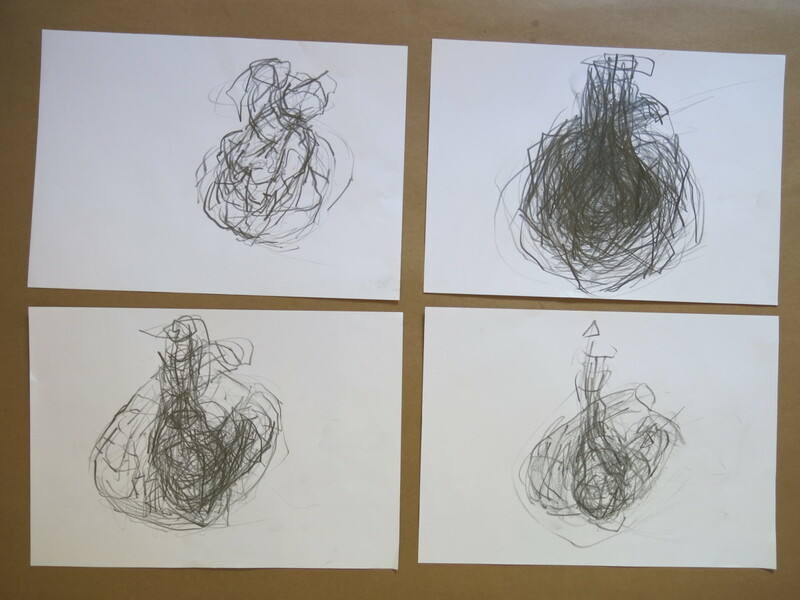 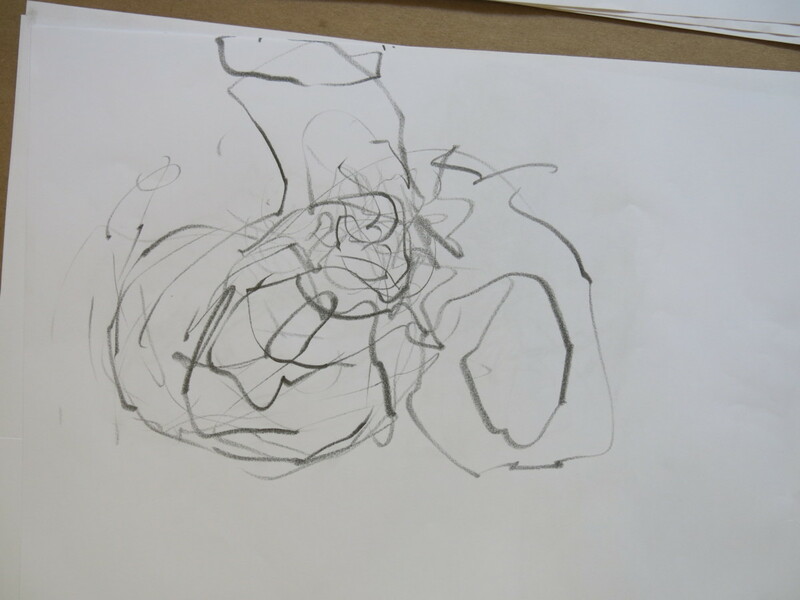 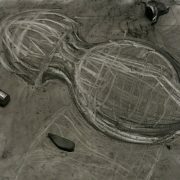 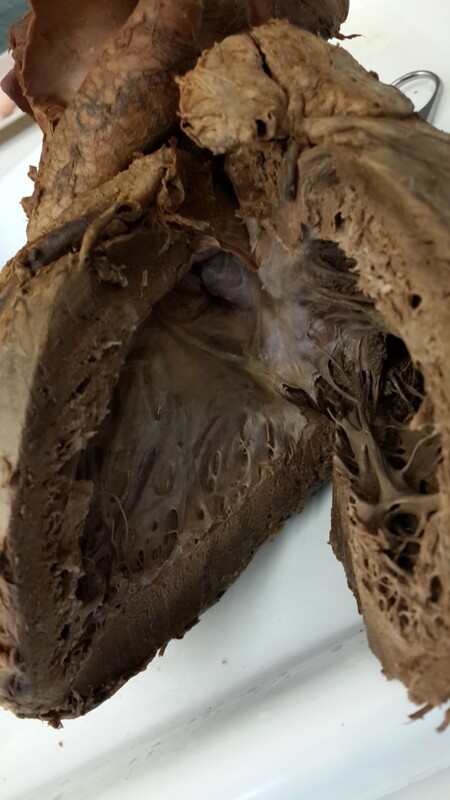 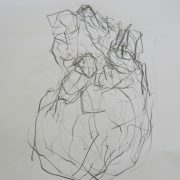 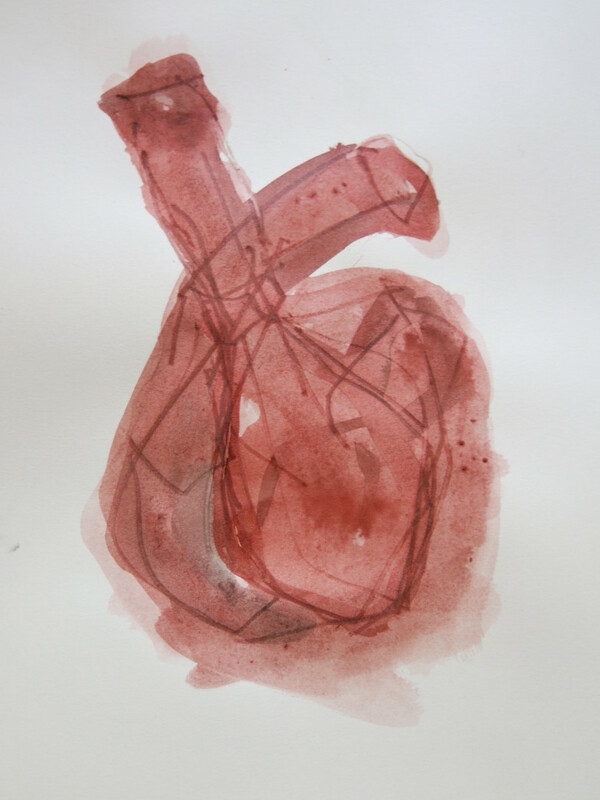 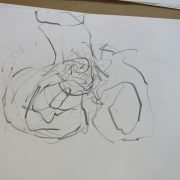 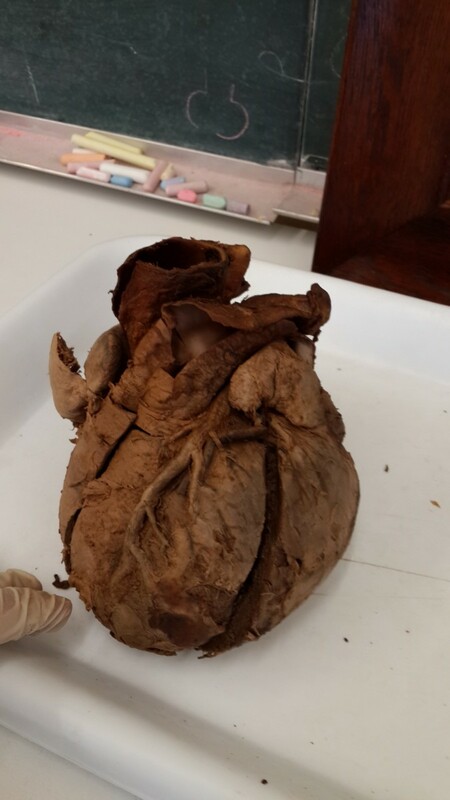 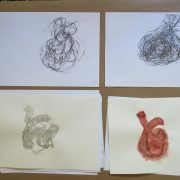 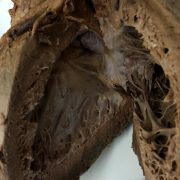 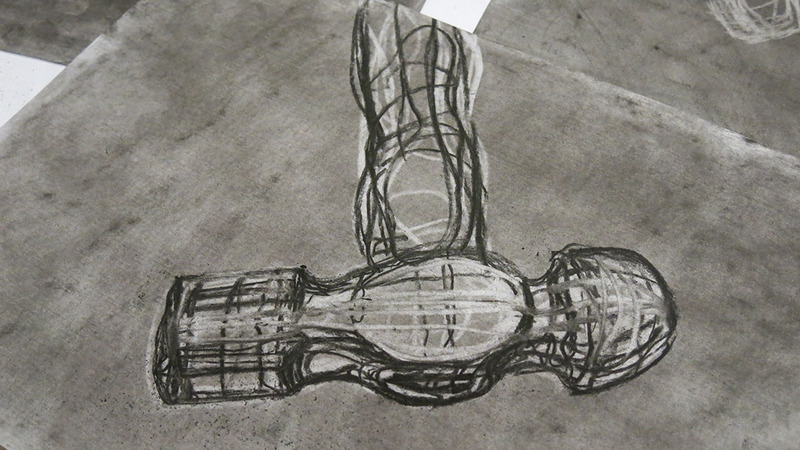 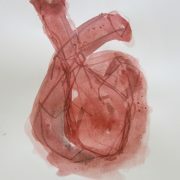 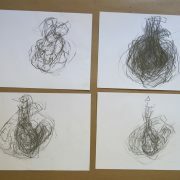 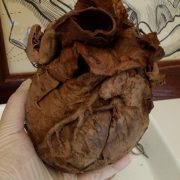 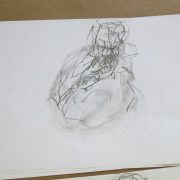 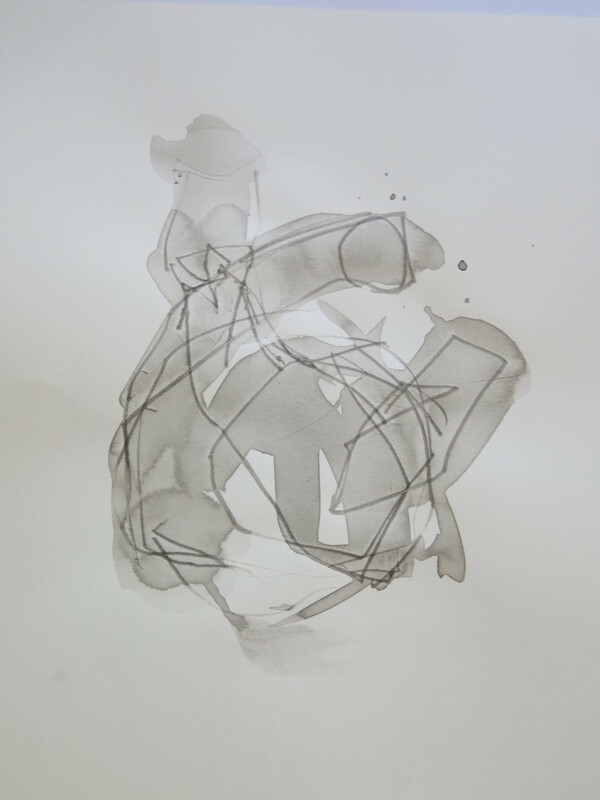 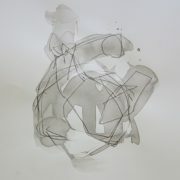 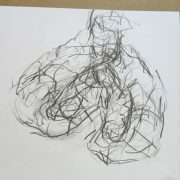 Studies of the human heart by observing and drawing the spaces of the chambers. 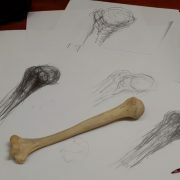 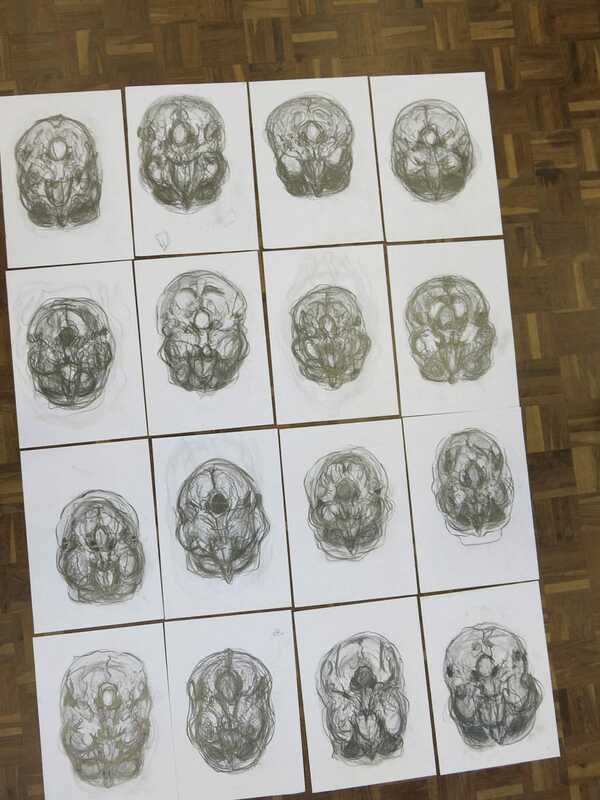 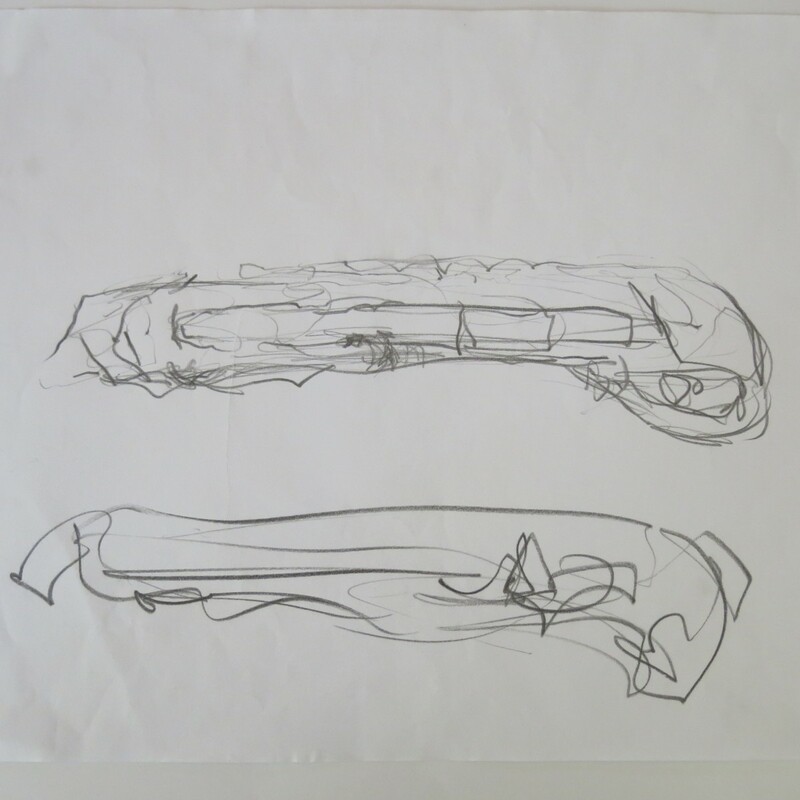 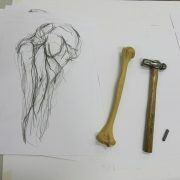 Studies of skeleton. 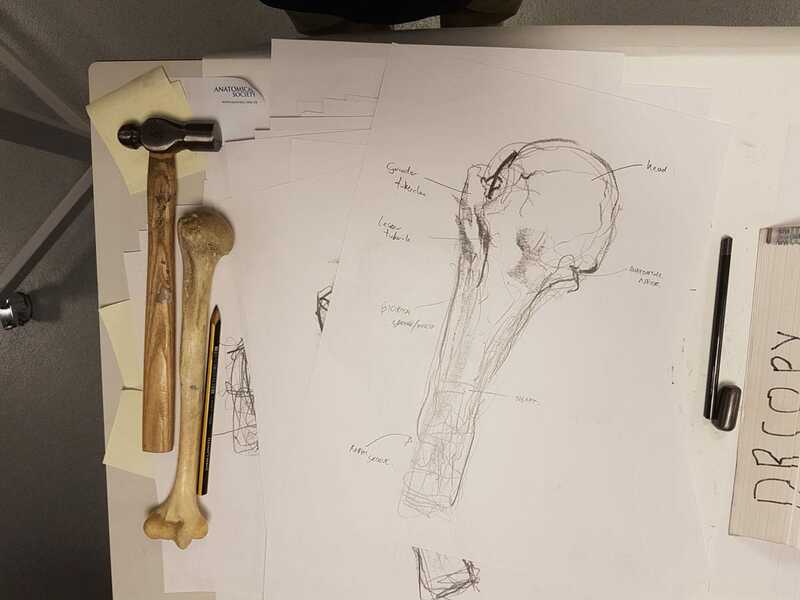 Note the annotation of the humerus drawings according to illustrations in an anatomy atlas. 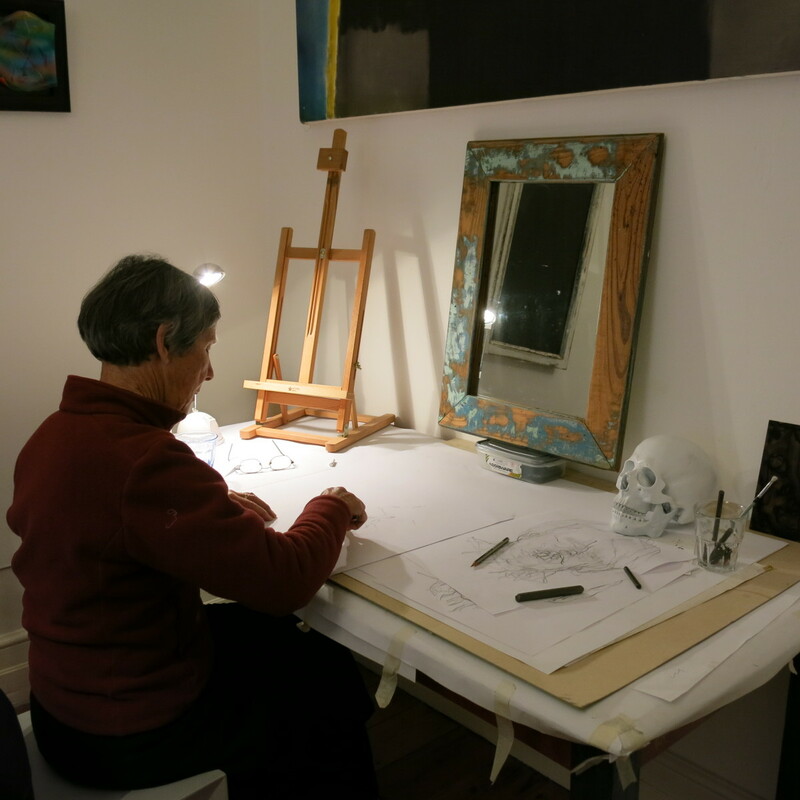 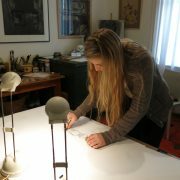 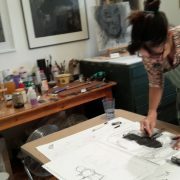 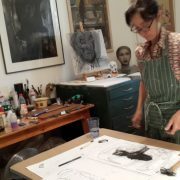 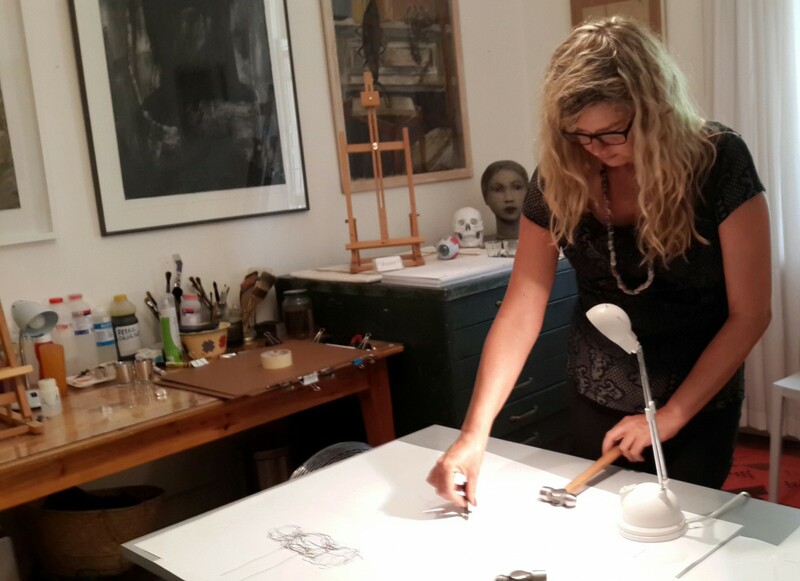 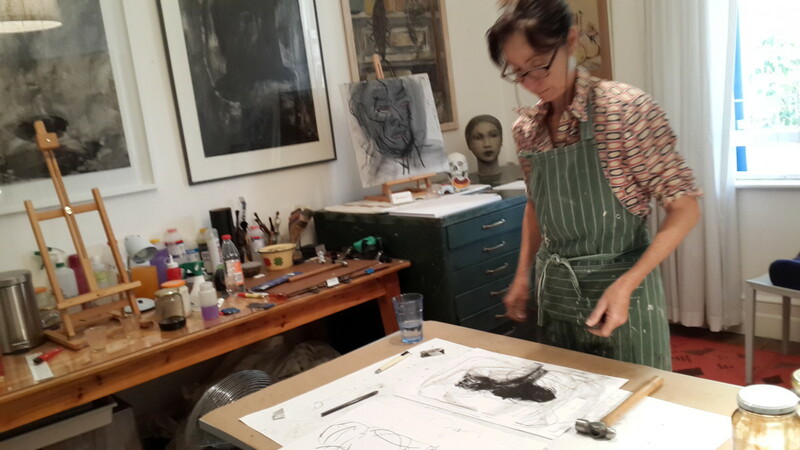 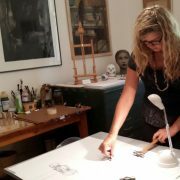 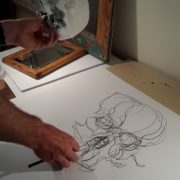 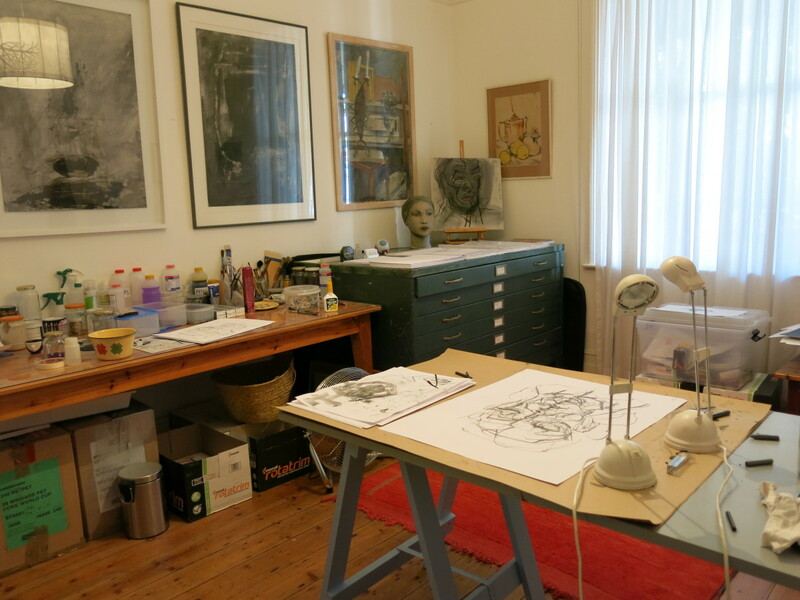 One-on-one tuition at my drawing studio. 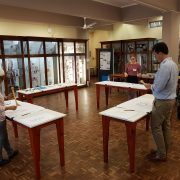 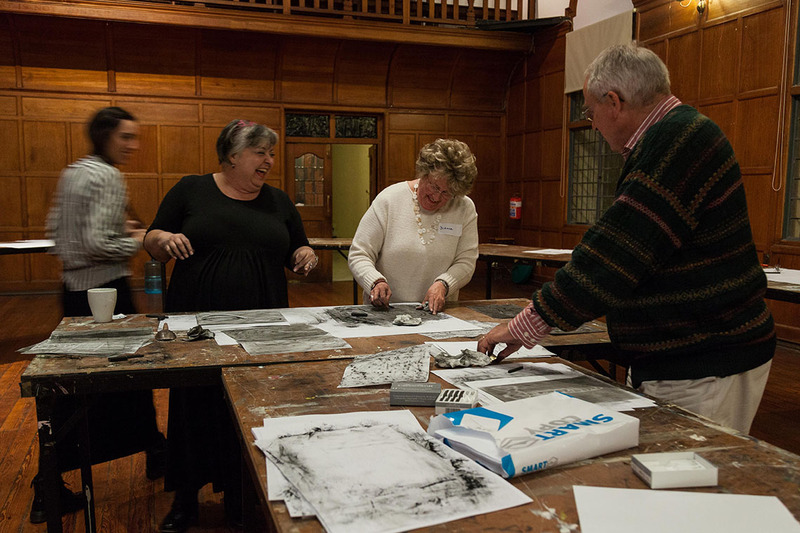 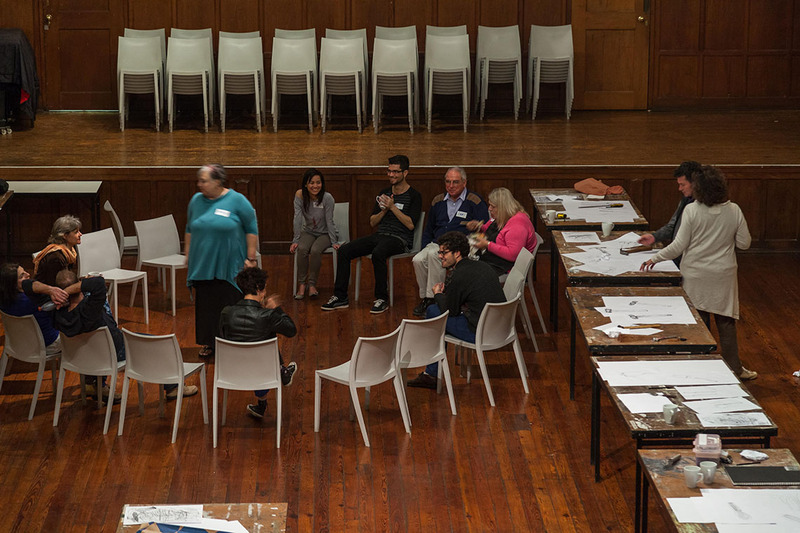 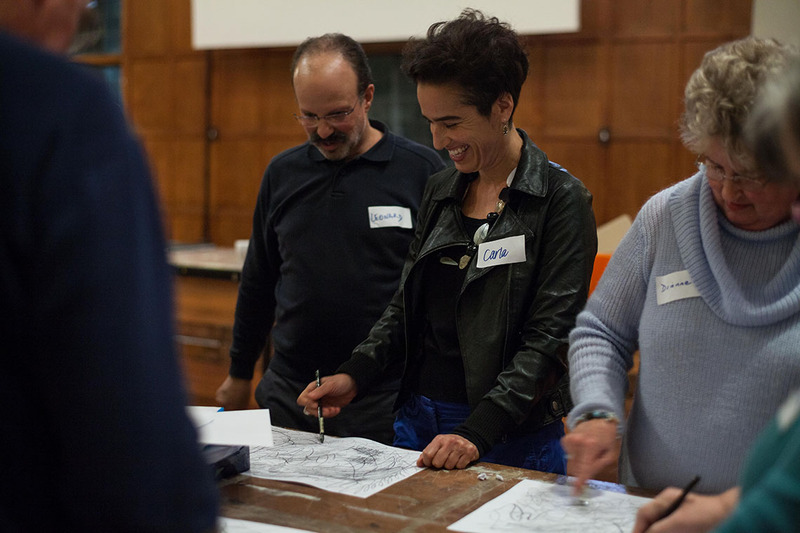 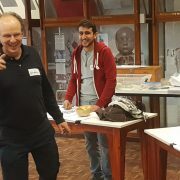 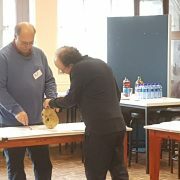 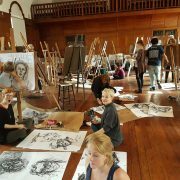 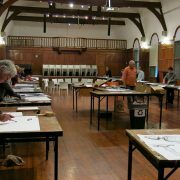 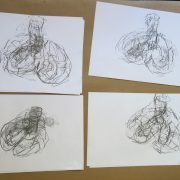 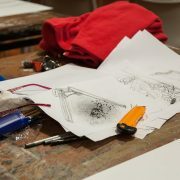 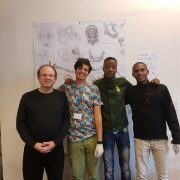 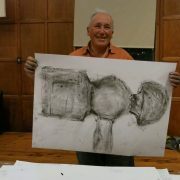 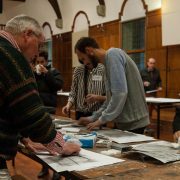 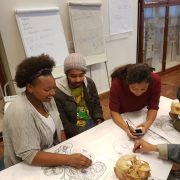 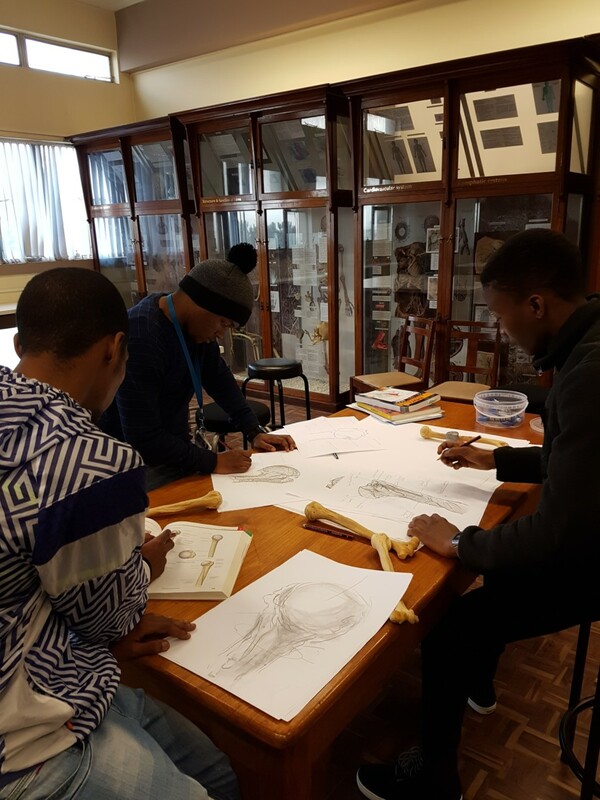 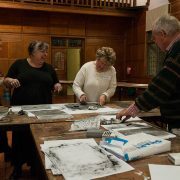 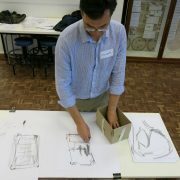 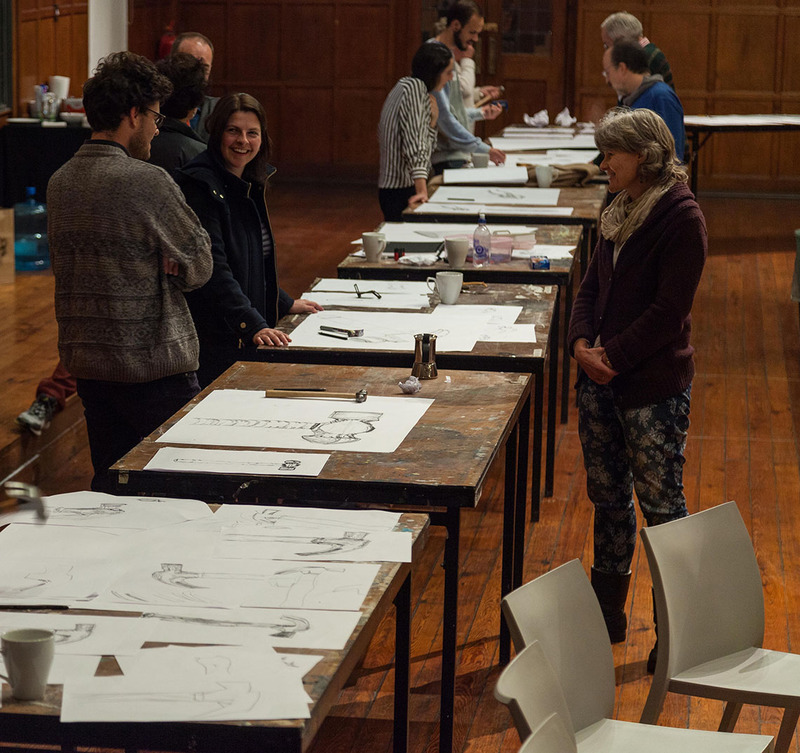 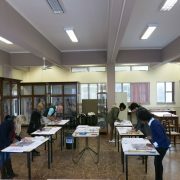 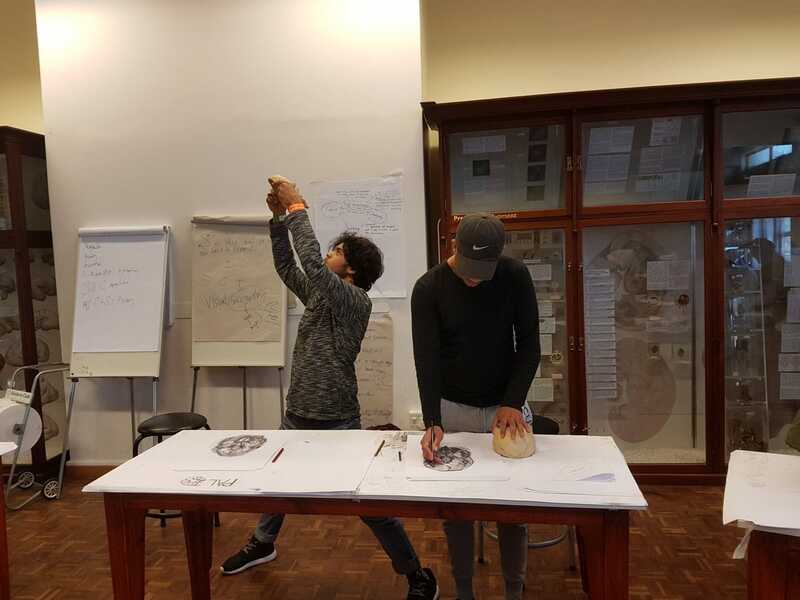 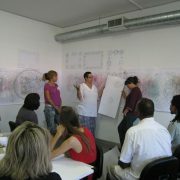 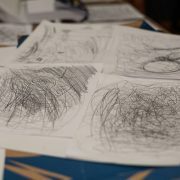 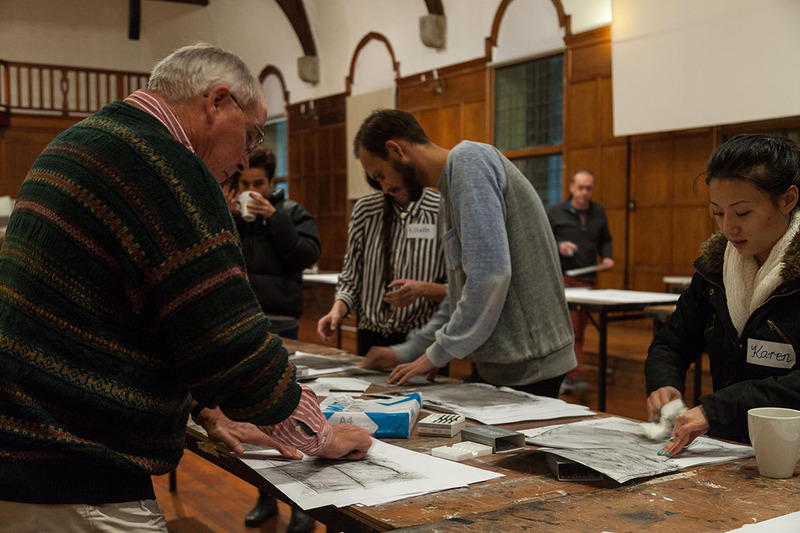 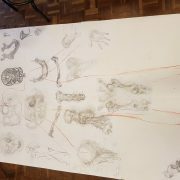 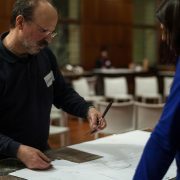 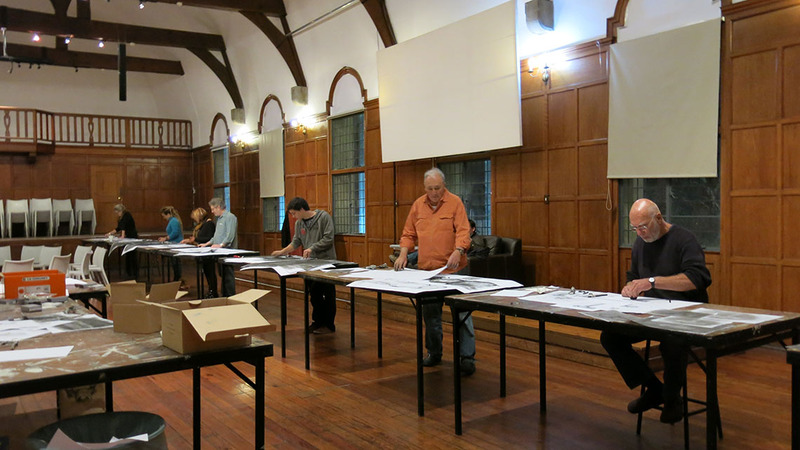 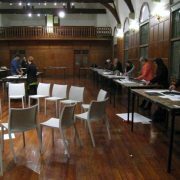 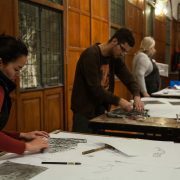 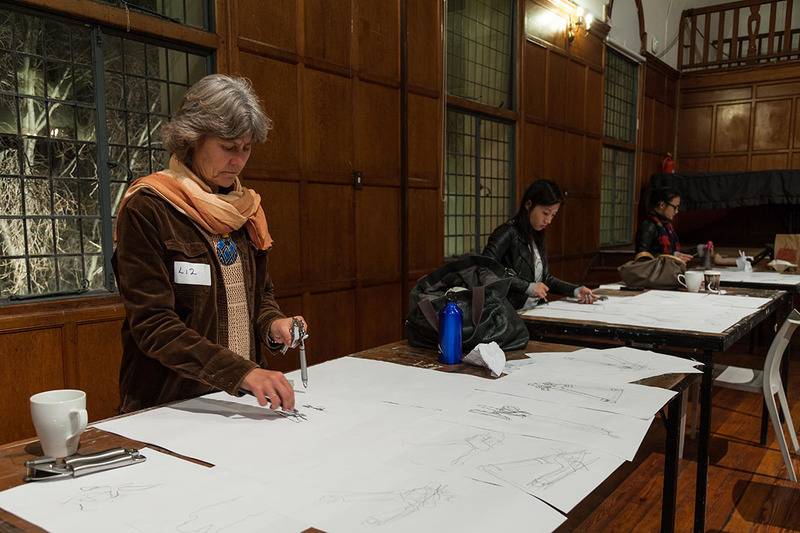 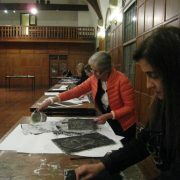 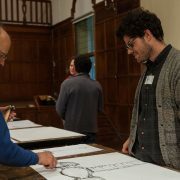 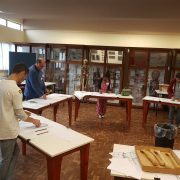 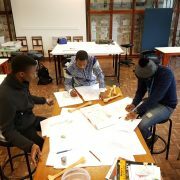 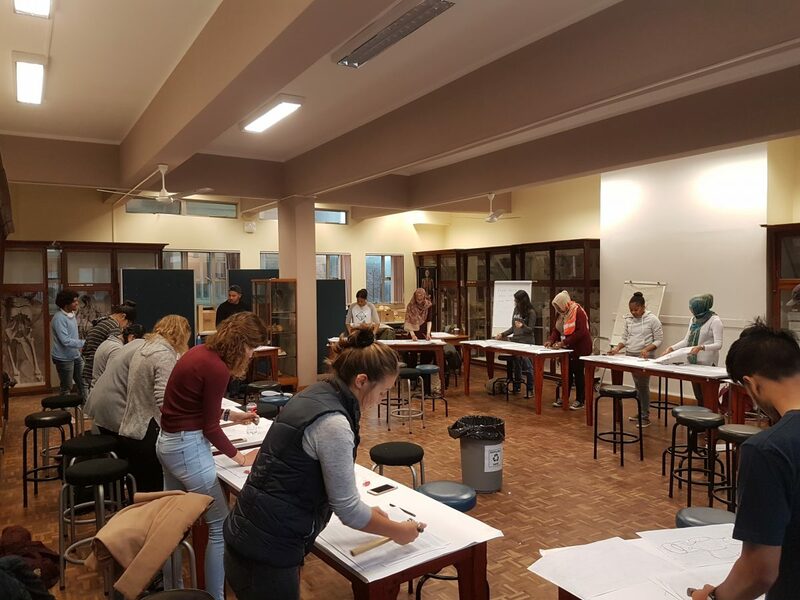 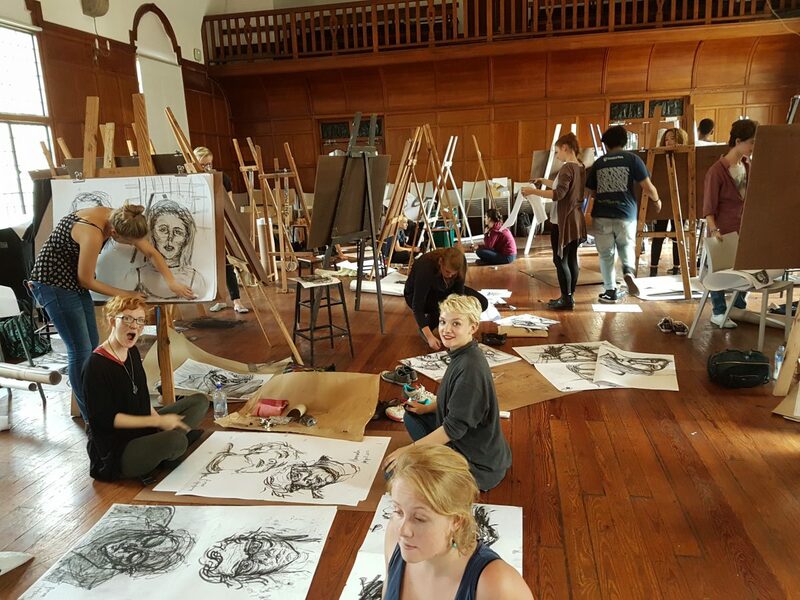 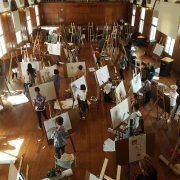 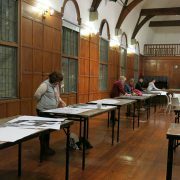 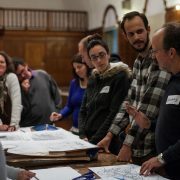 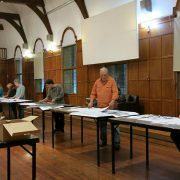 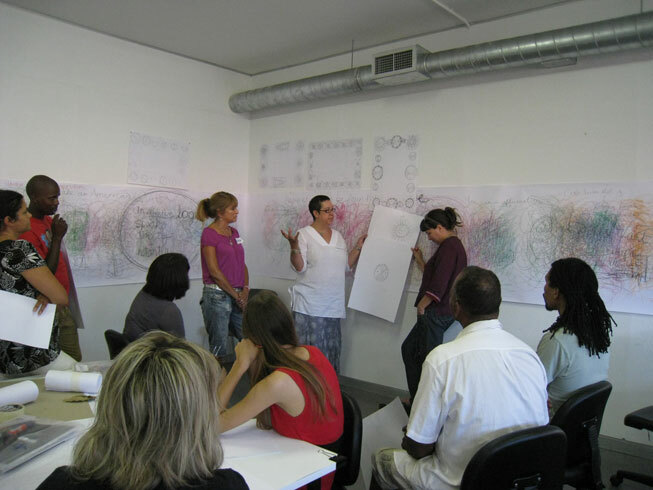 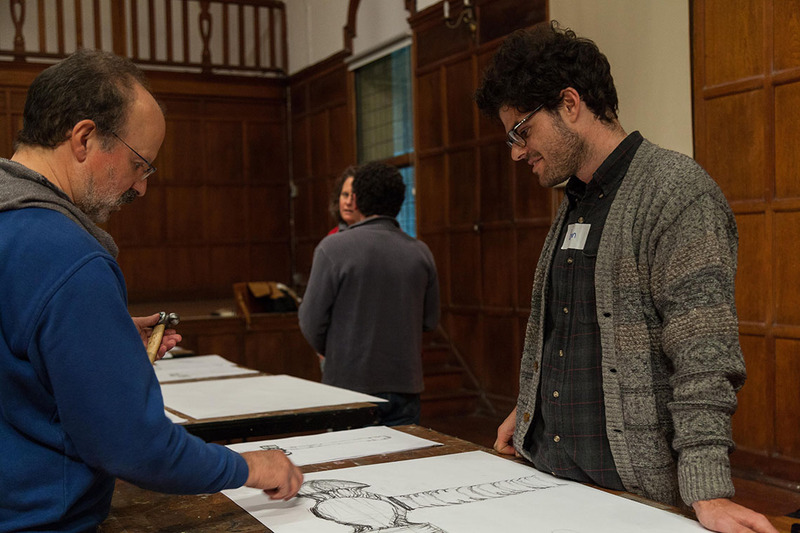 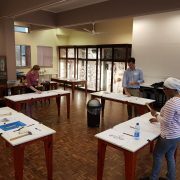 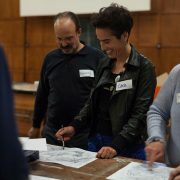 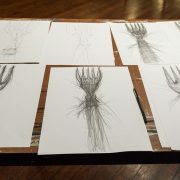 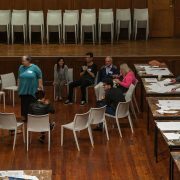 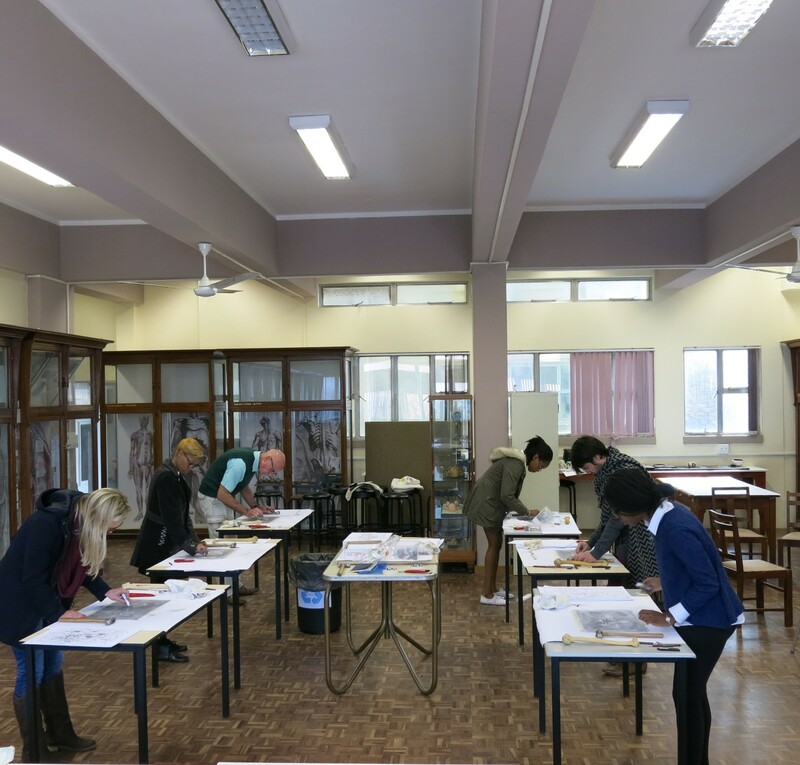 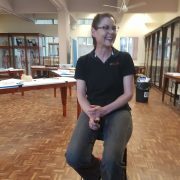 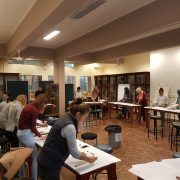 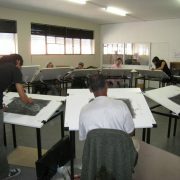 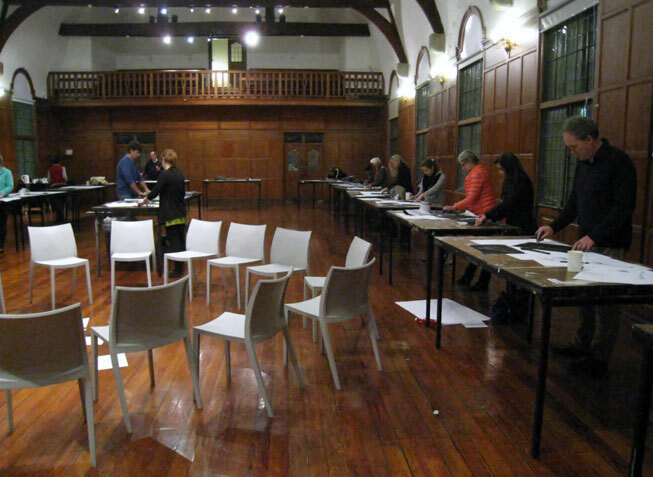 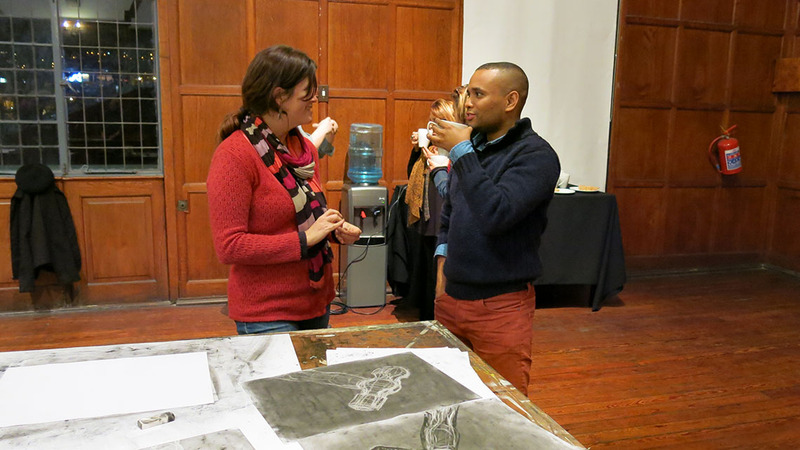 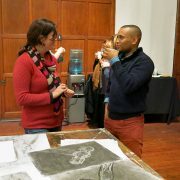 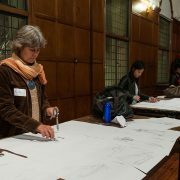 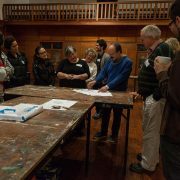 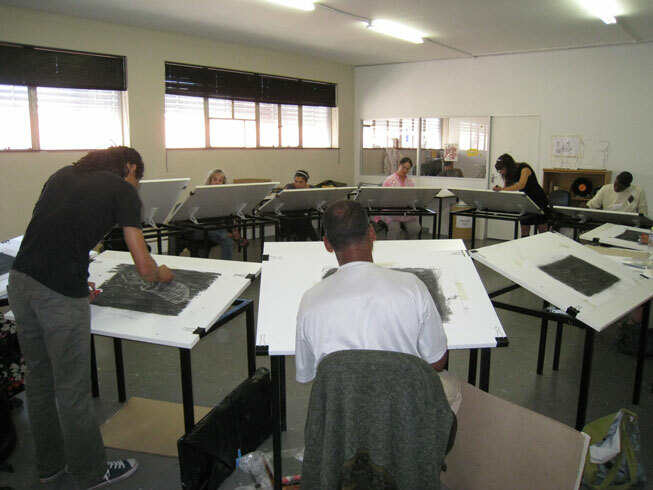 Group Drawing Workshops. 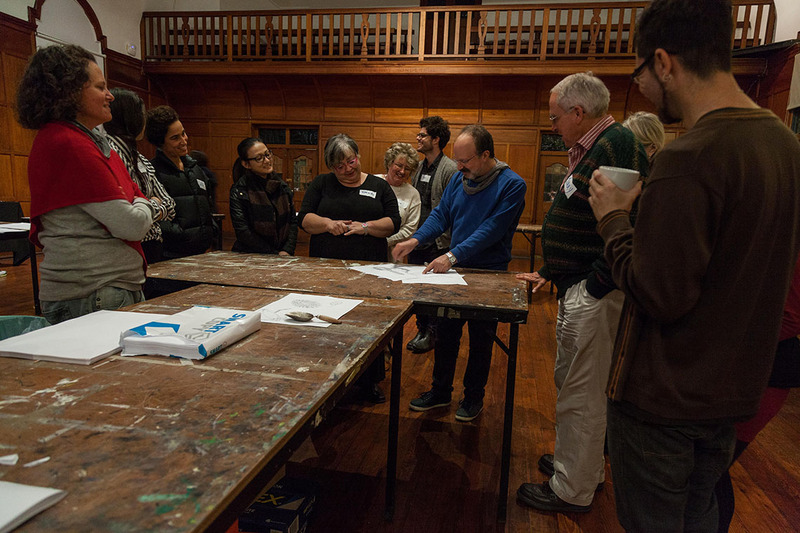 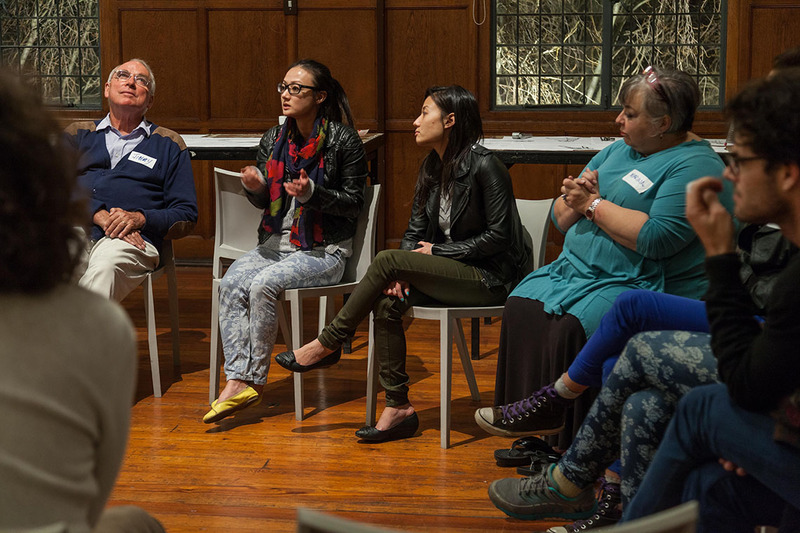 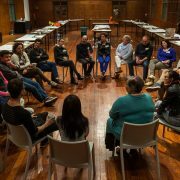 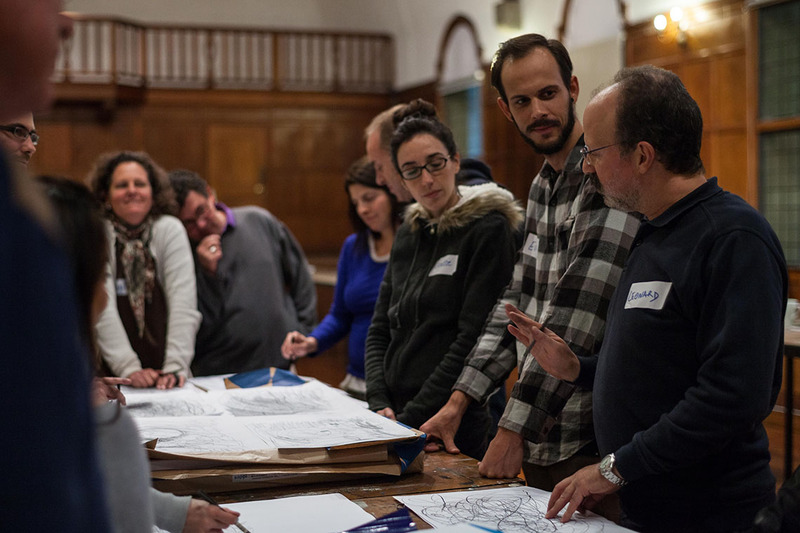 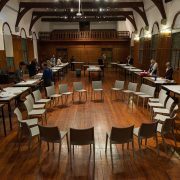 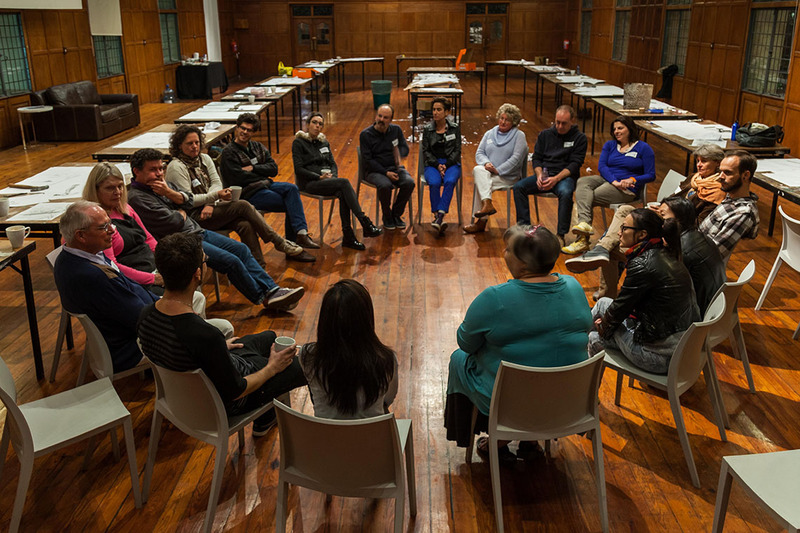 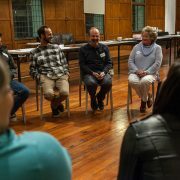 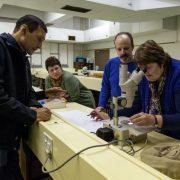 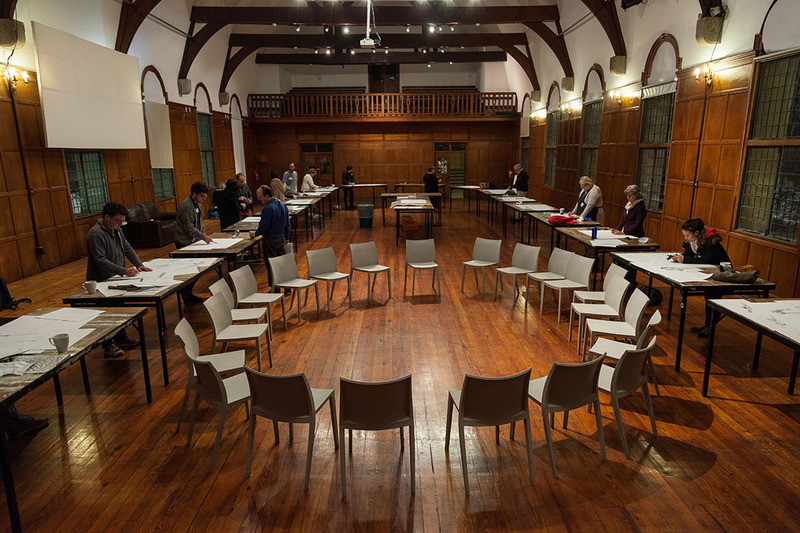 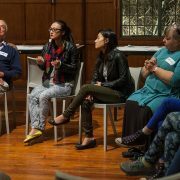 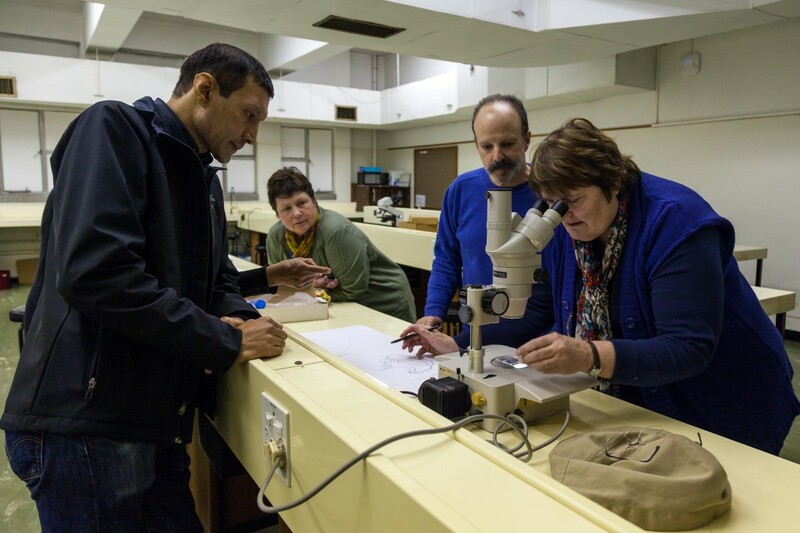 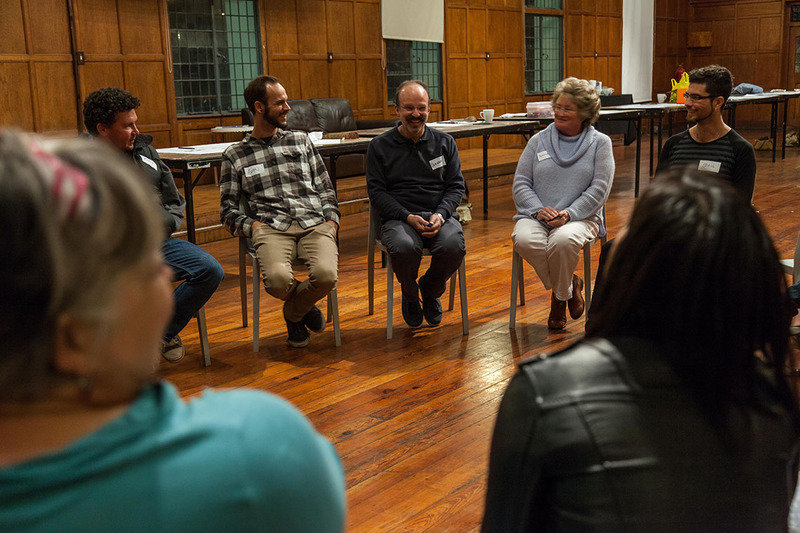 These workshops cater to a maximum of 20 people and a minimum of 5. 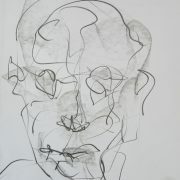 Portrait Drawing. 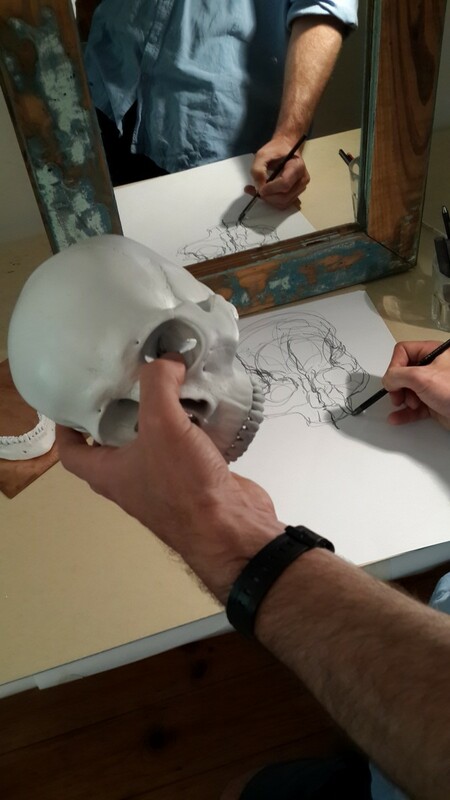 The skull, muscle and cartilage is under the skin of your face and forms an integral part of your face. 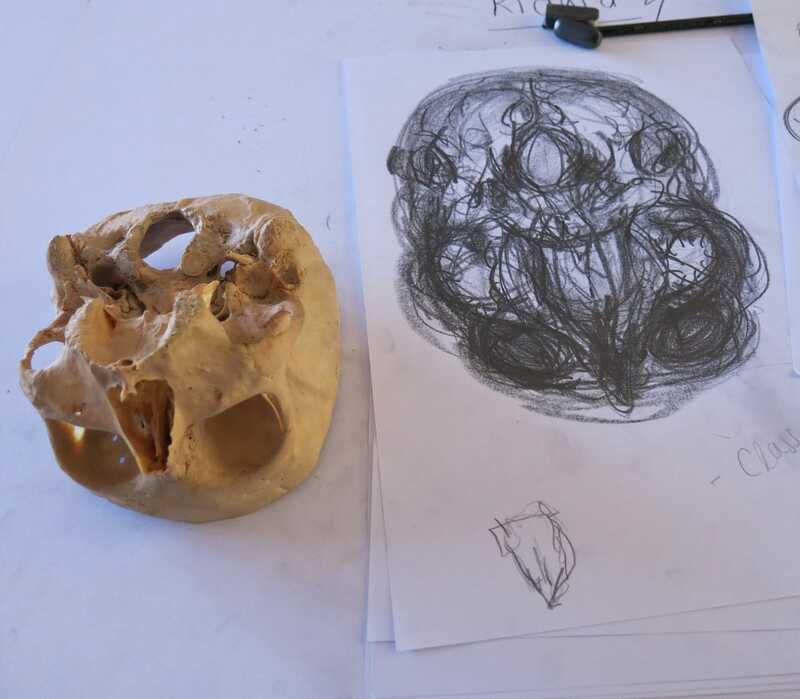 You can feel the bone under the skin when you press around the orbits of the eyes, for example. 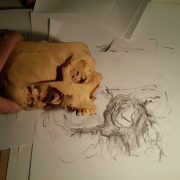 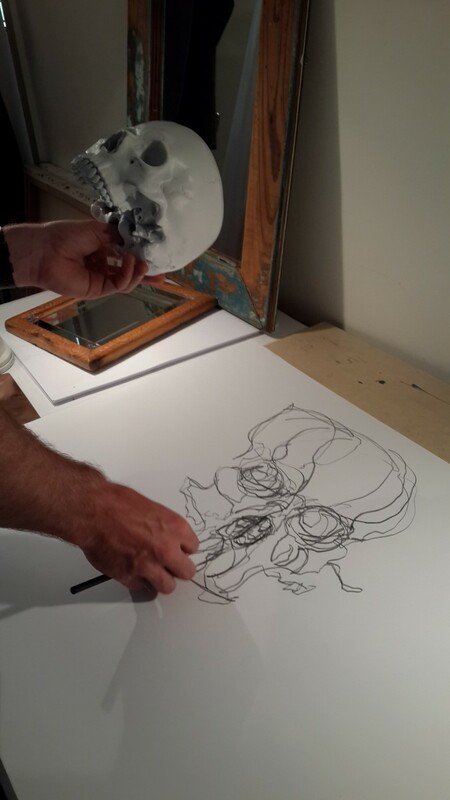 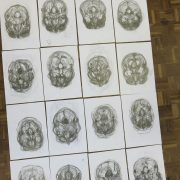 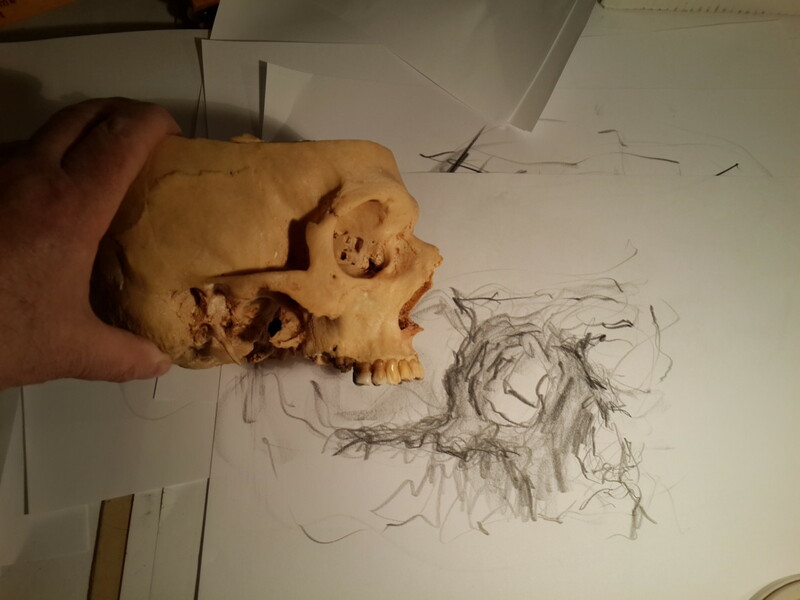 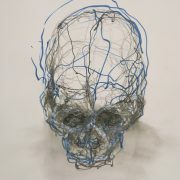 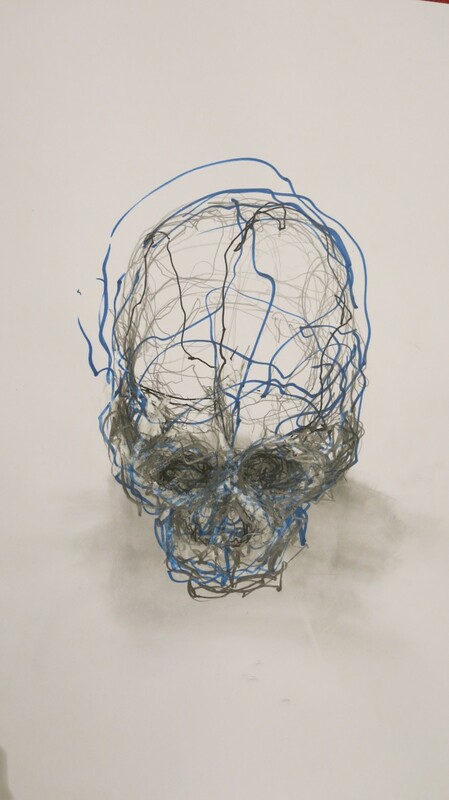 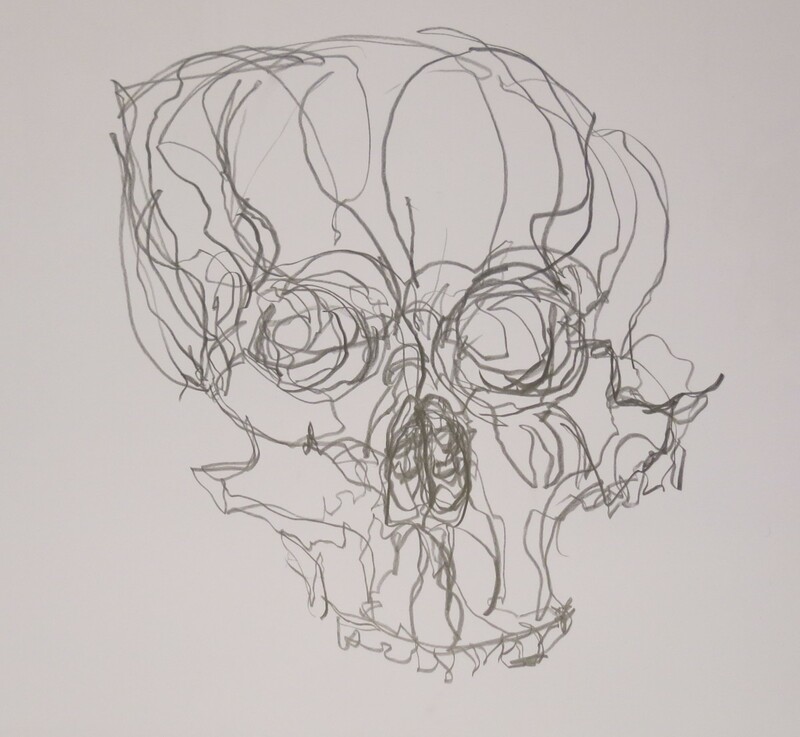 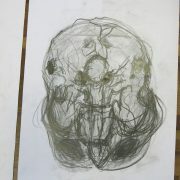 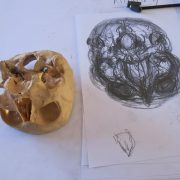 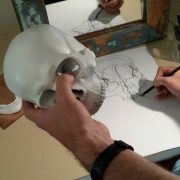 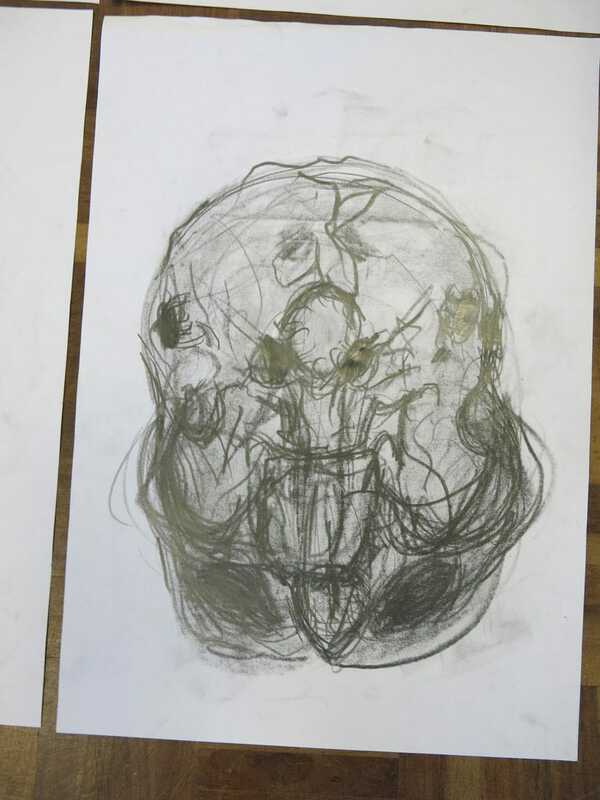 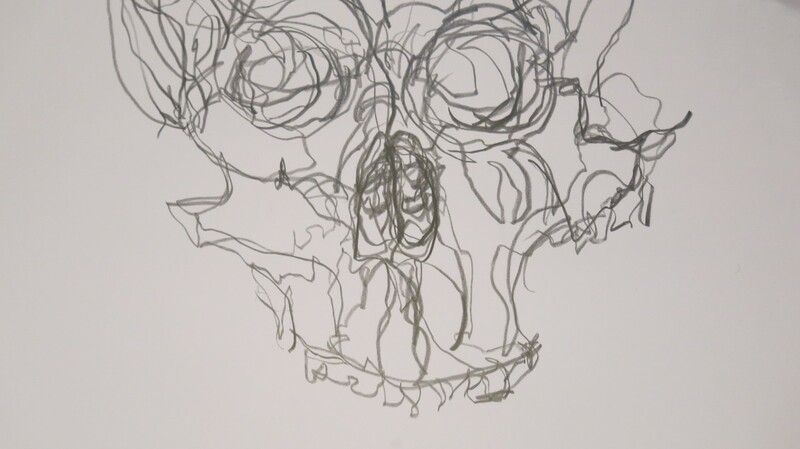 So, it makes sense to look at and draw a skull first in order to understand what is under your skin. 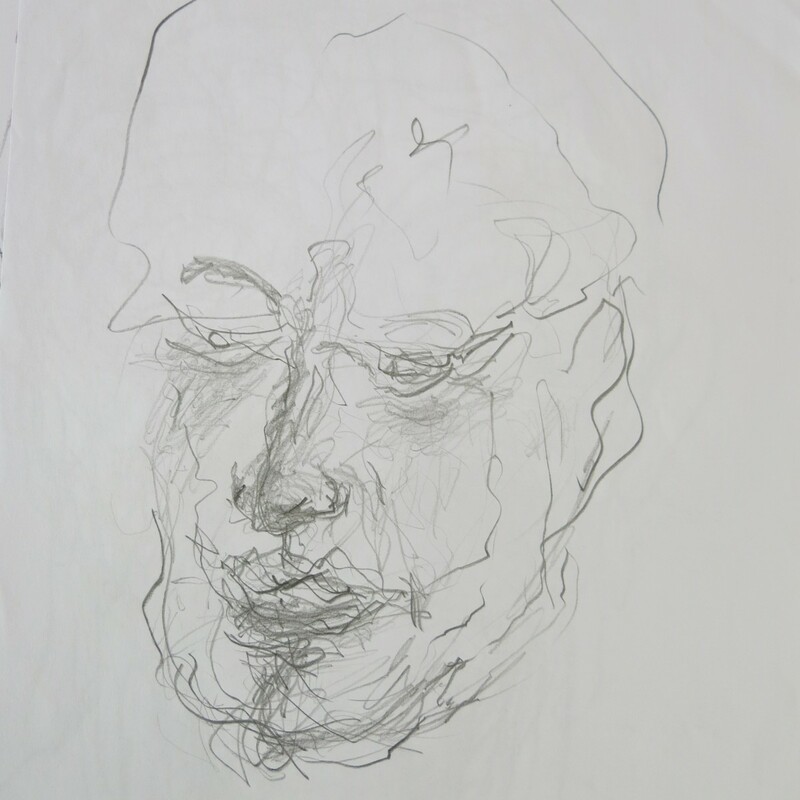 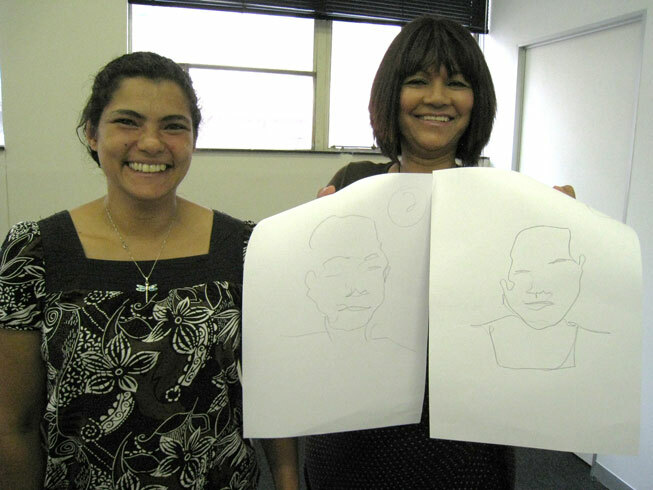 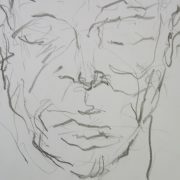 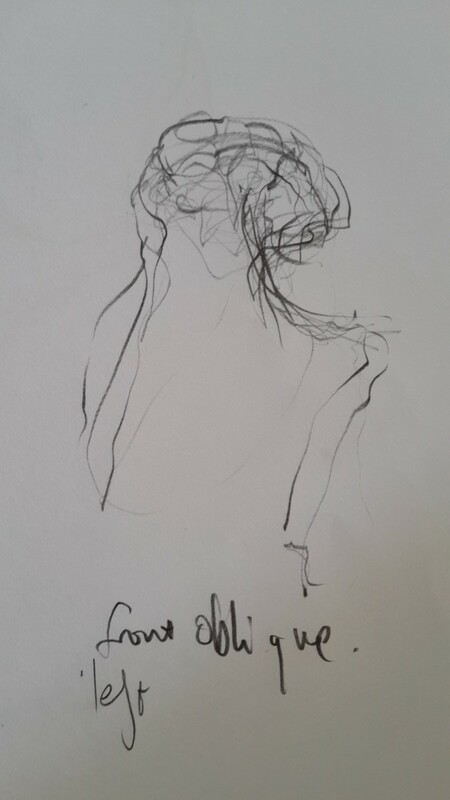 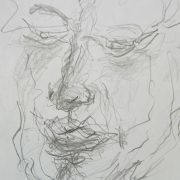 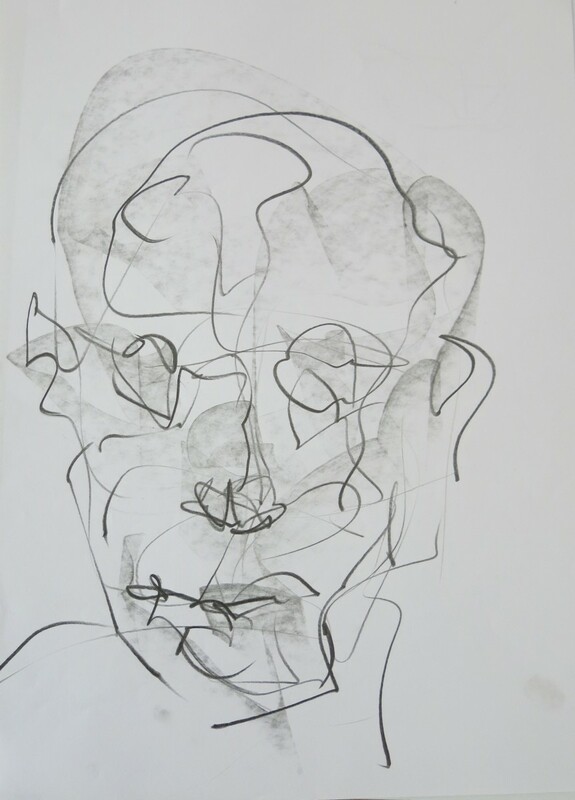 As a result, your portrait drawing will be far more informed and convincing. 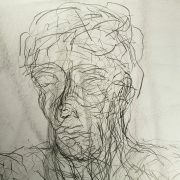 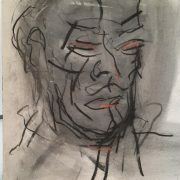 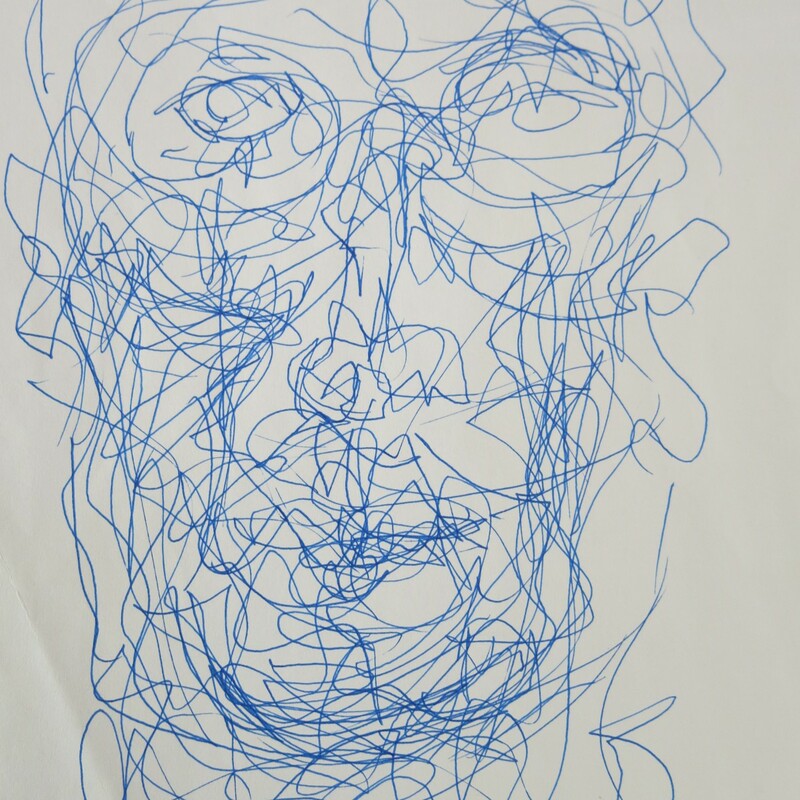 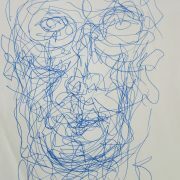 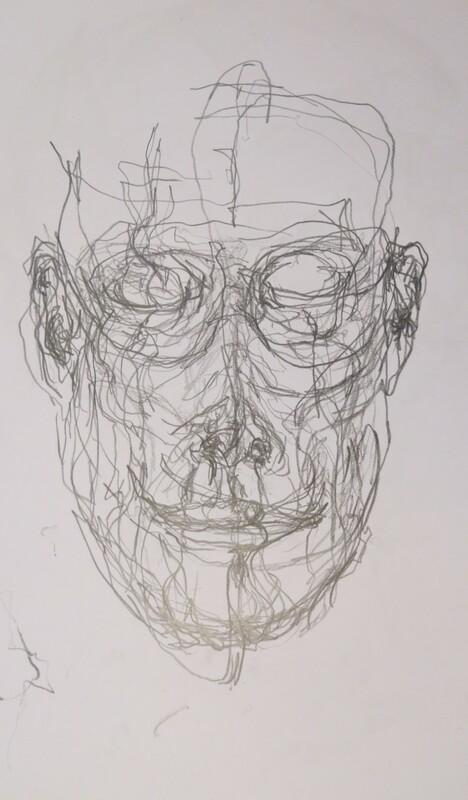 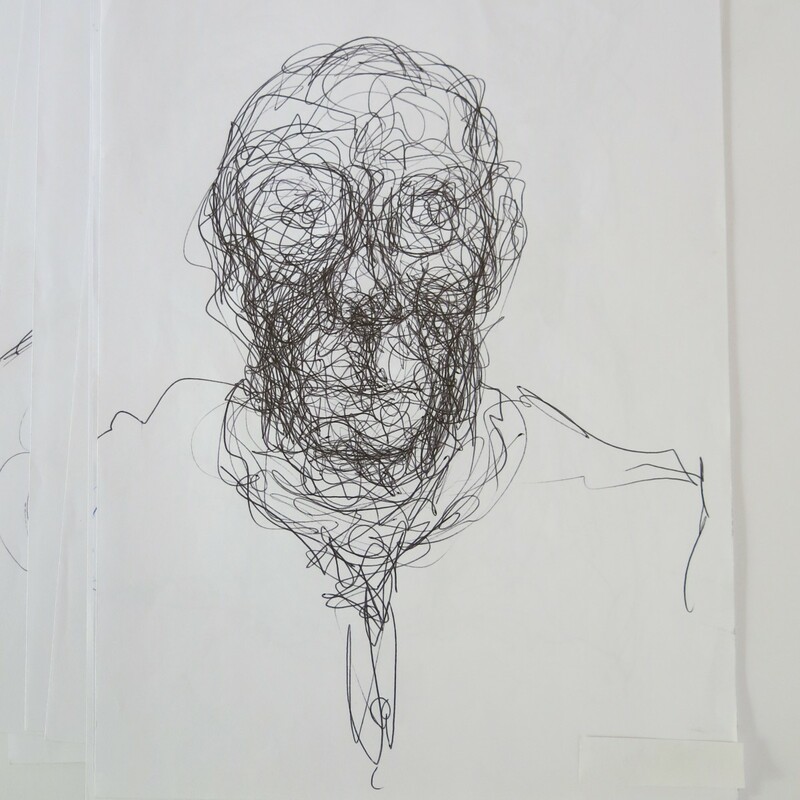 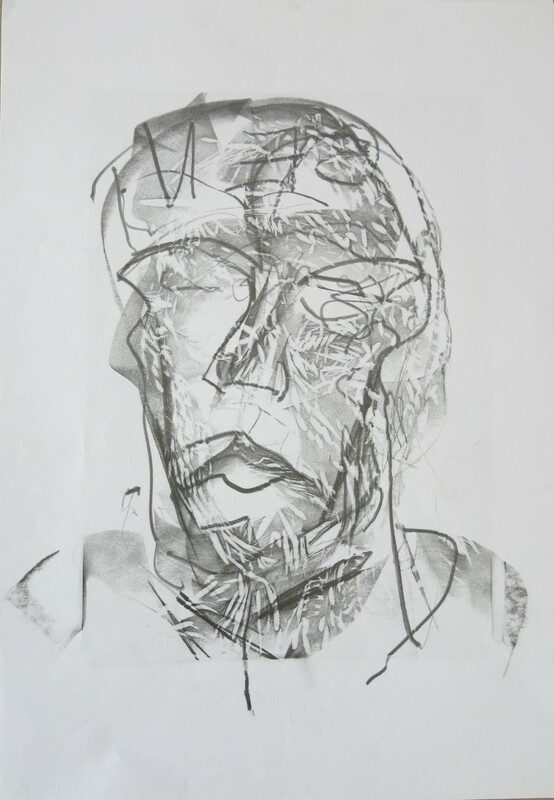 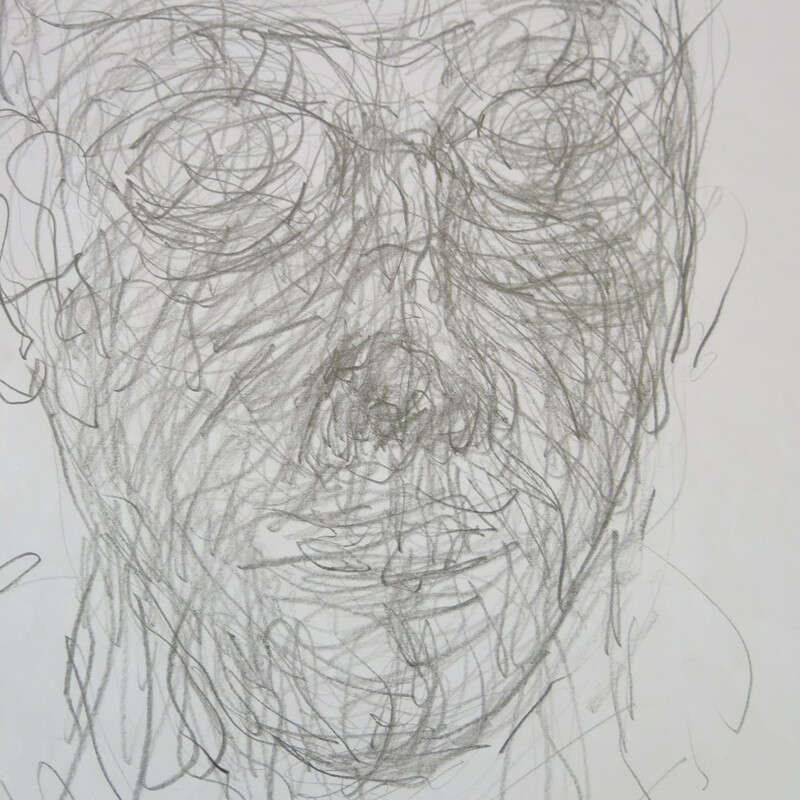 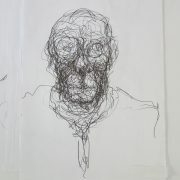 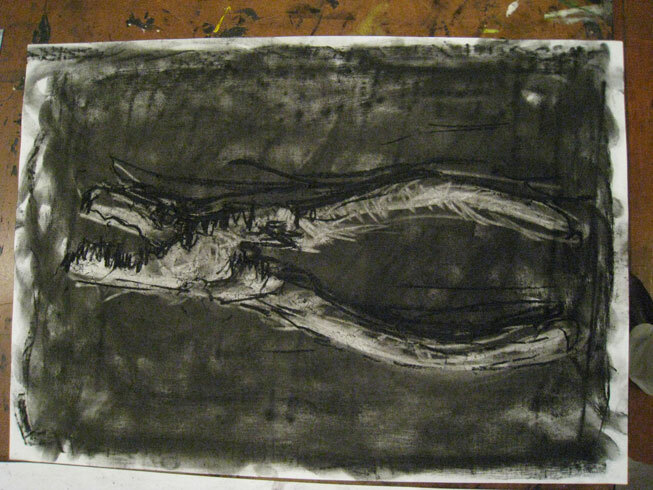 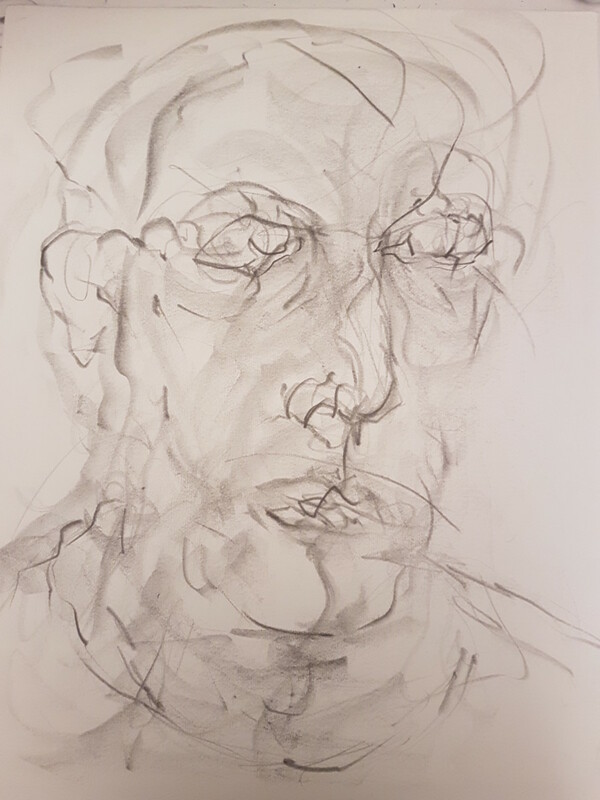 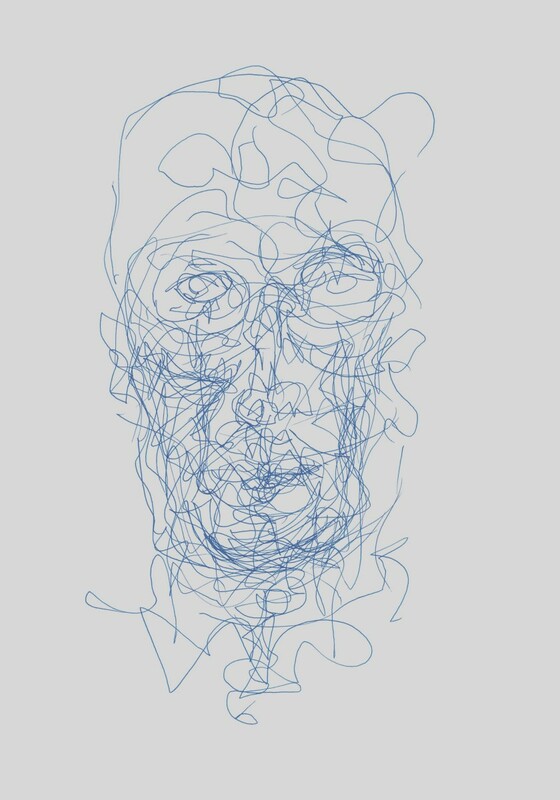 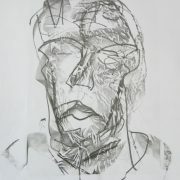 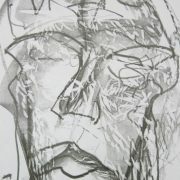 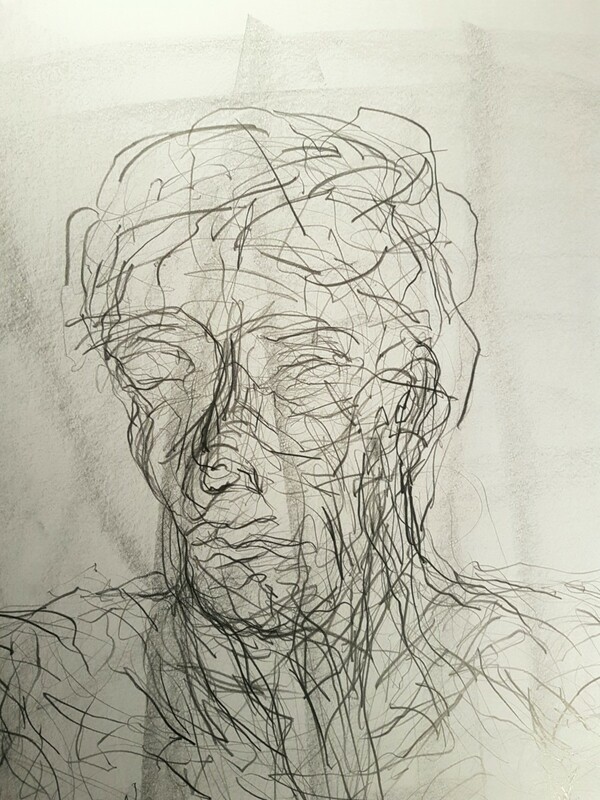 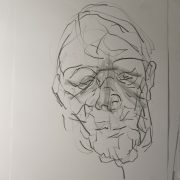 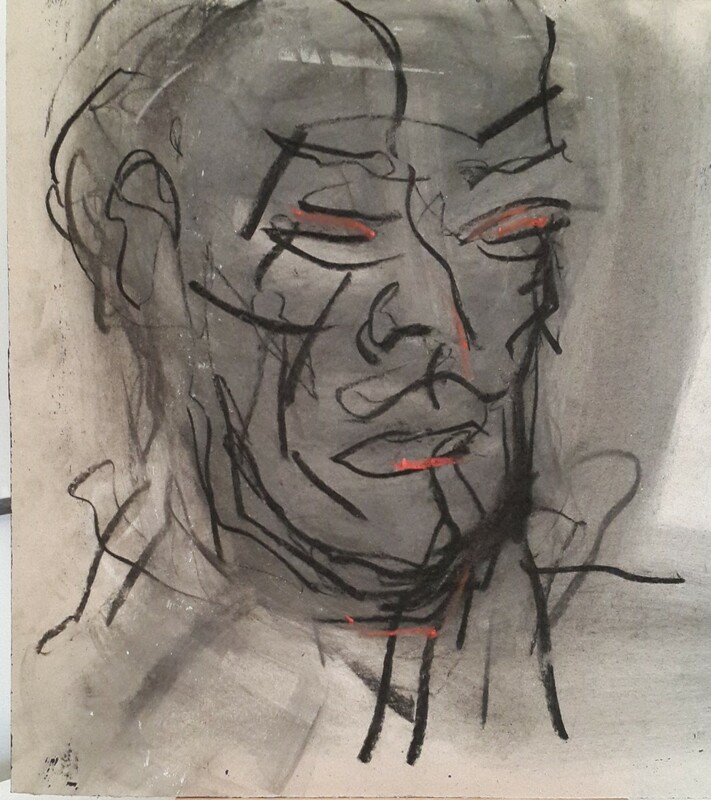 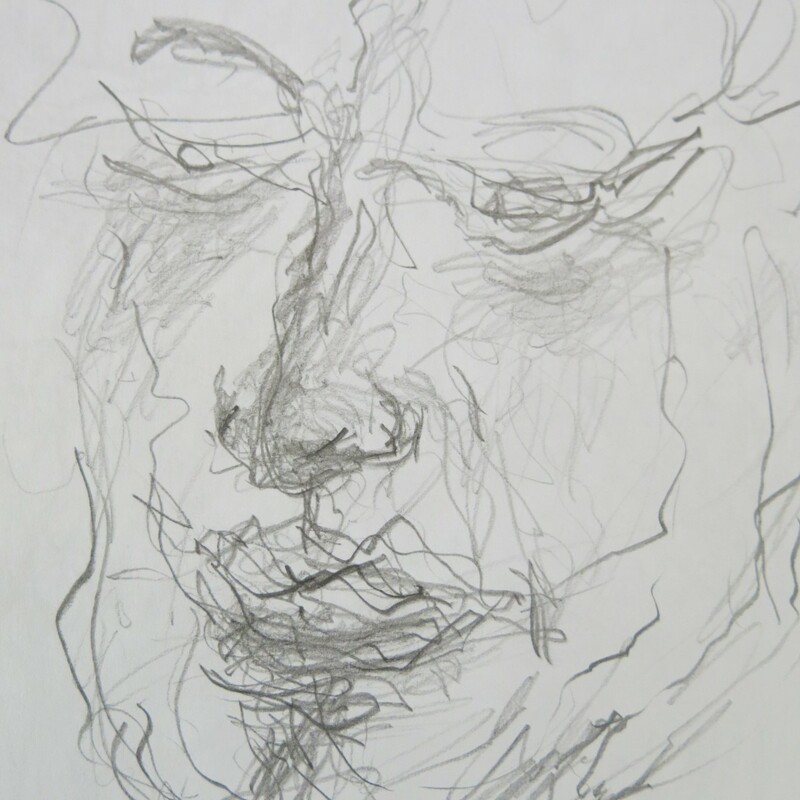 Alberto Giacometti is a very good example of an artist who draws portraits in this way. 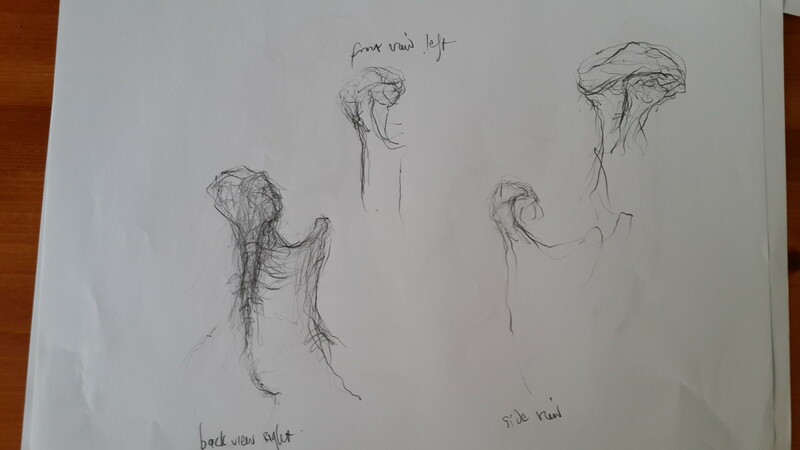 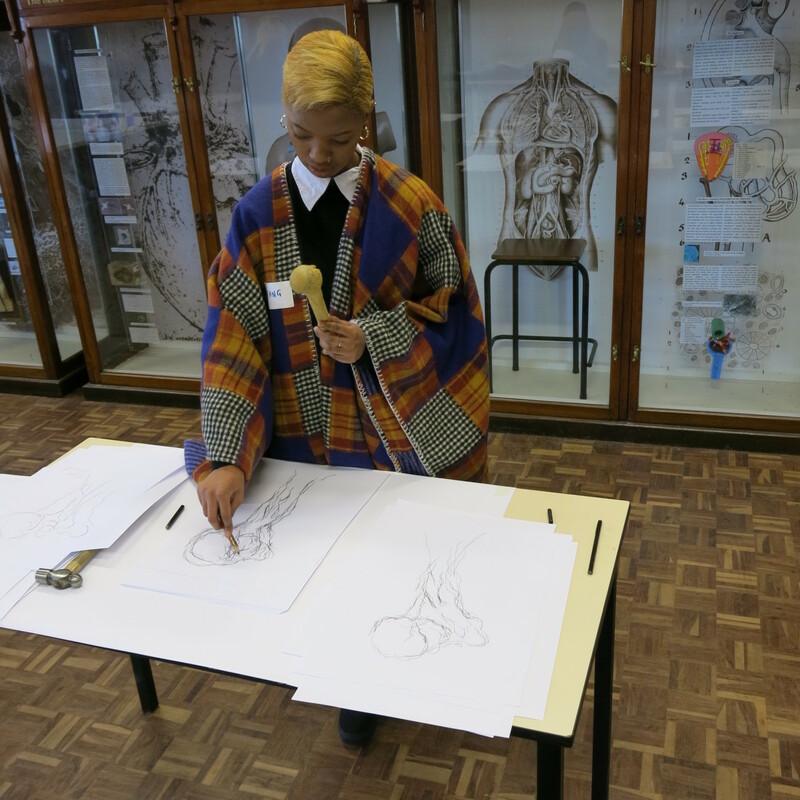 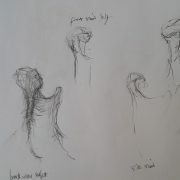 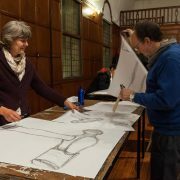 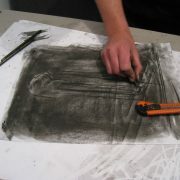 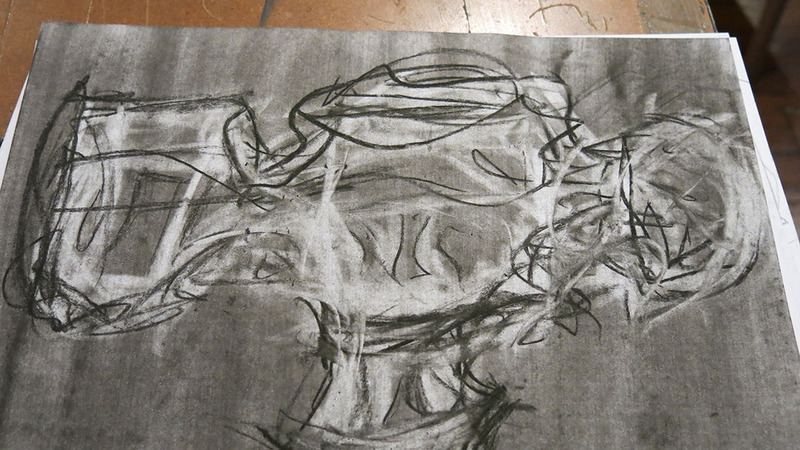 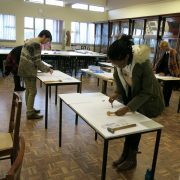 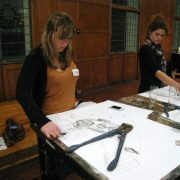 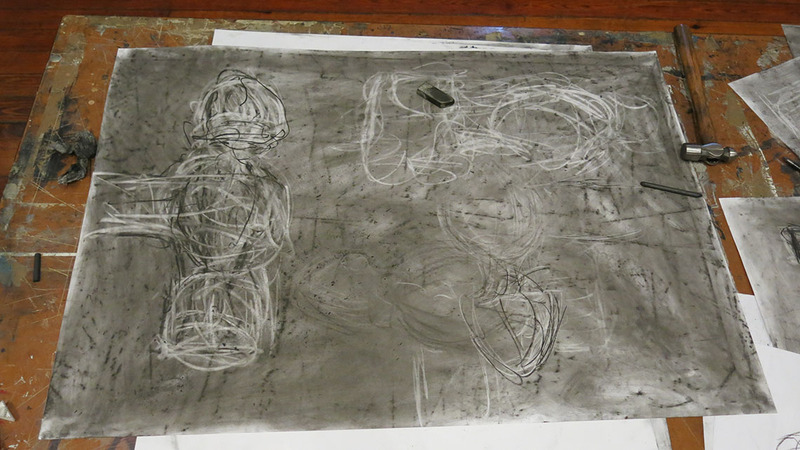 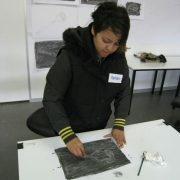 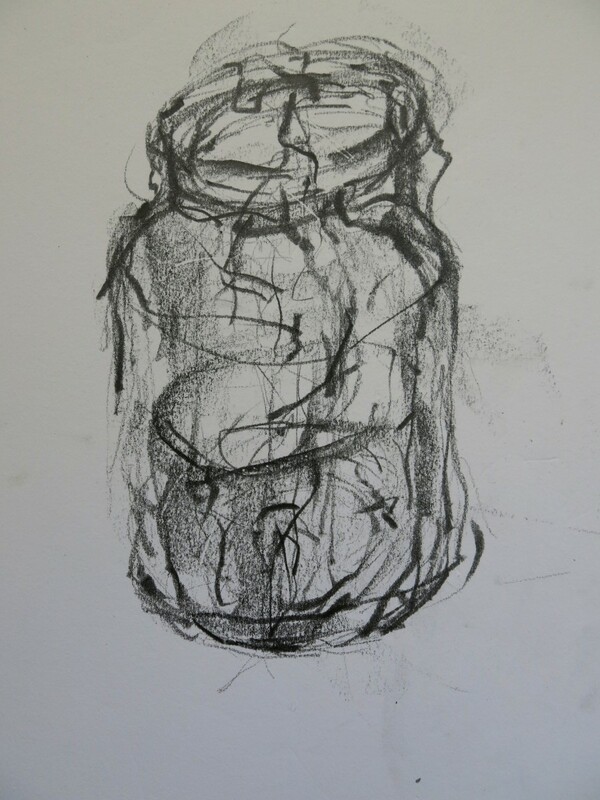 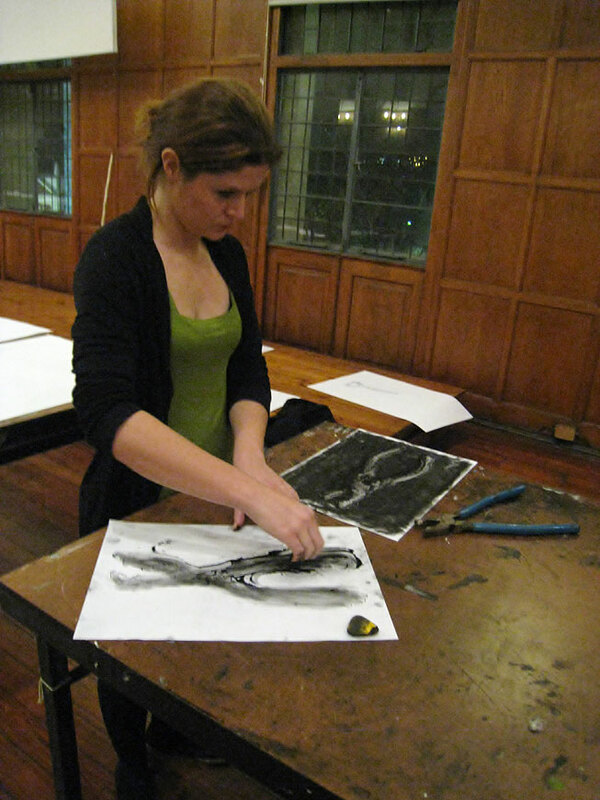 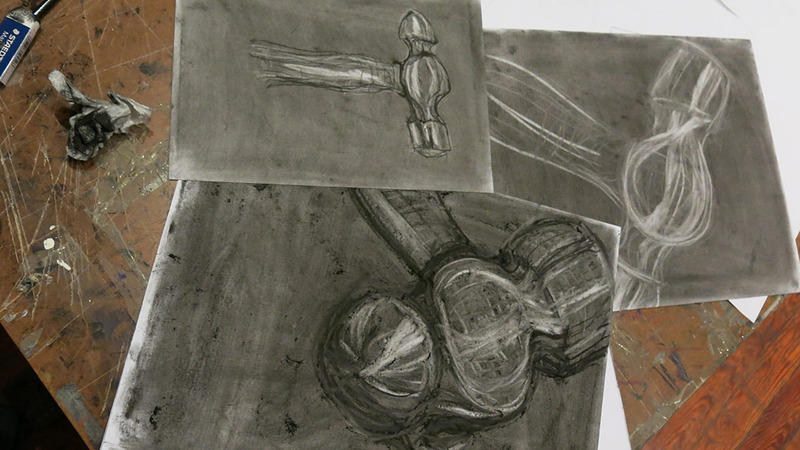 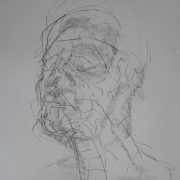 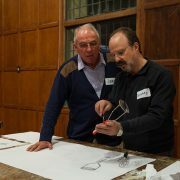 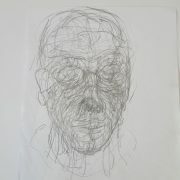 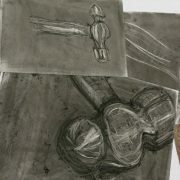 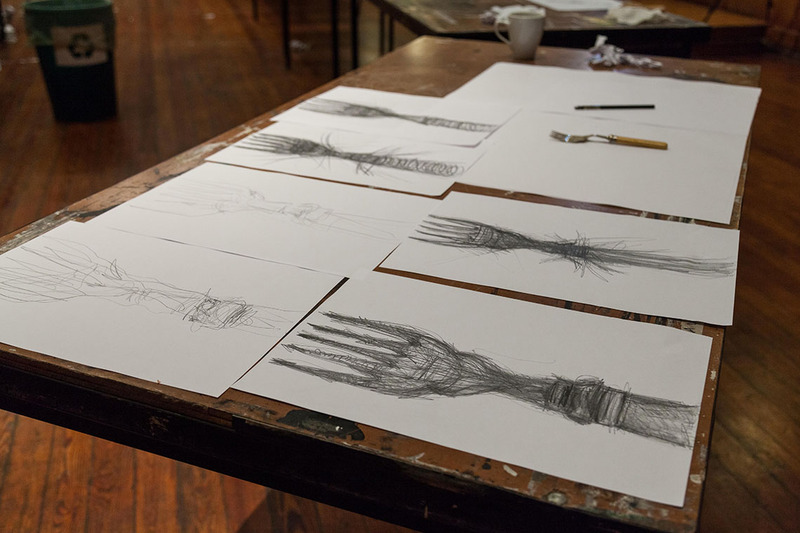 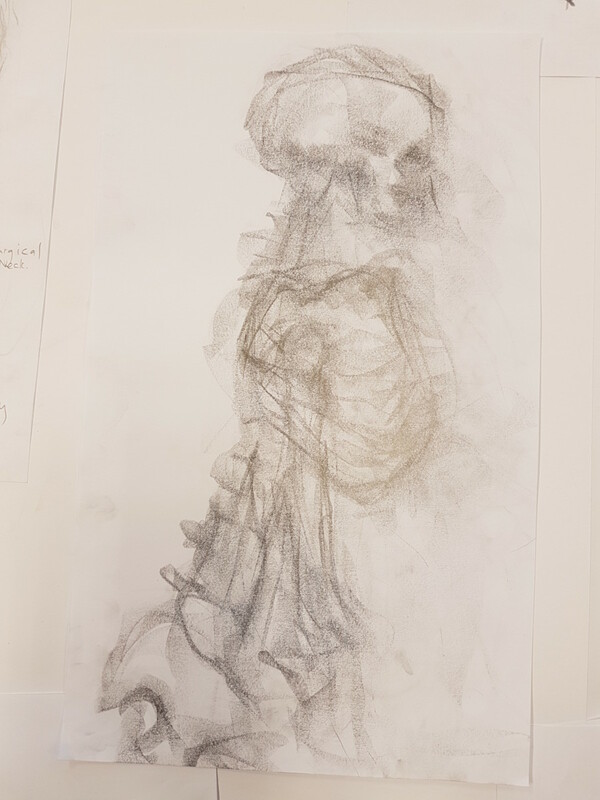 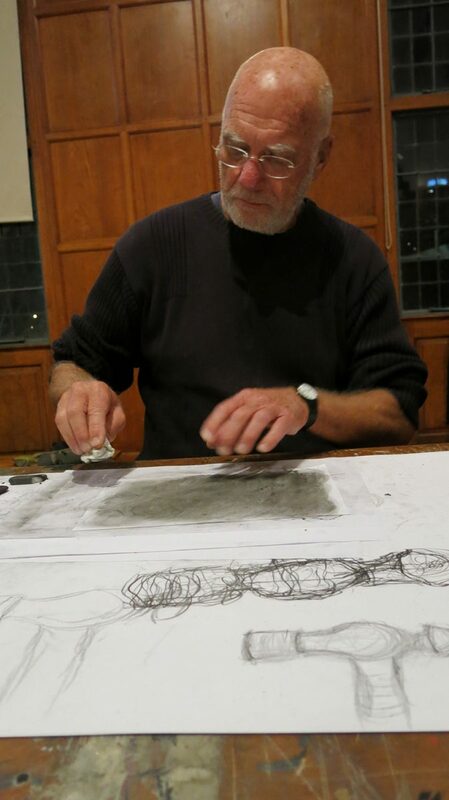 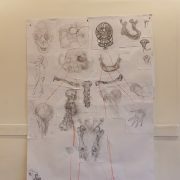 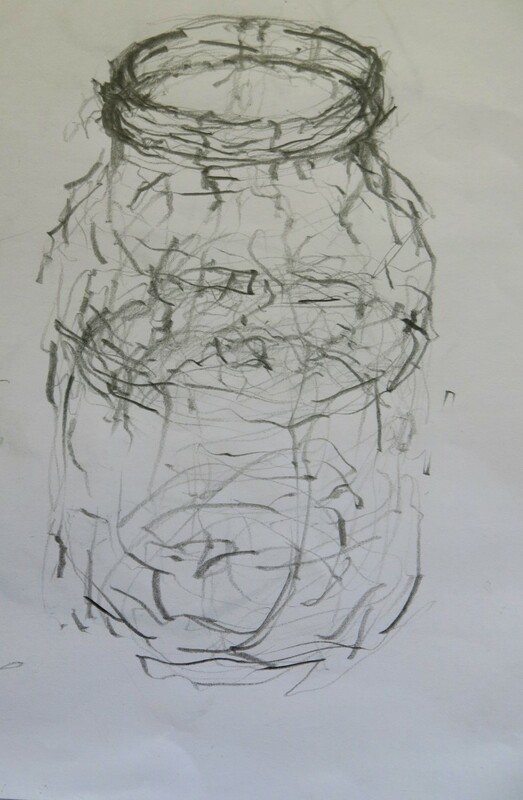 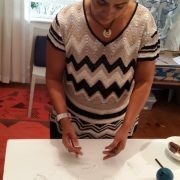 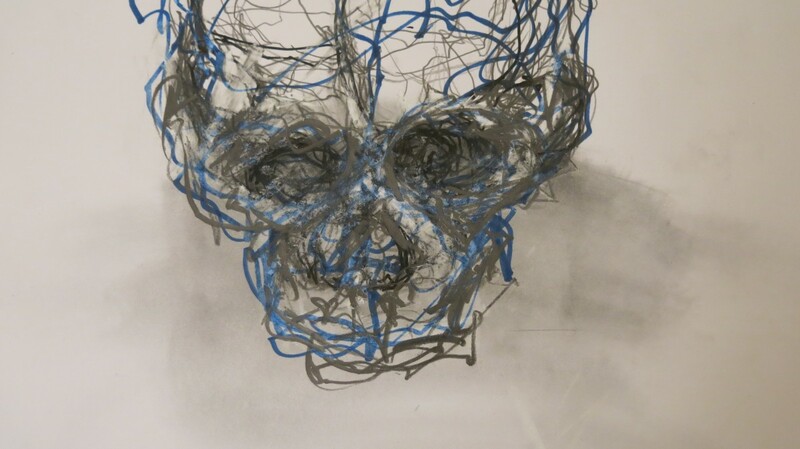 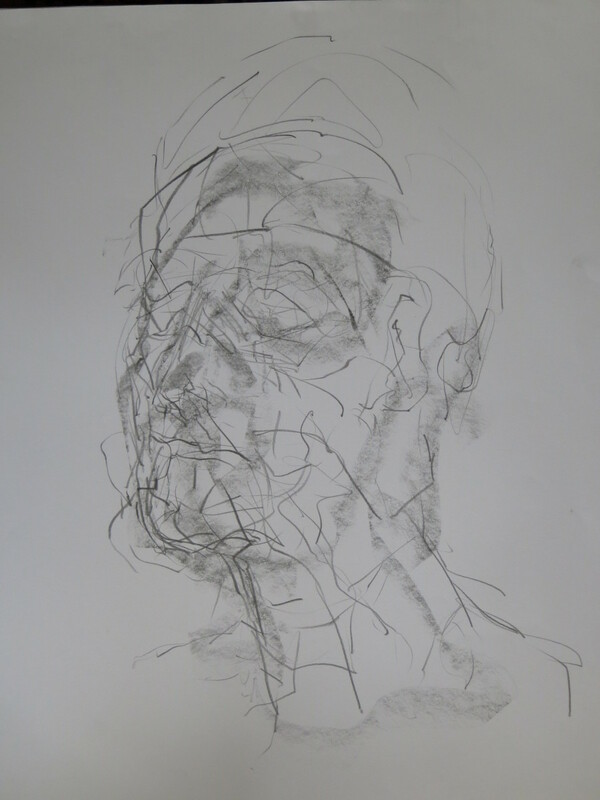 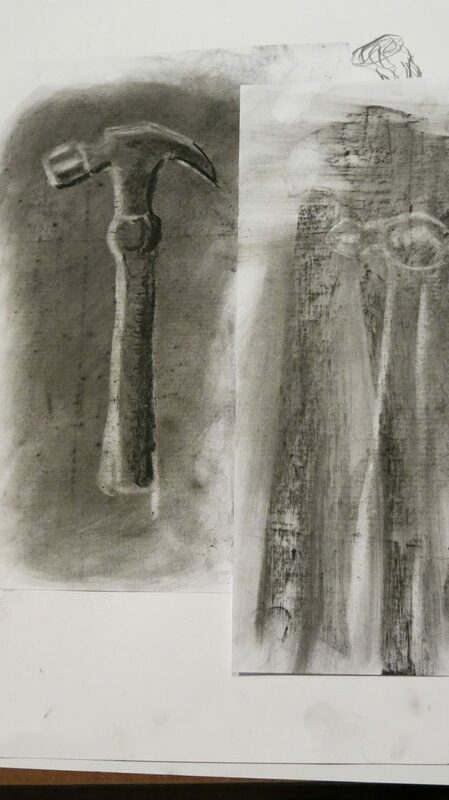 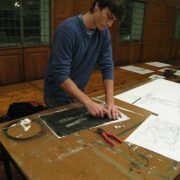 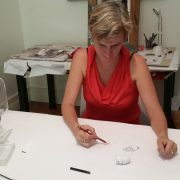 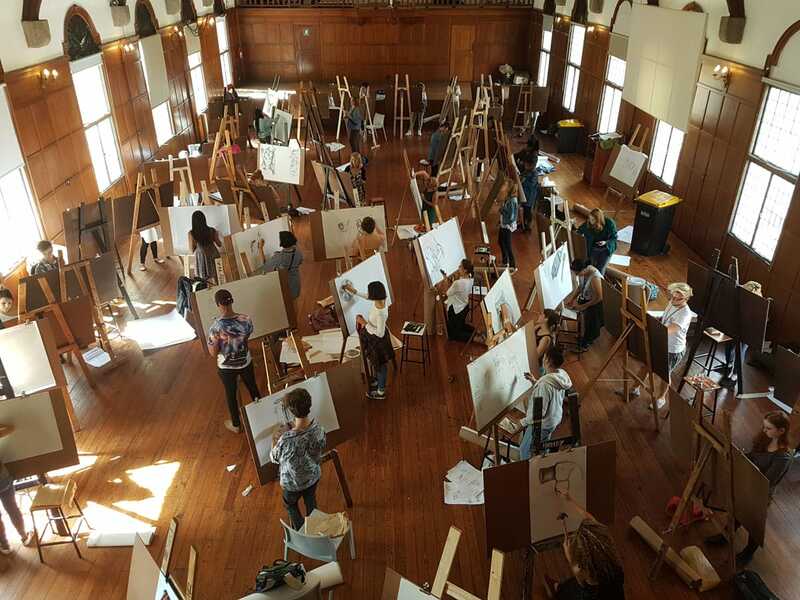 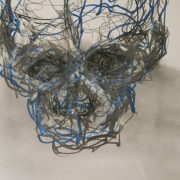 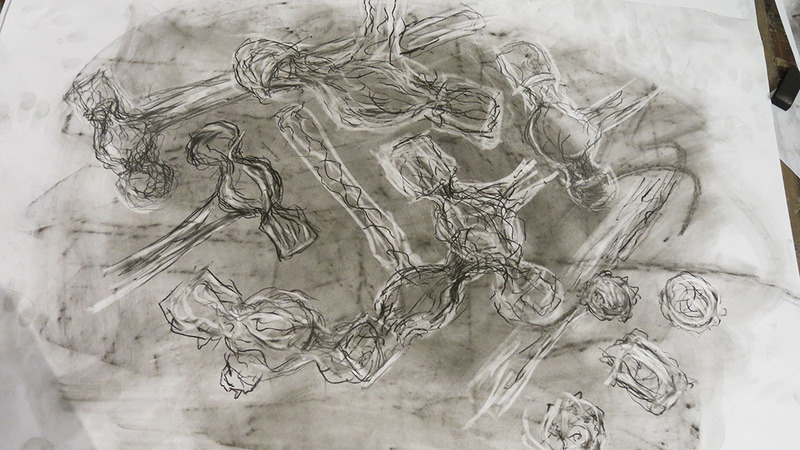 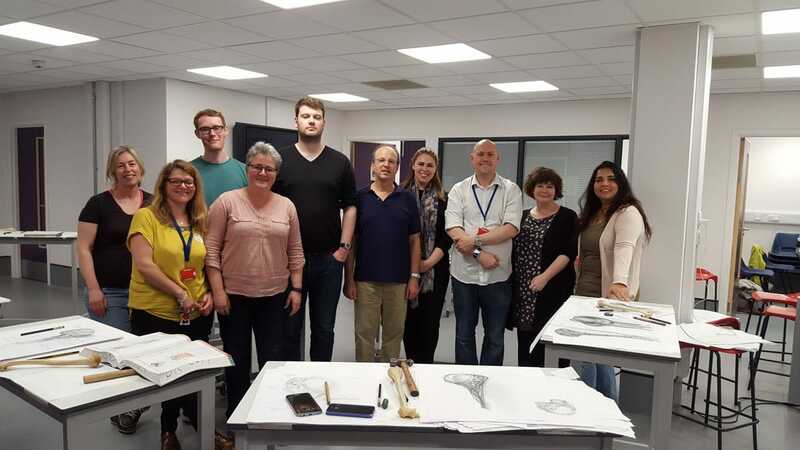 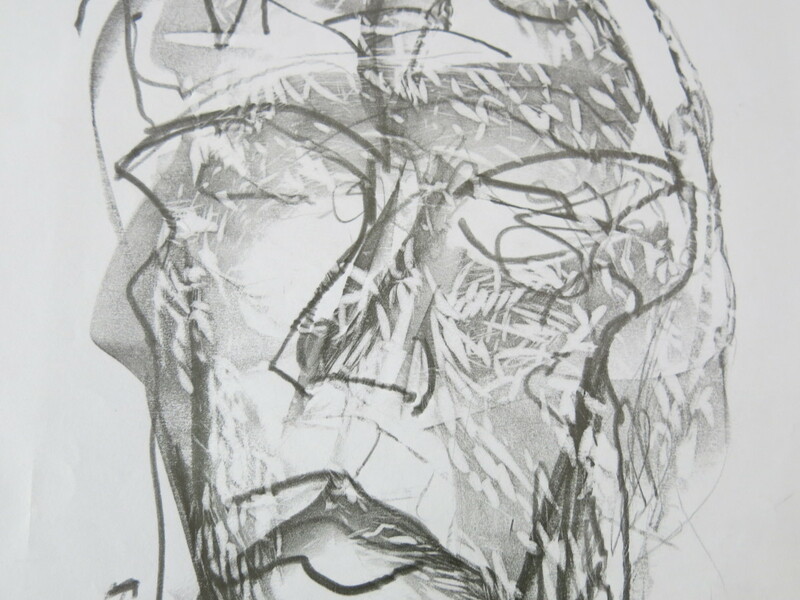 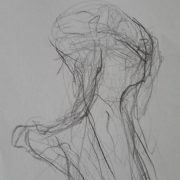 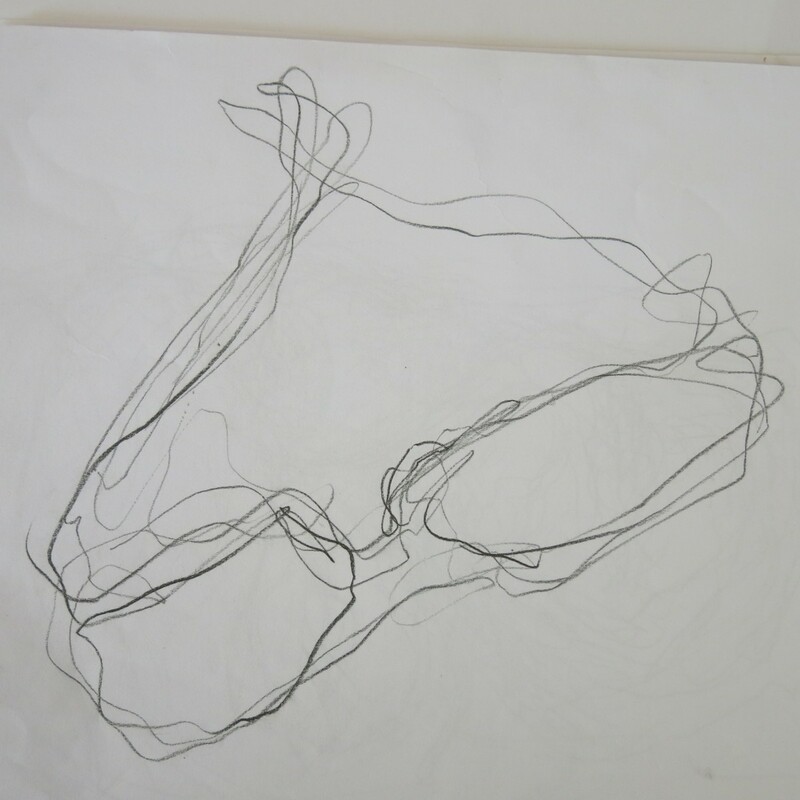 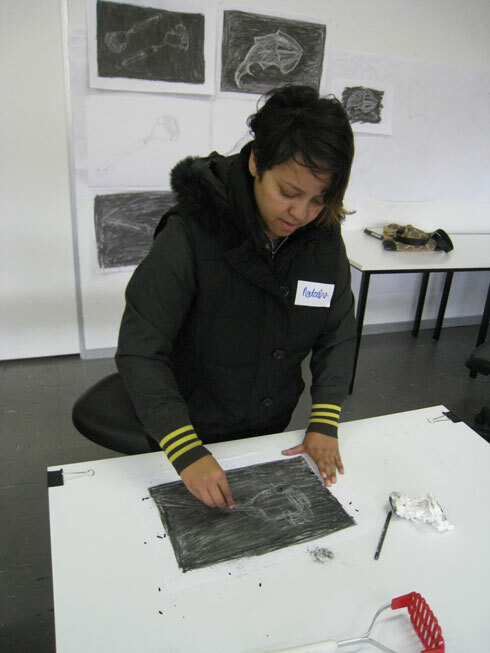 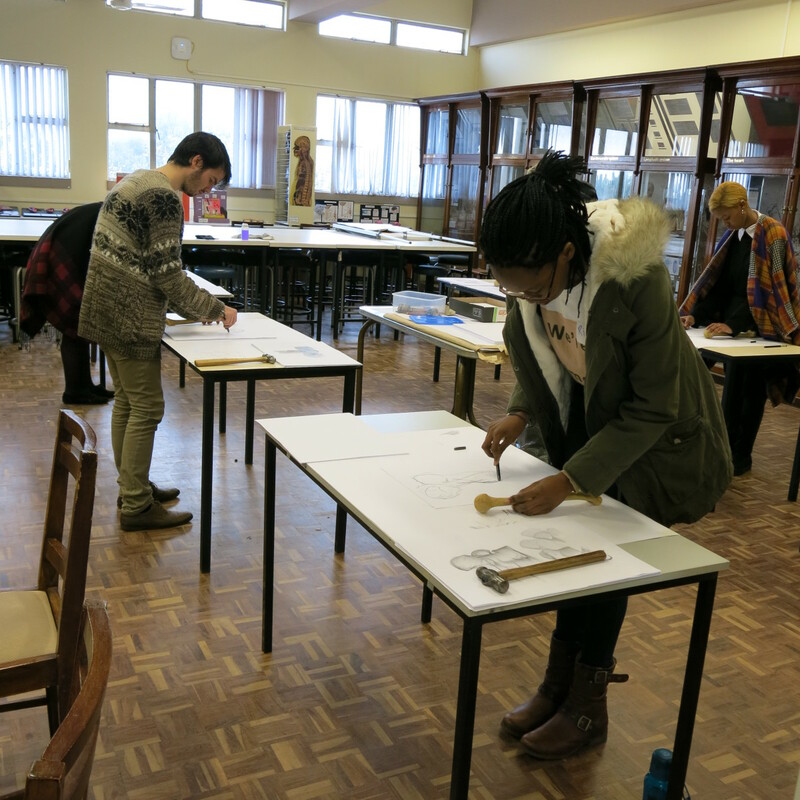 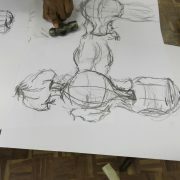 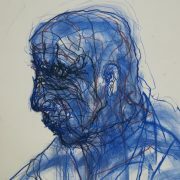 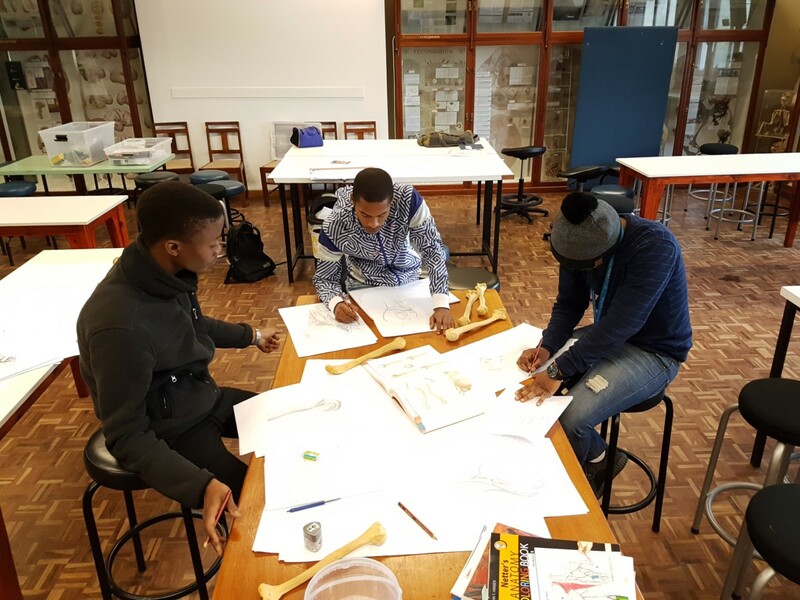 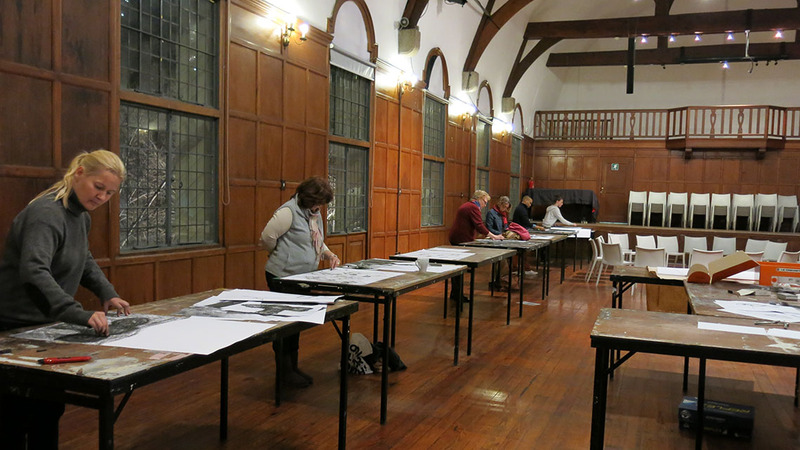 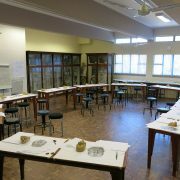 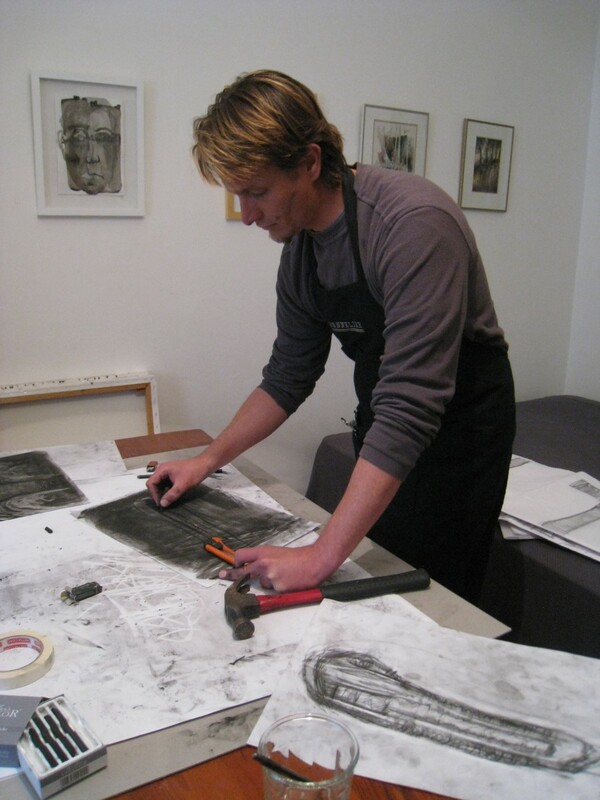 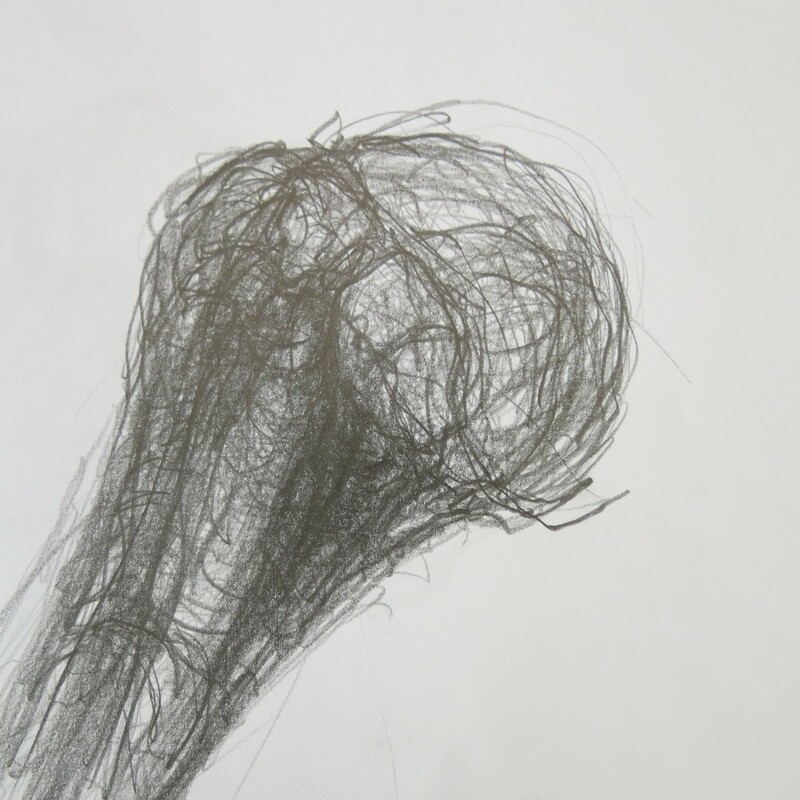 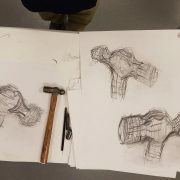 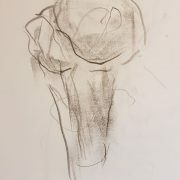 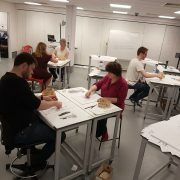 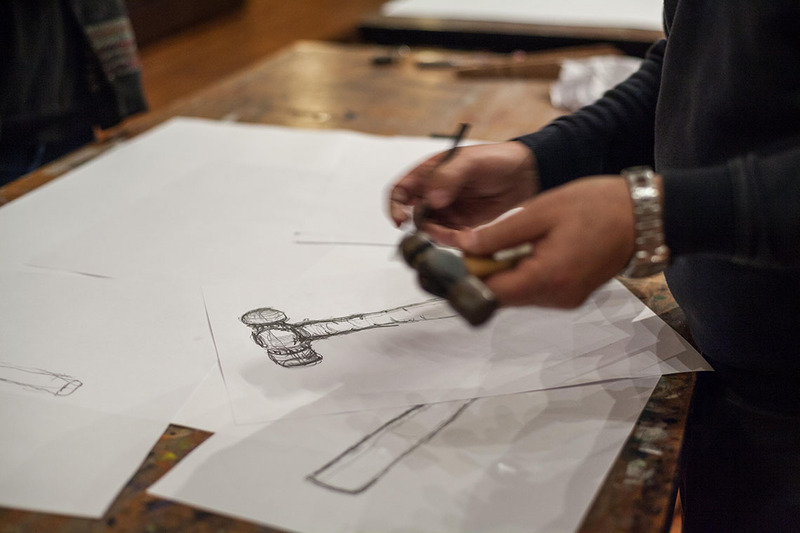 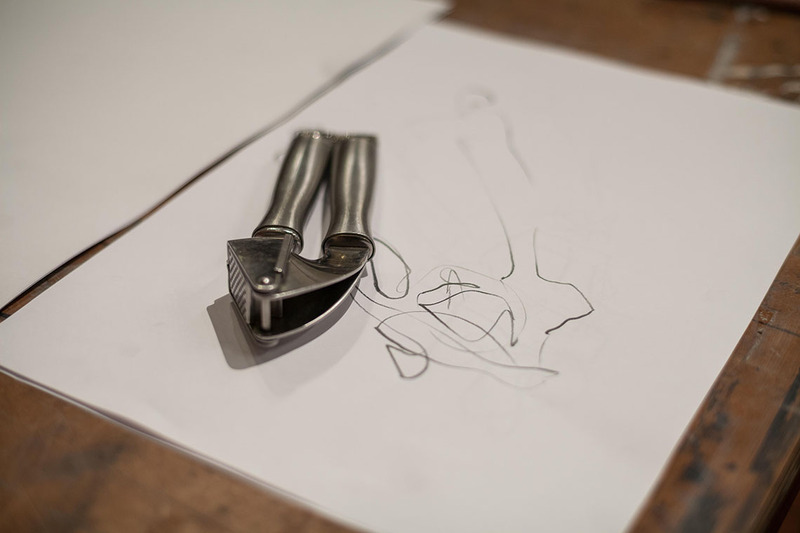 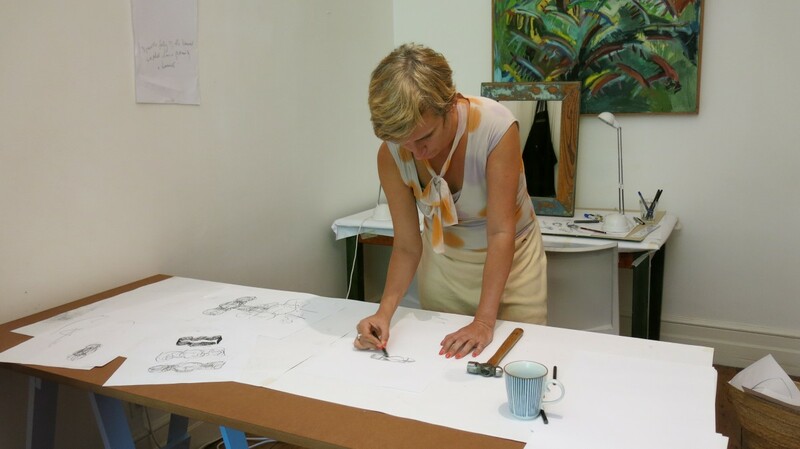 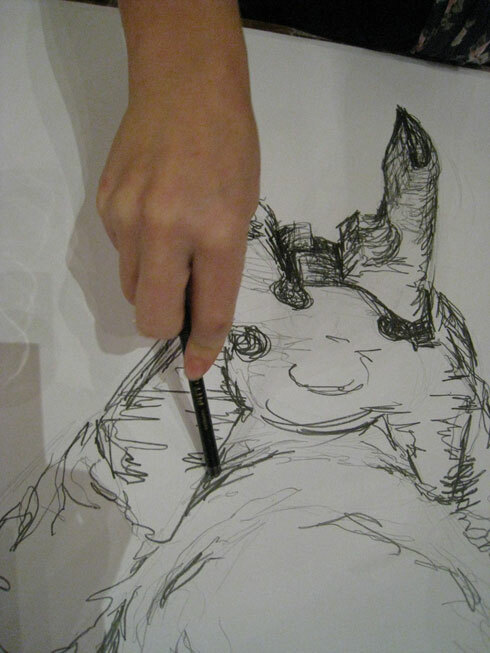 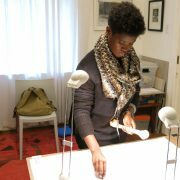 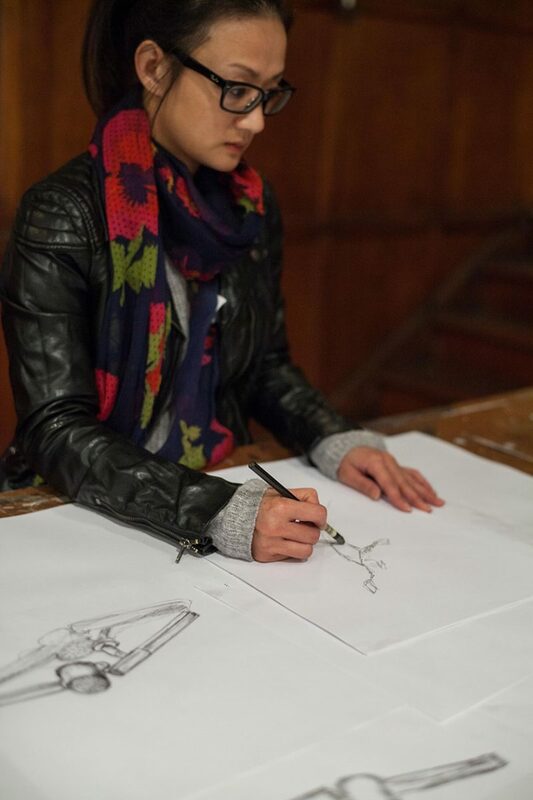 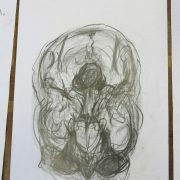 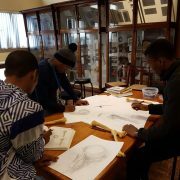 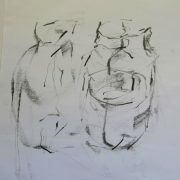 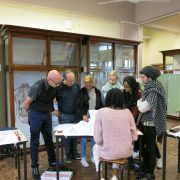 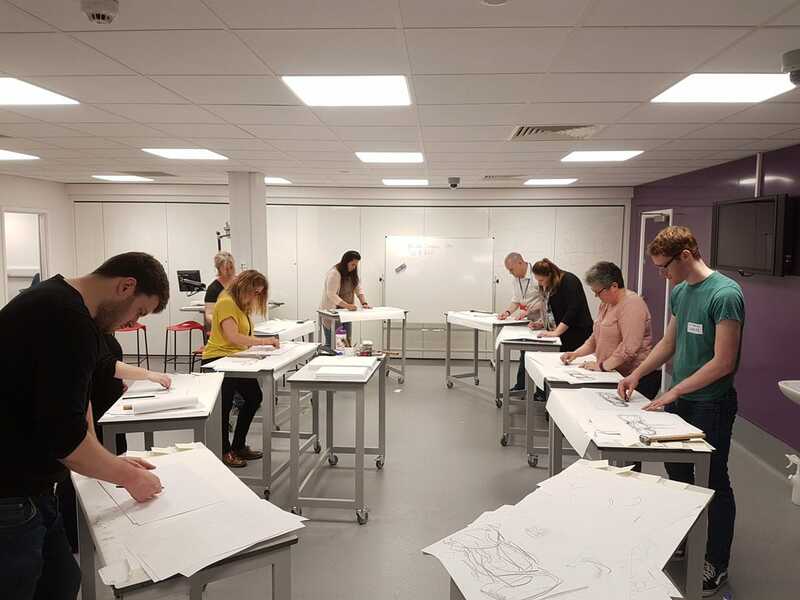 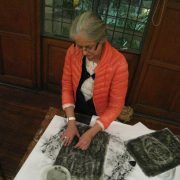 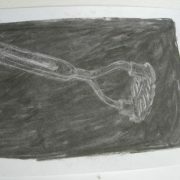 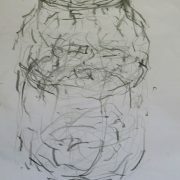 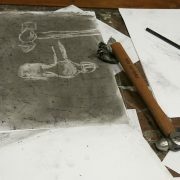 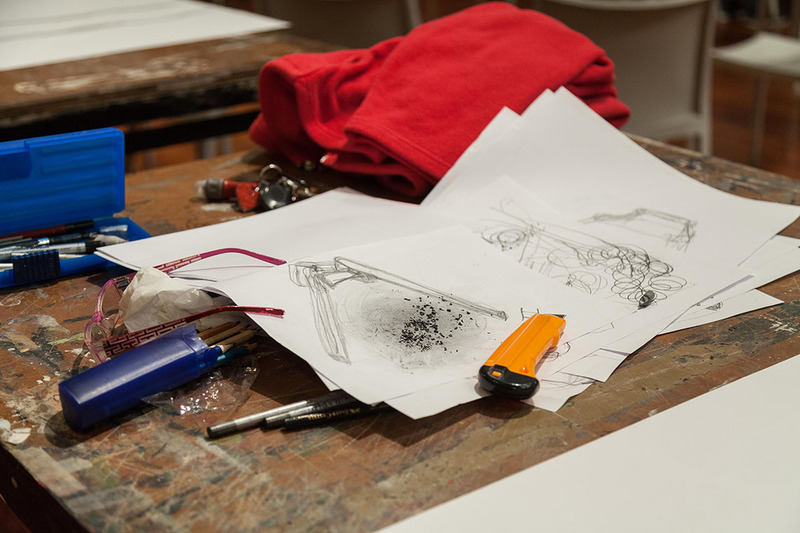 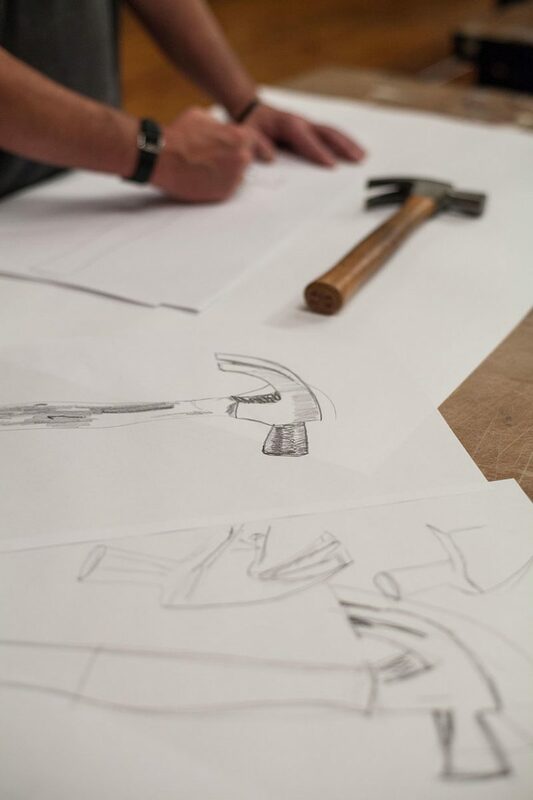 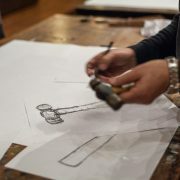 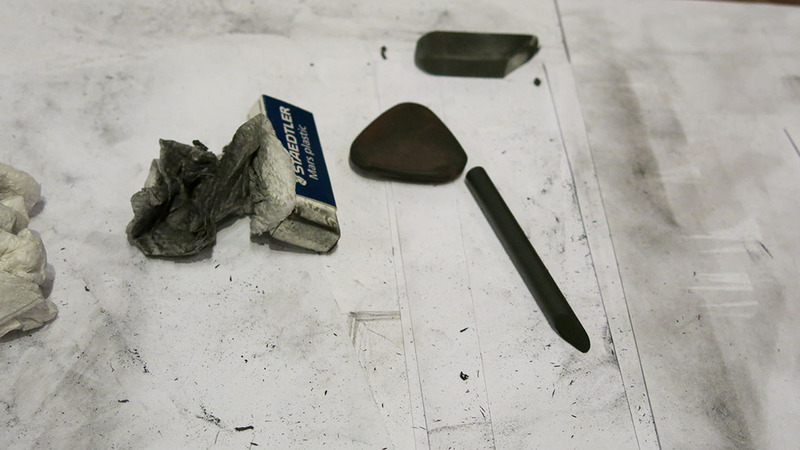 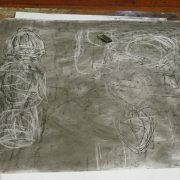 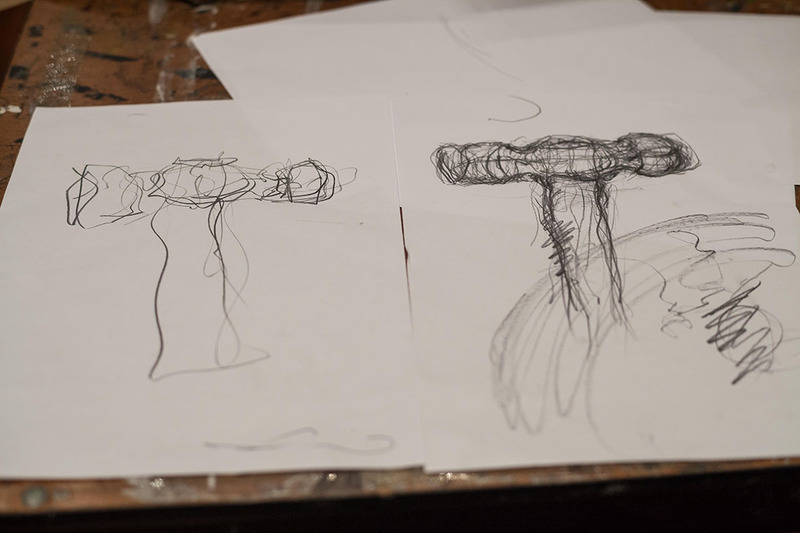 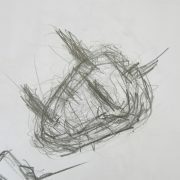 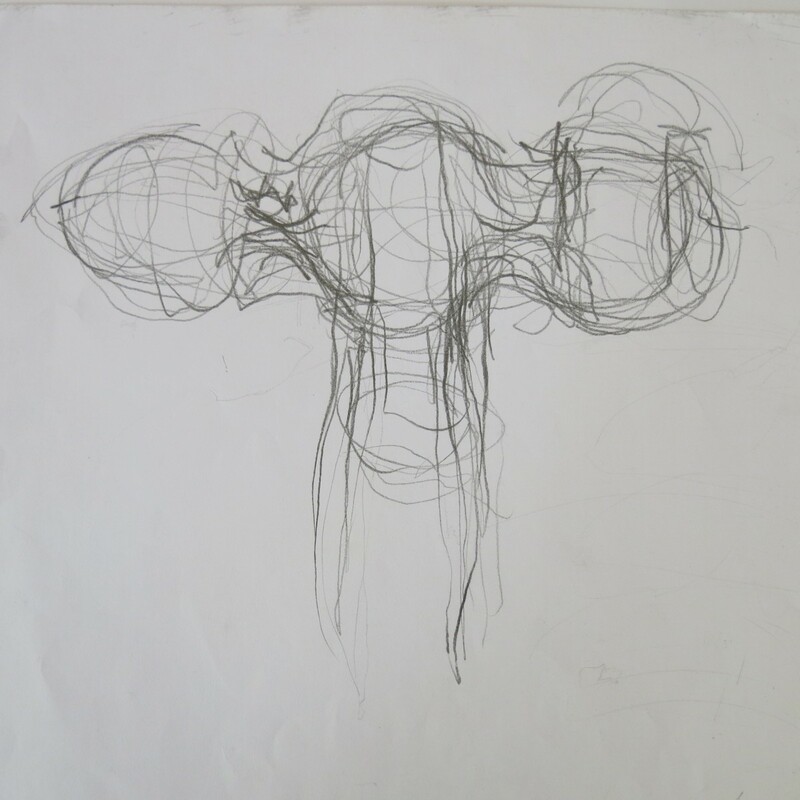 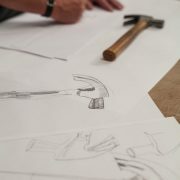 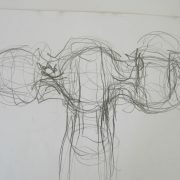 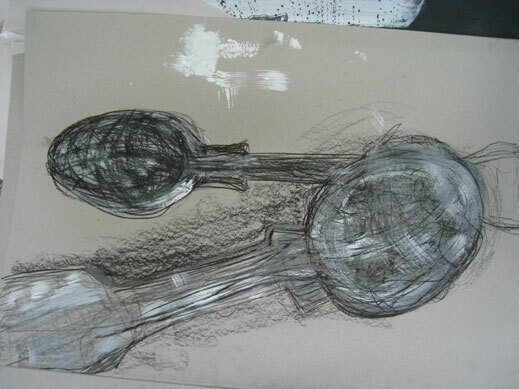 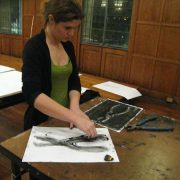 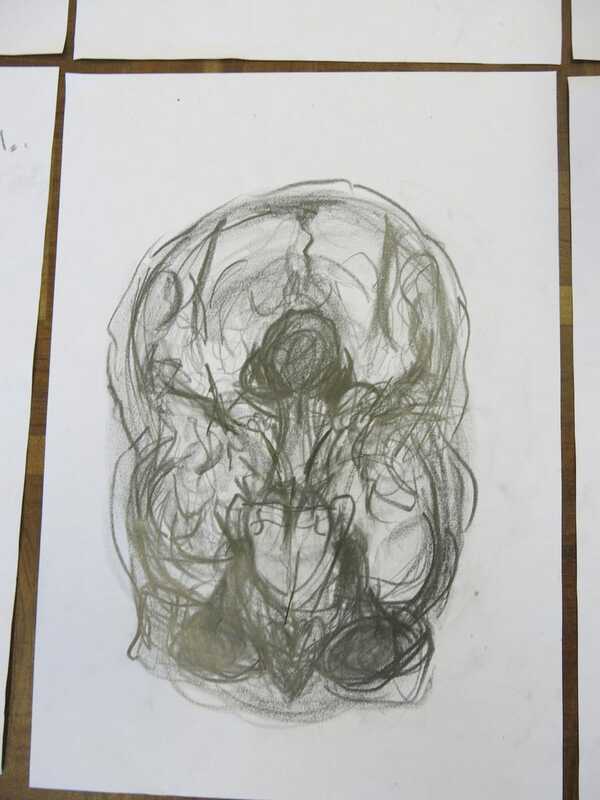 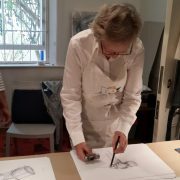 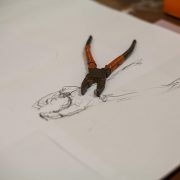 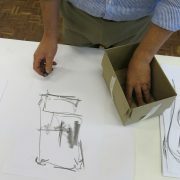 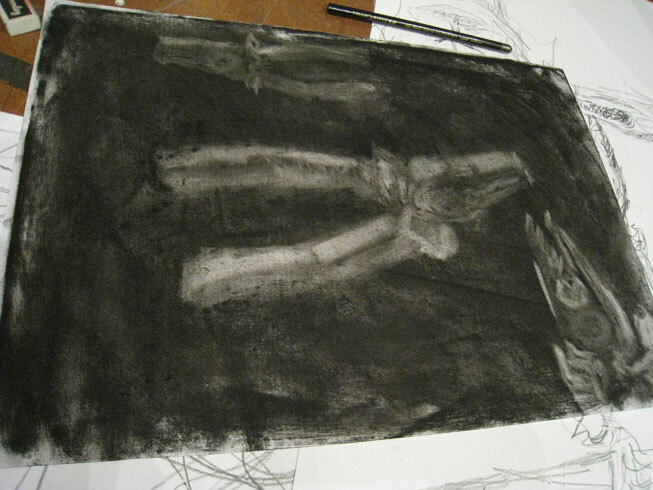 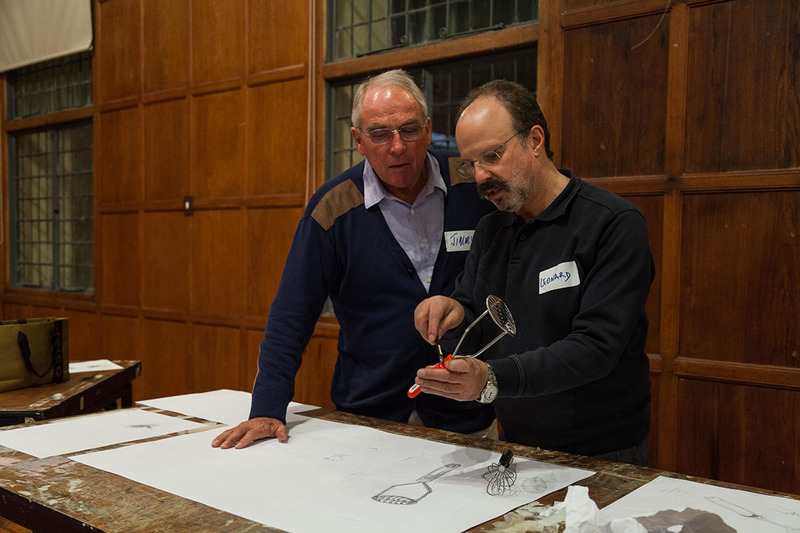 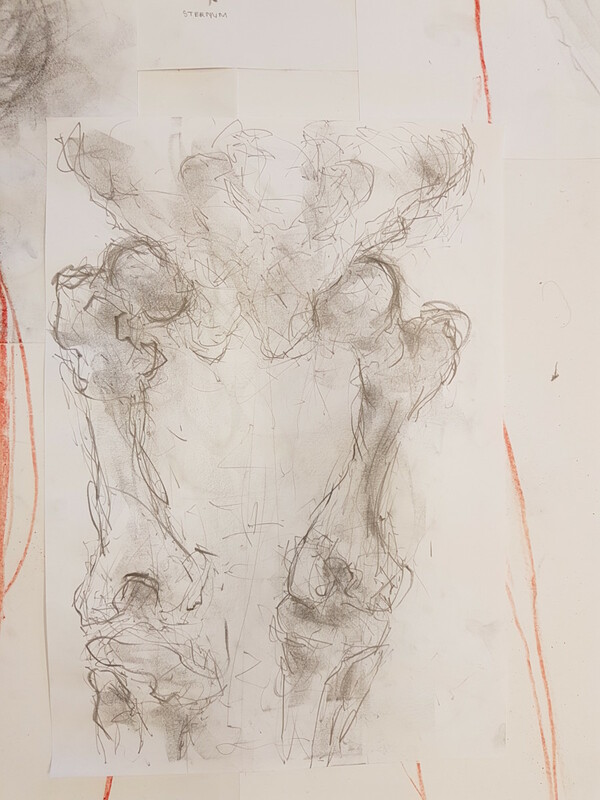 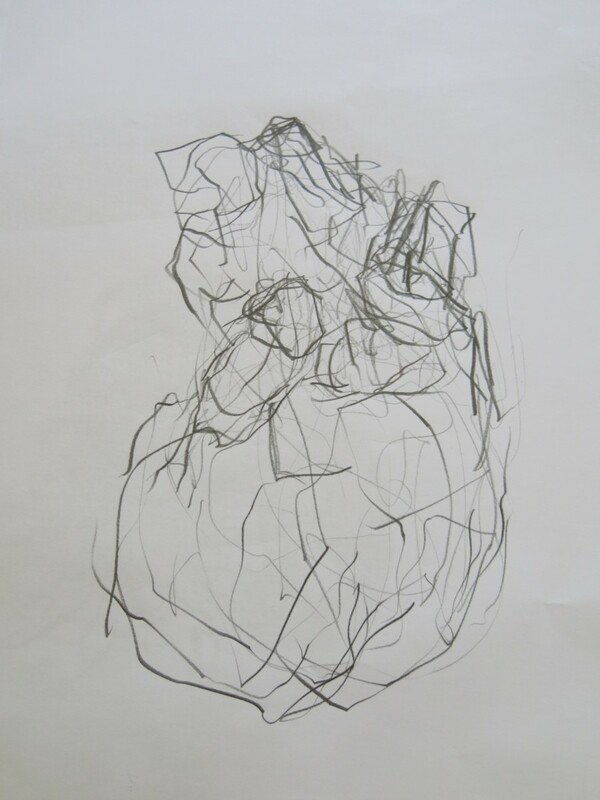 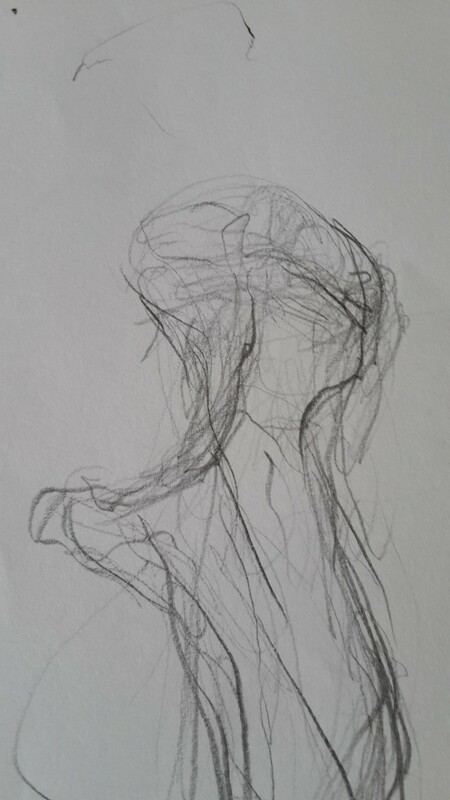 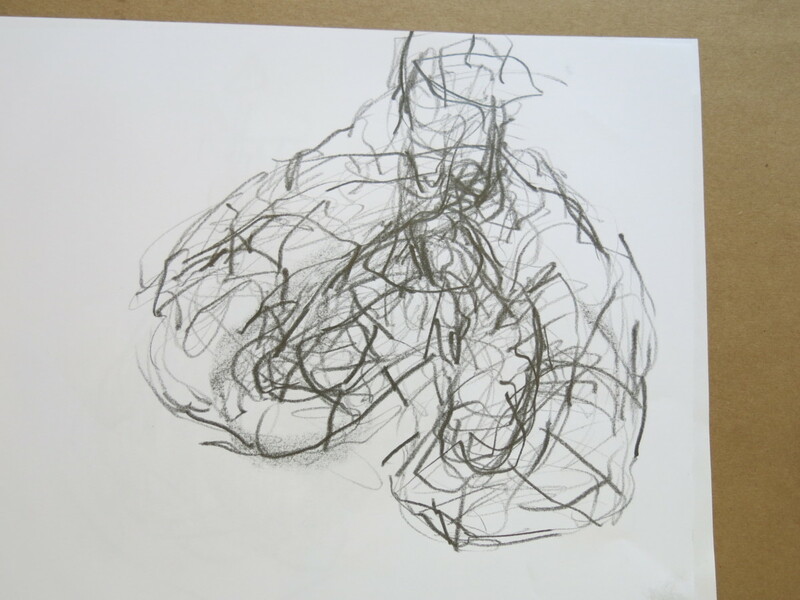 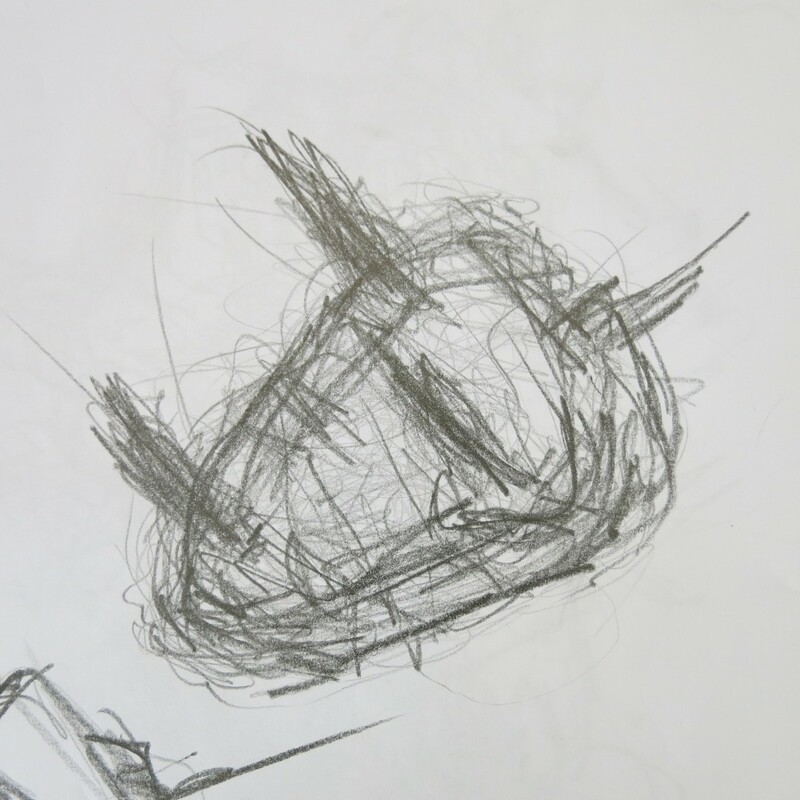 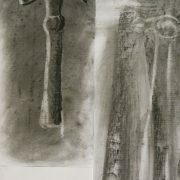 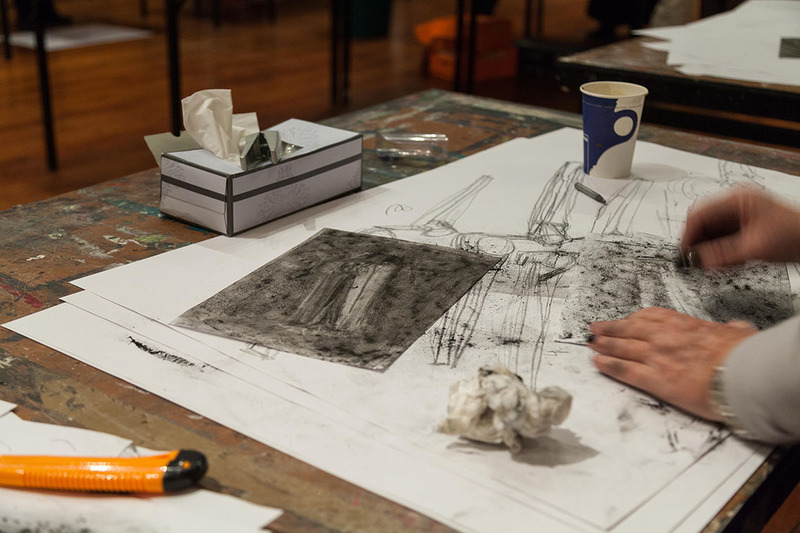 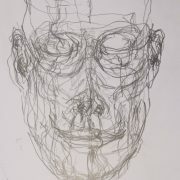 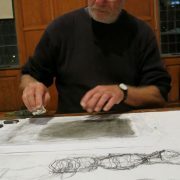 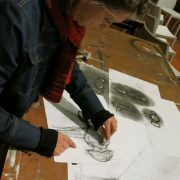 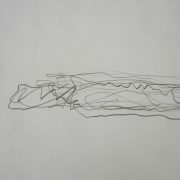 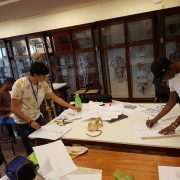 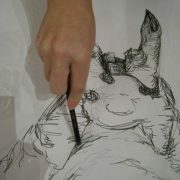 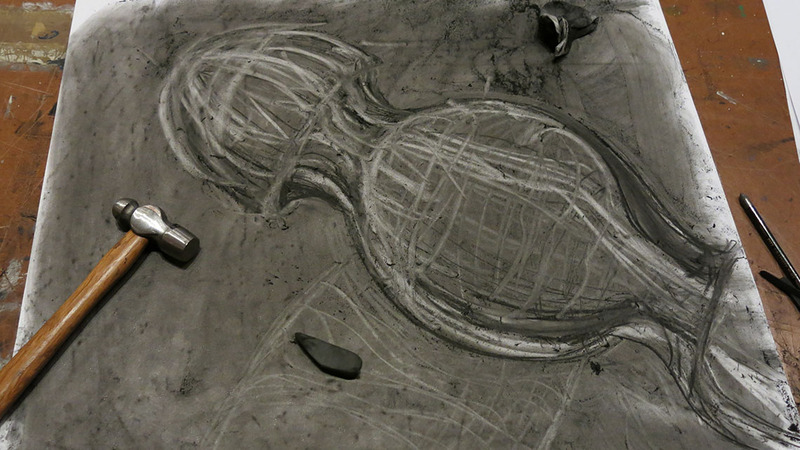 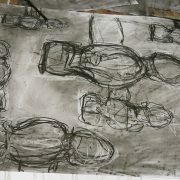 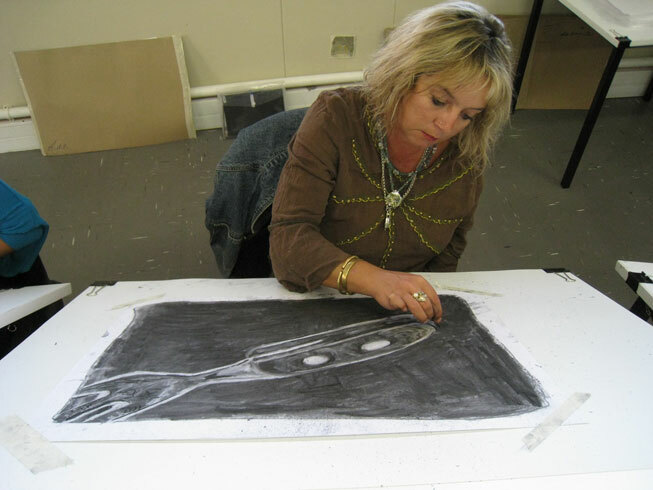 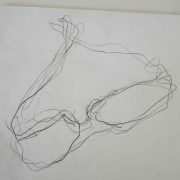 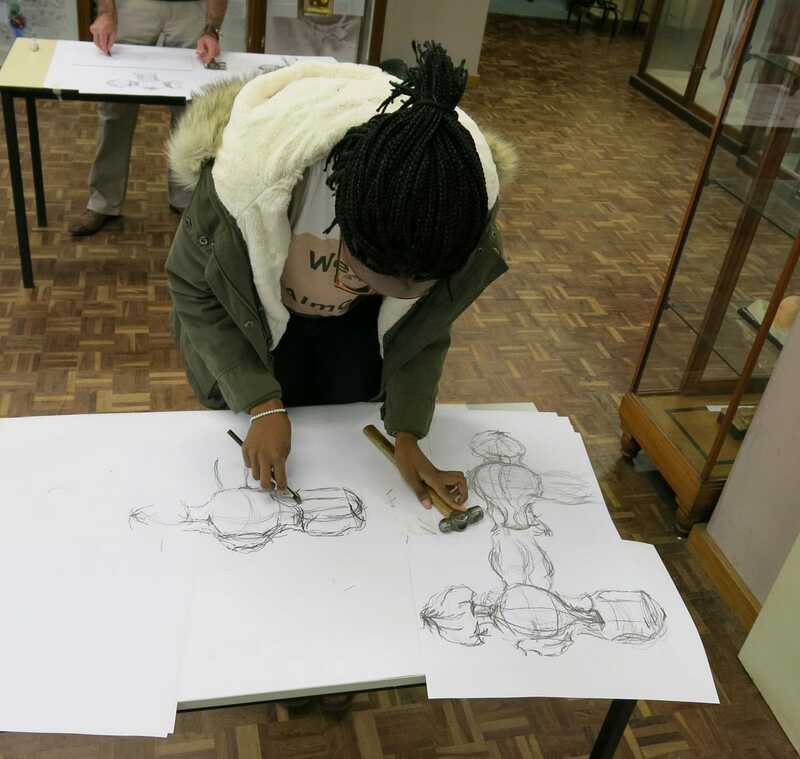 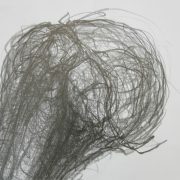 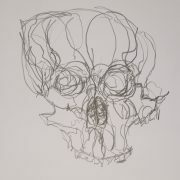 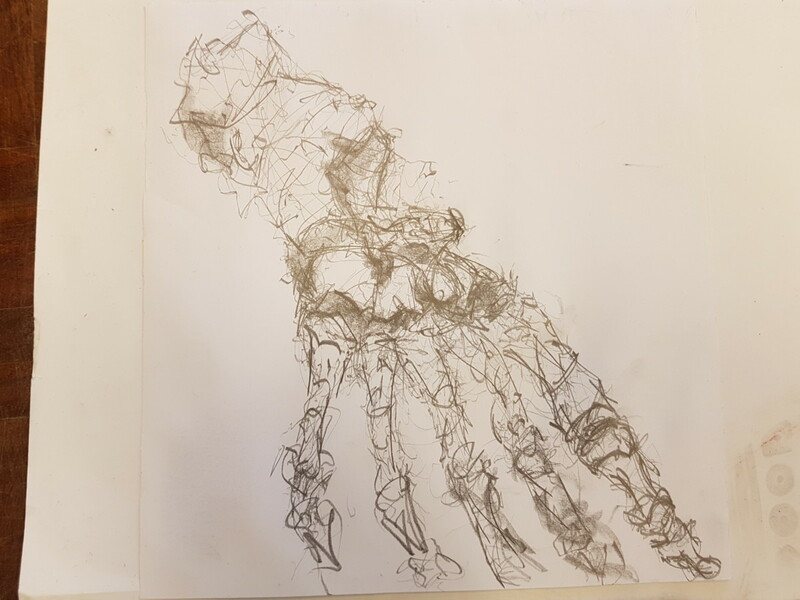 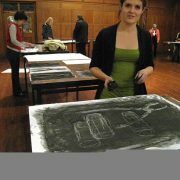 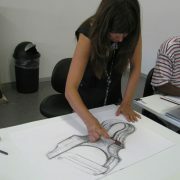 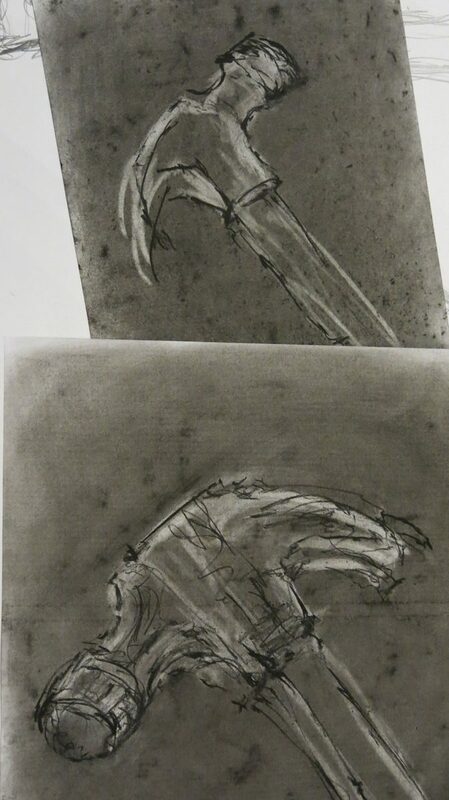 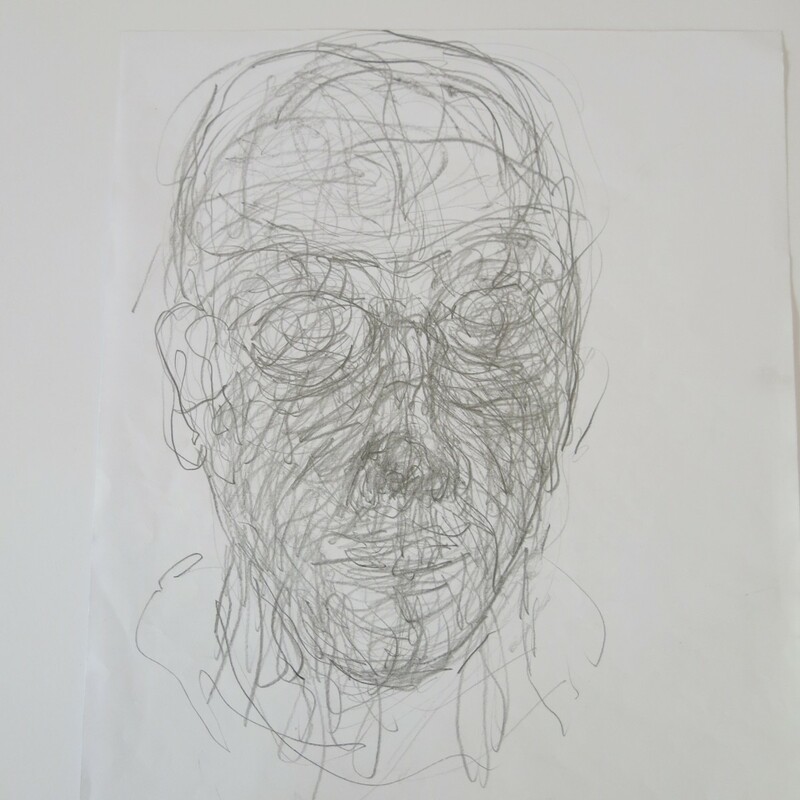 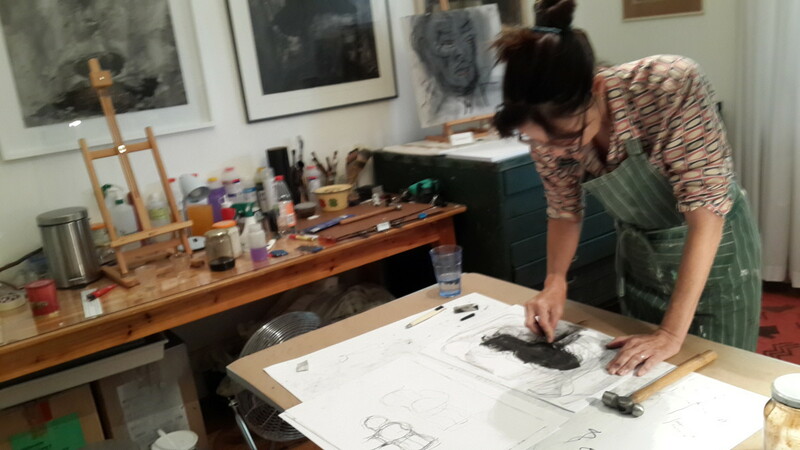 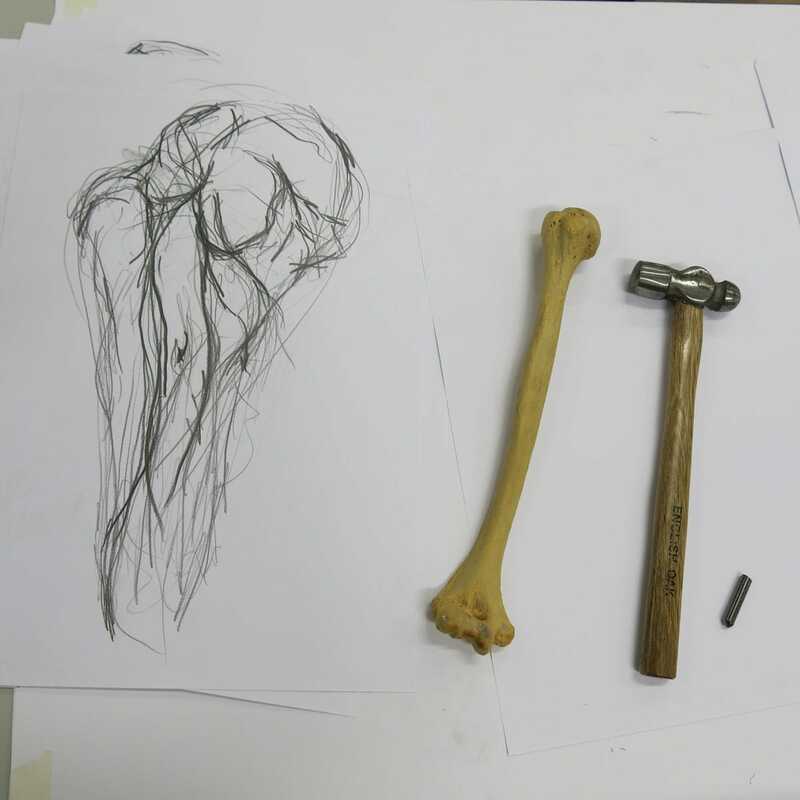 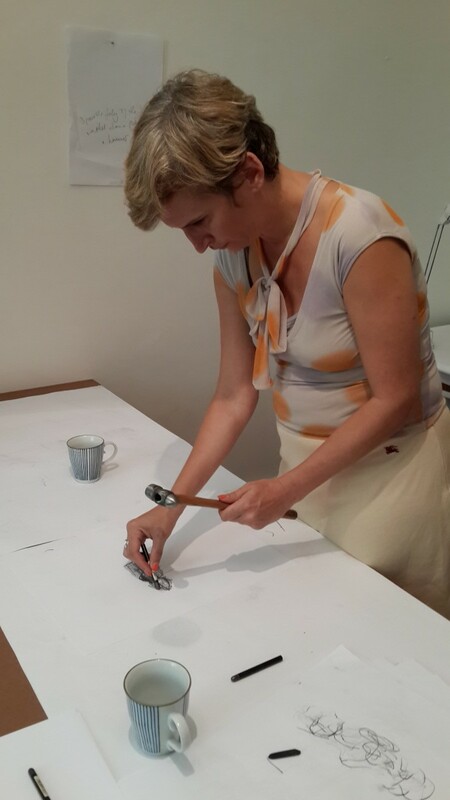 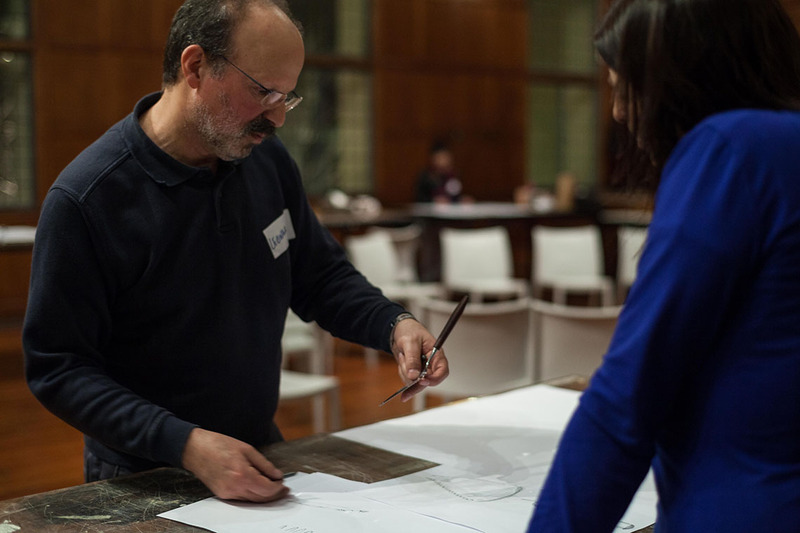 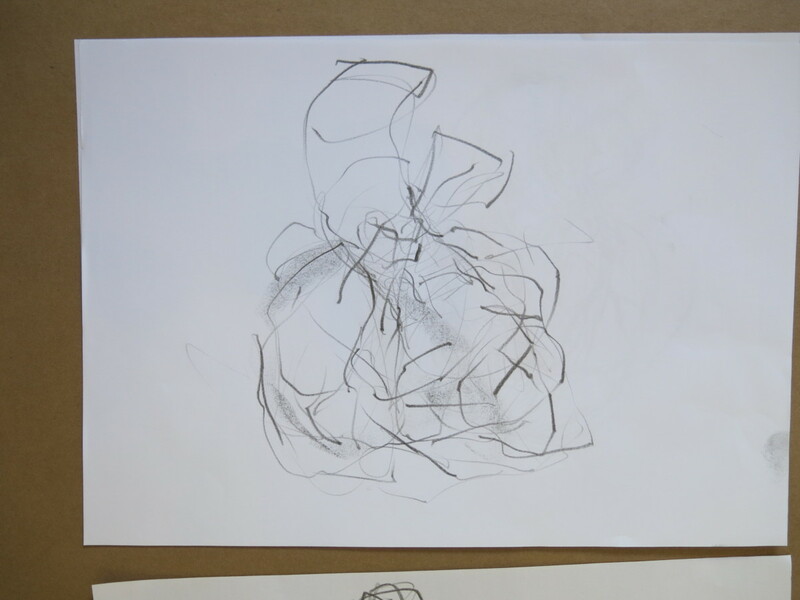 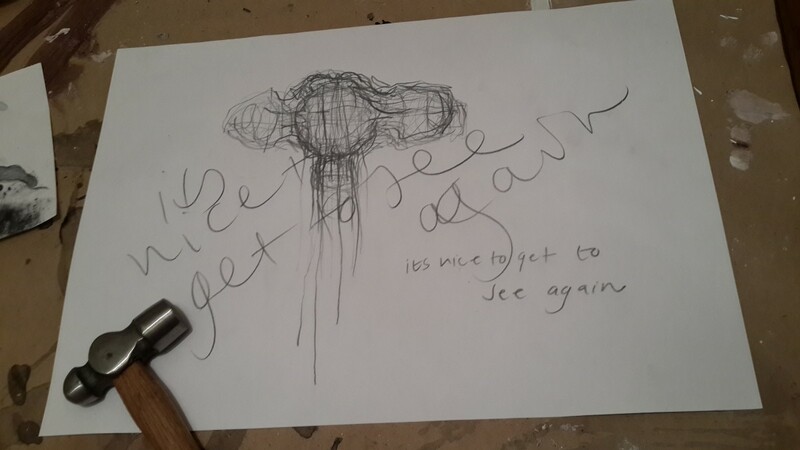 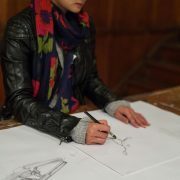 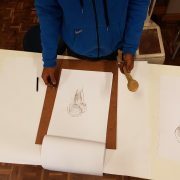 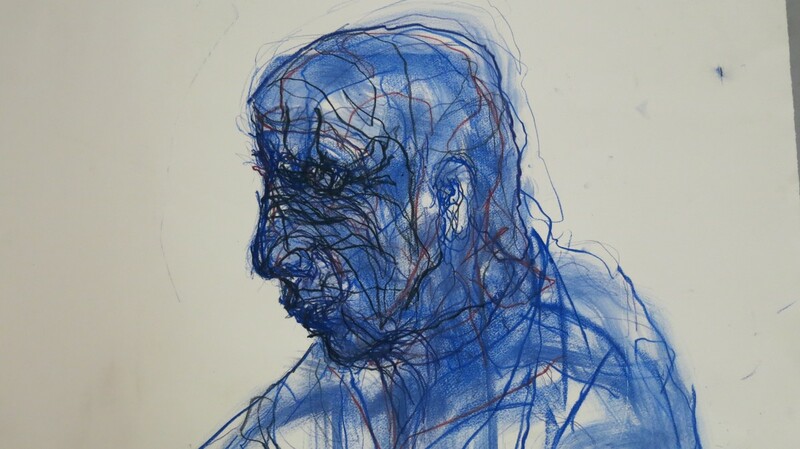 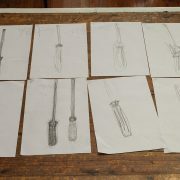 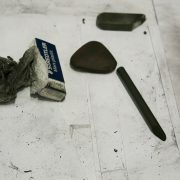 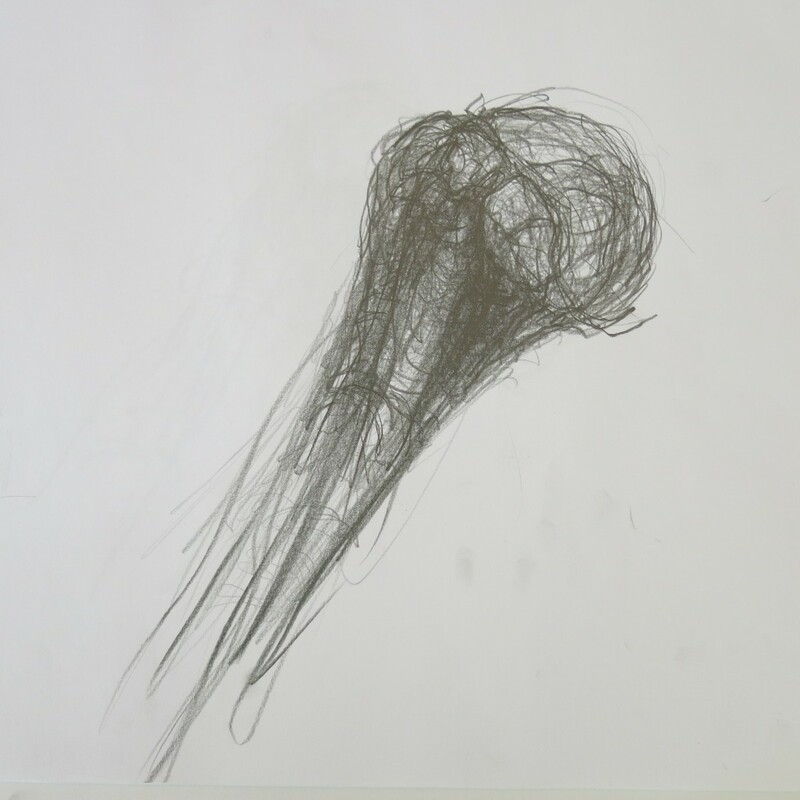 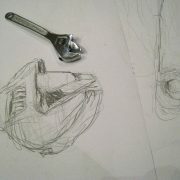 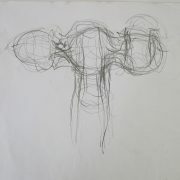 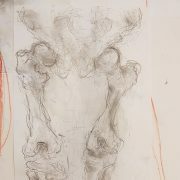 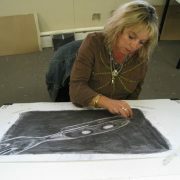 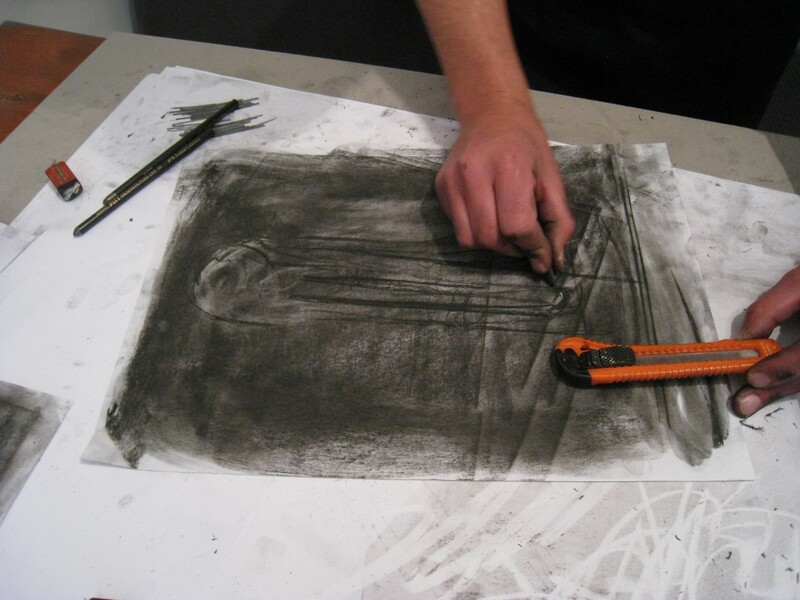 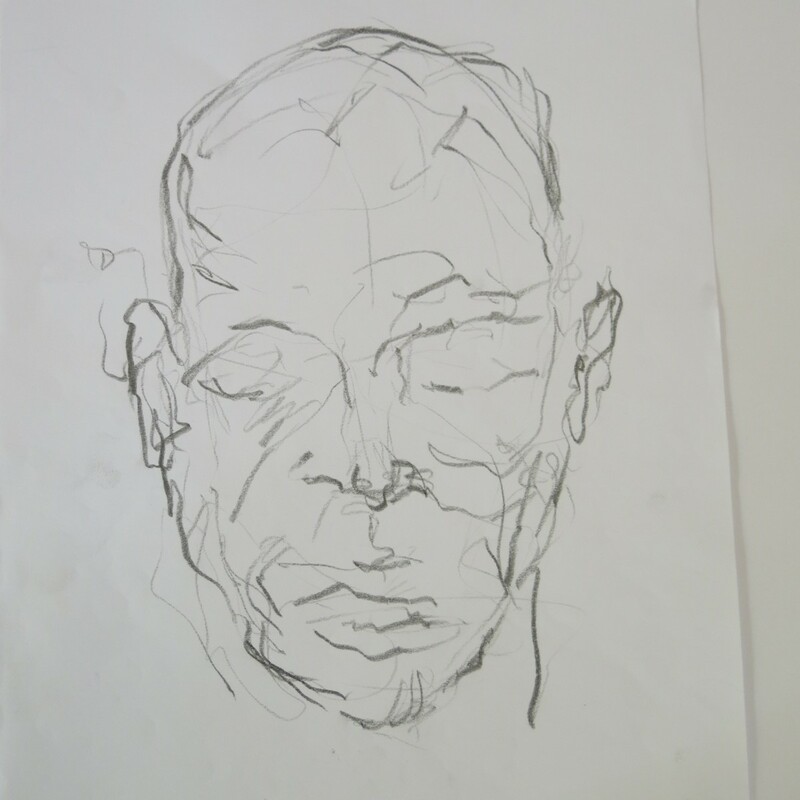 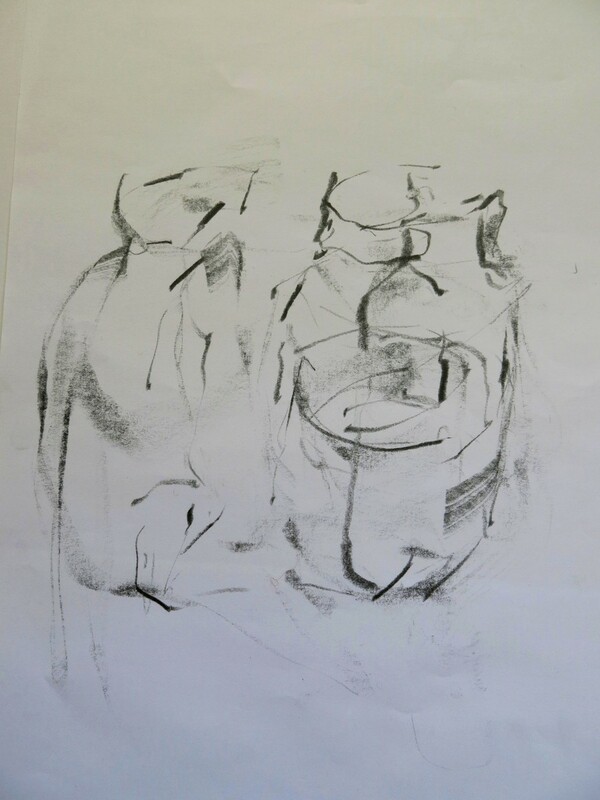 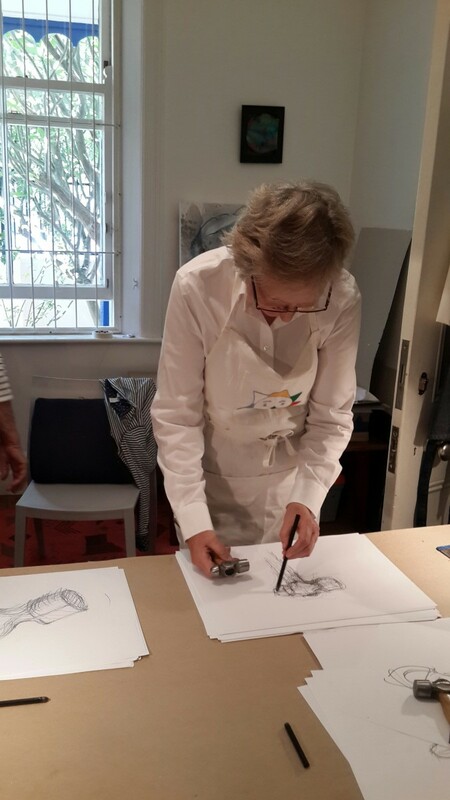 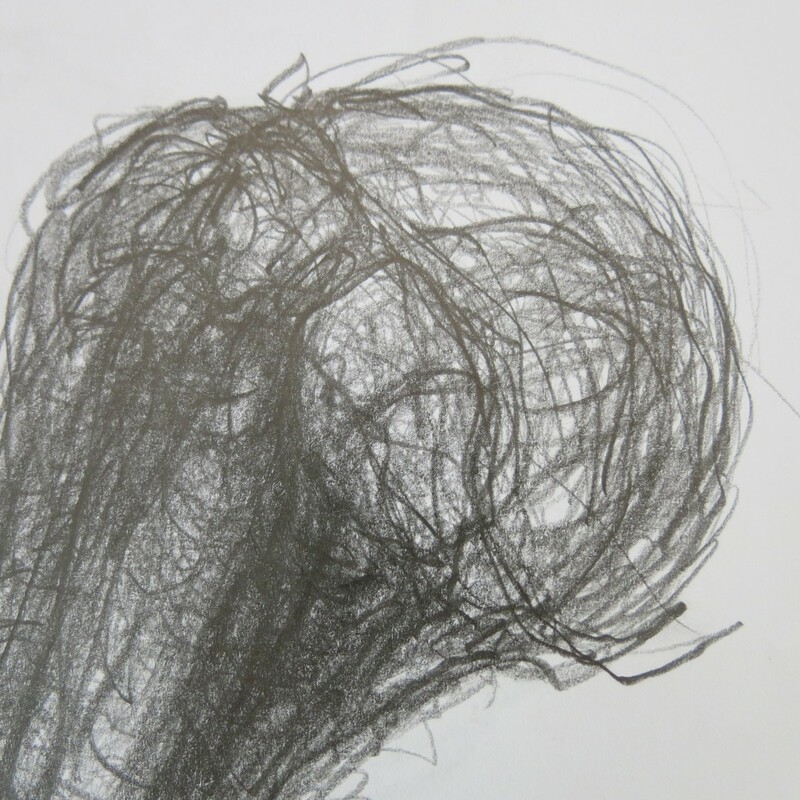 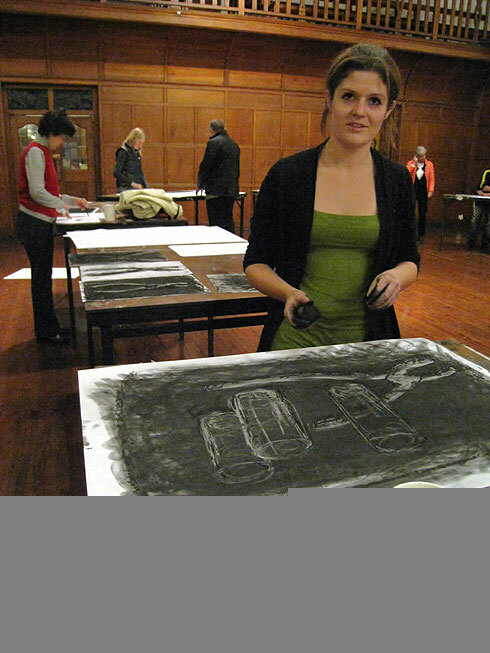 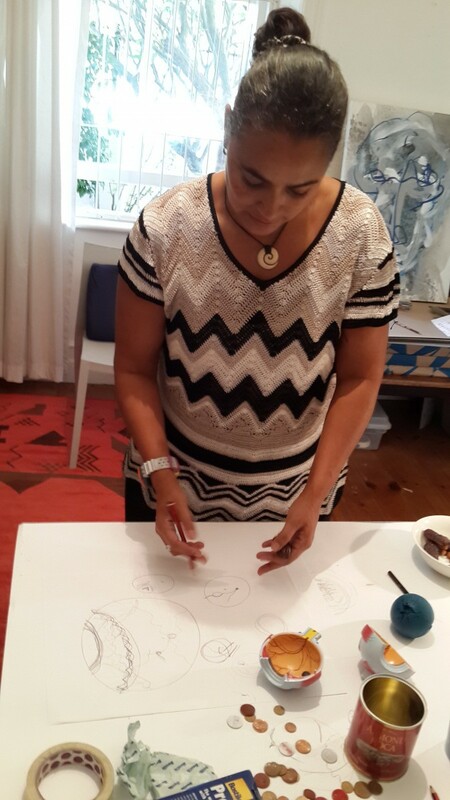 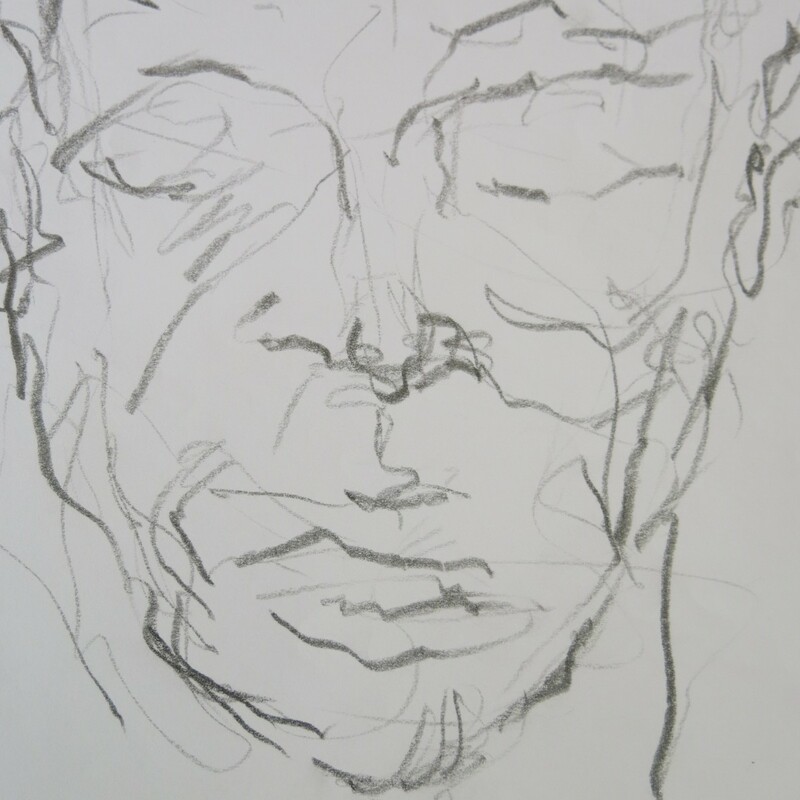 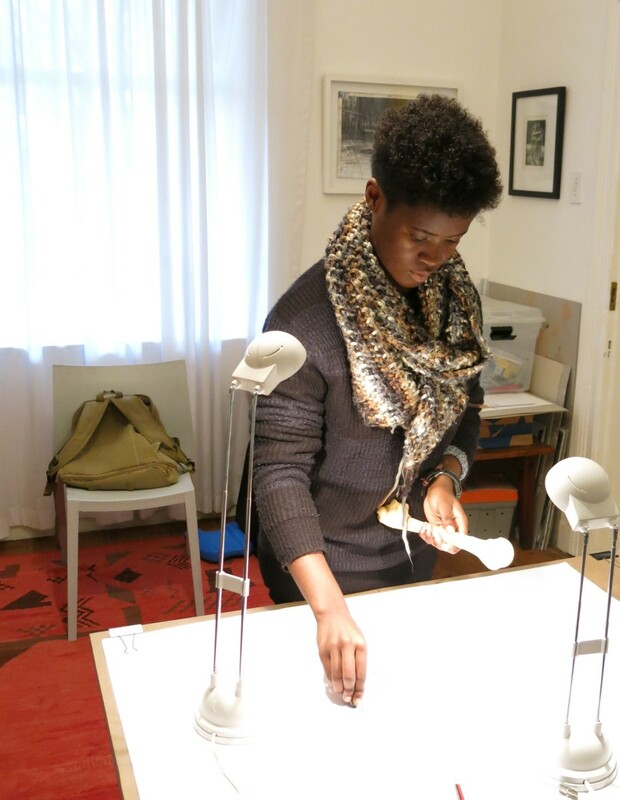 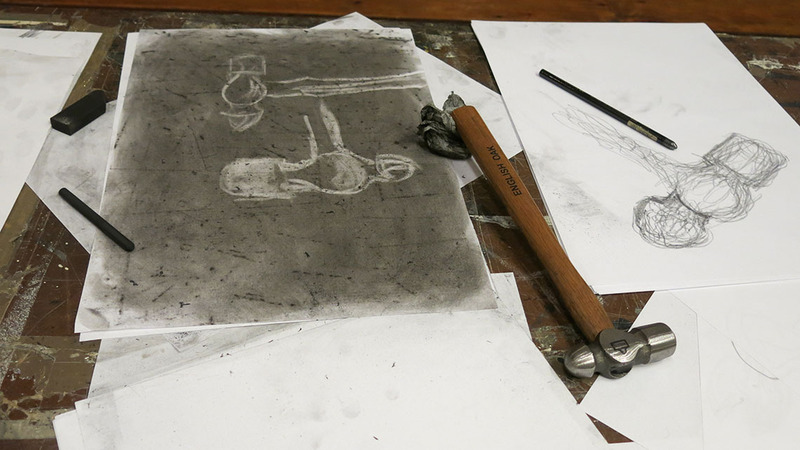 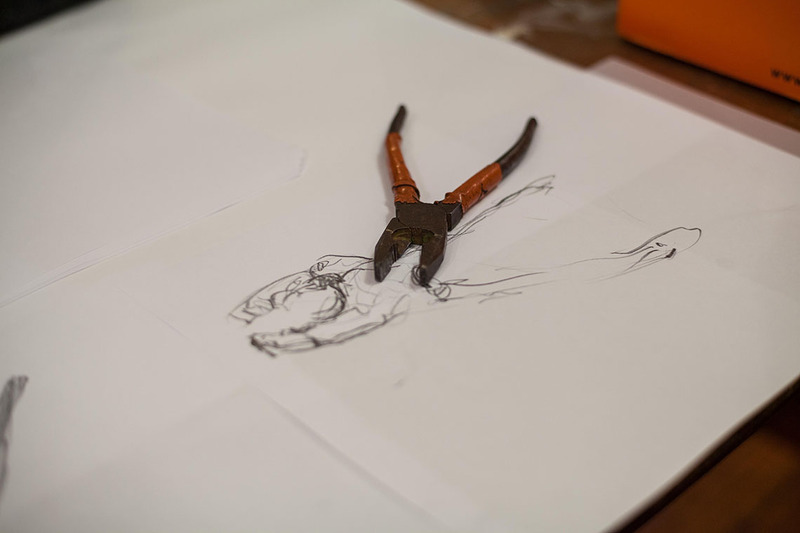 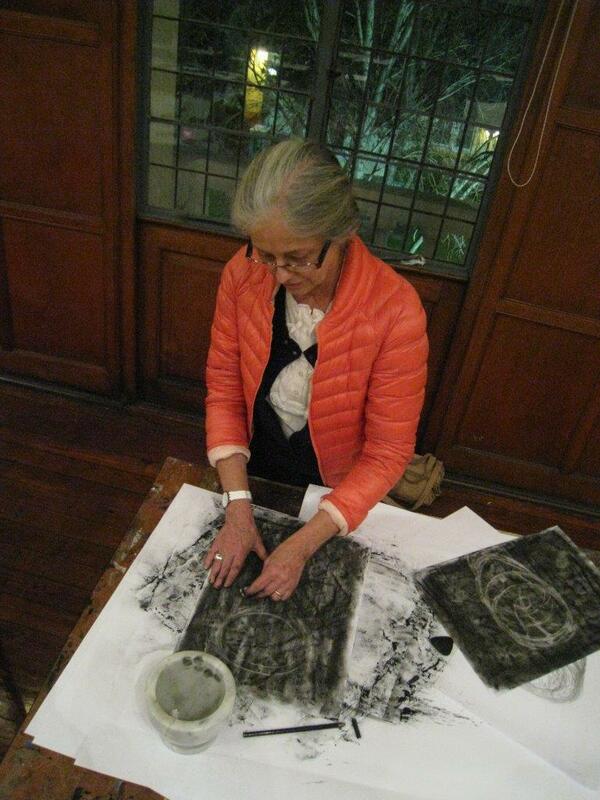 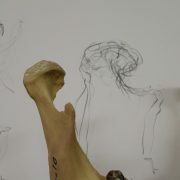 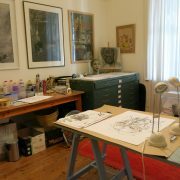 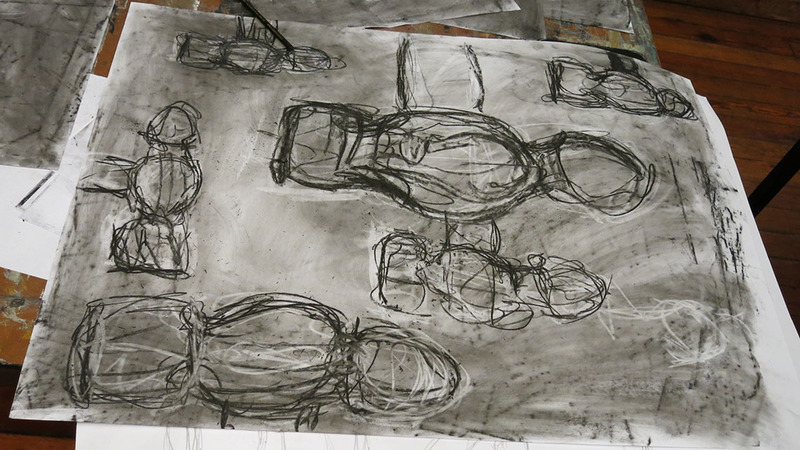 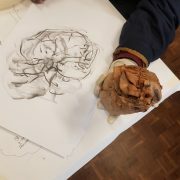 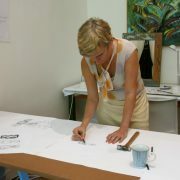 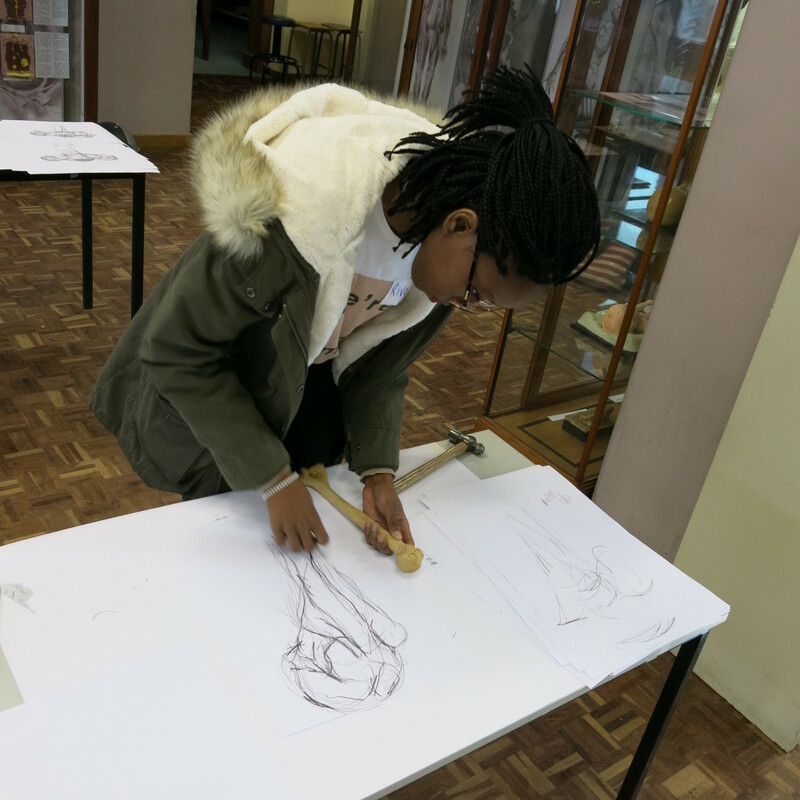 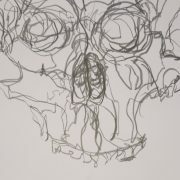 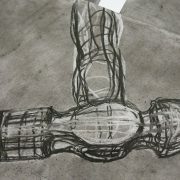 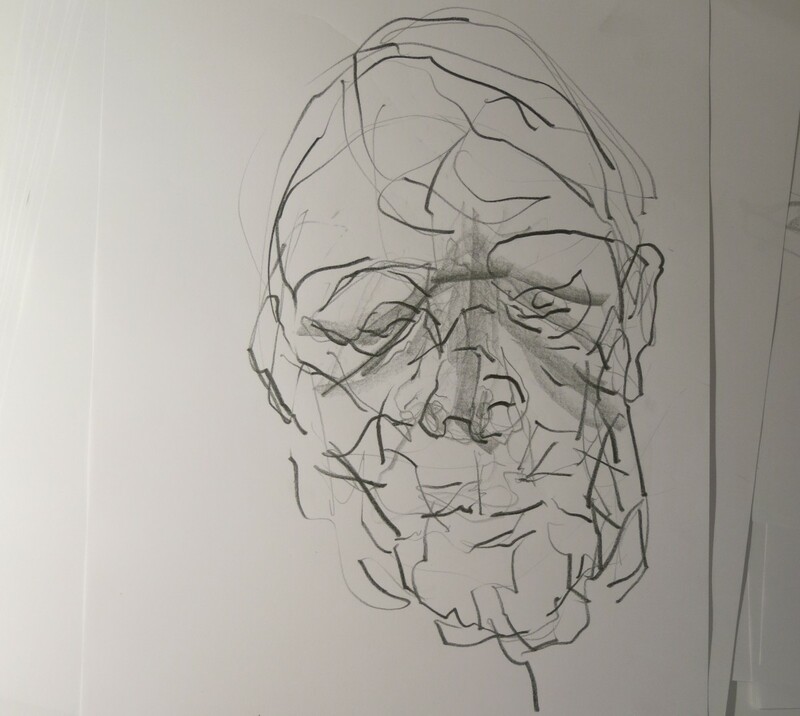 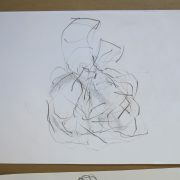 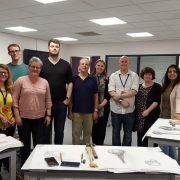 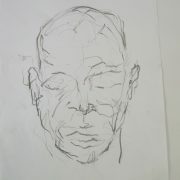 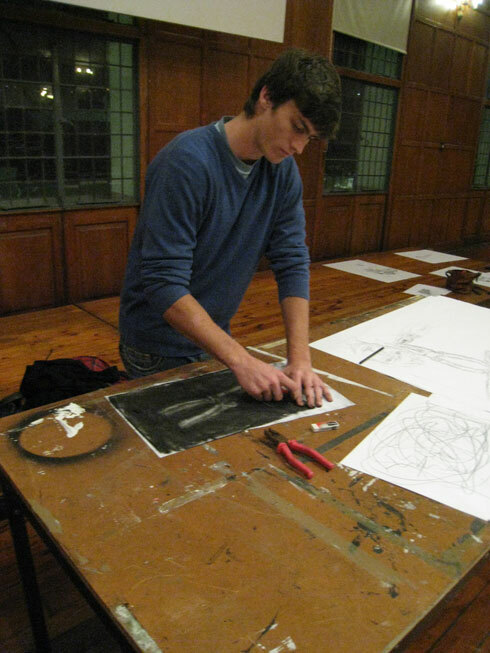 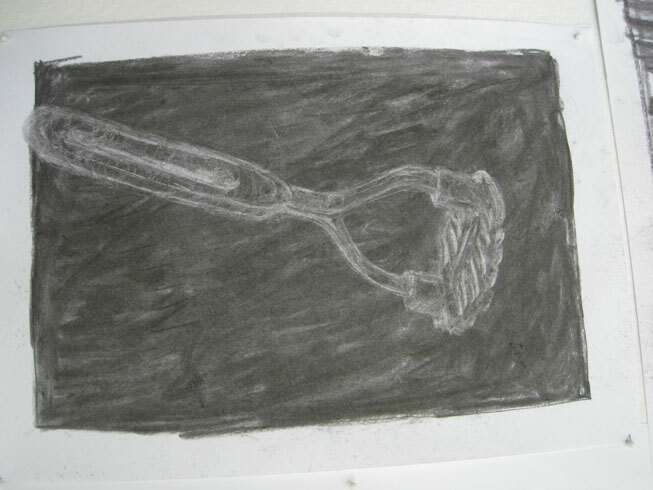 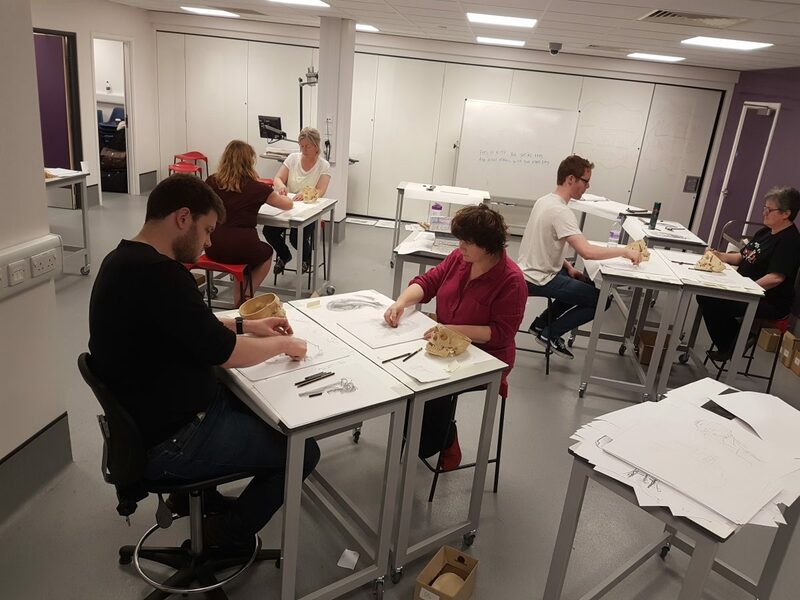 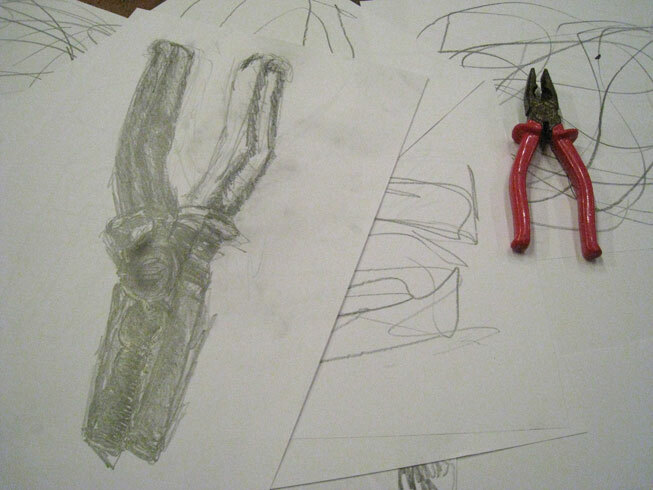 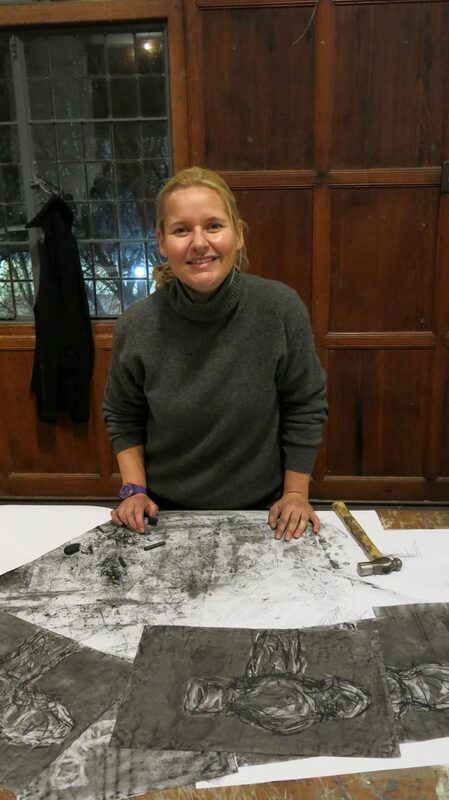 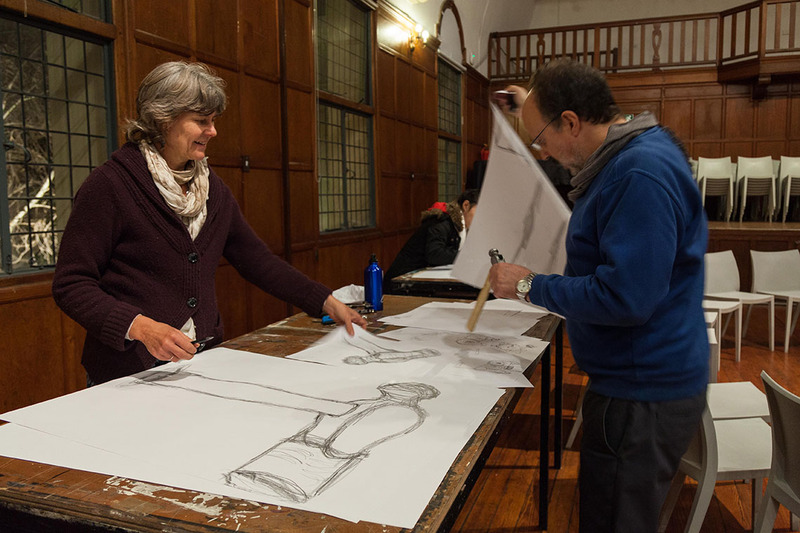 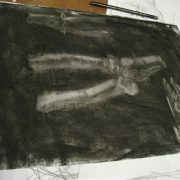 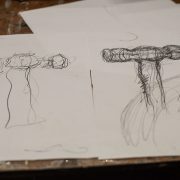 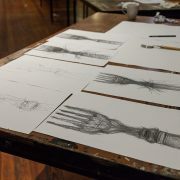 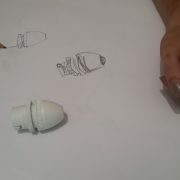 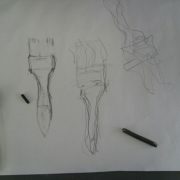 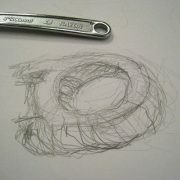 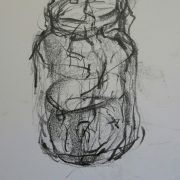 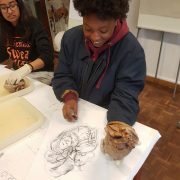 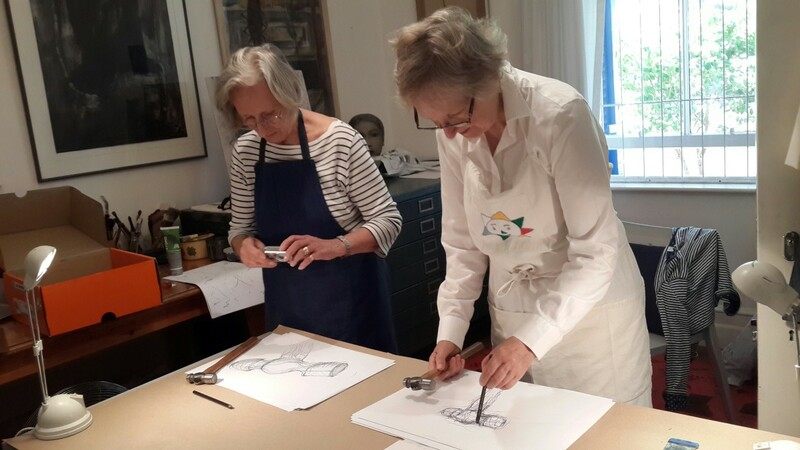 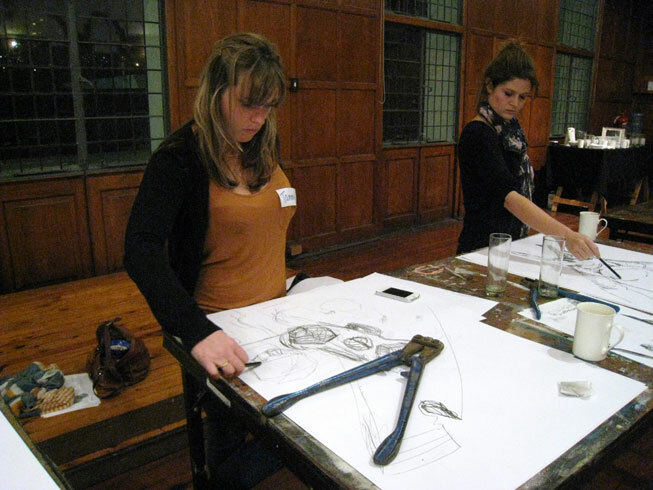 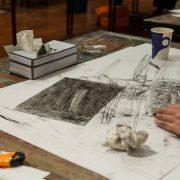 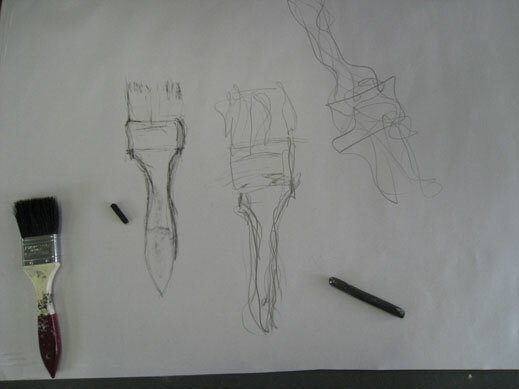 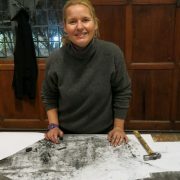 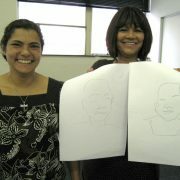 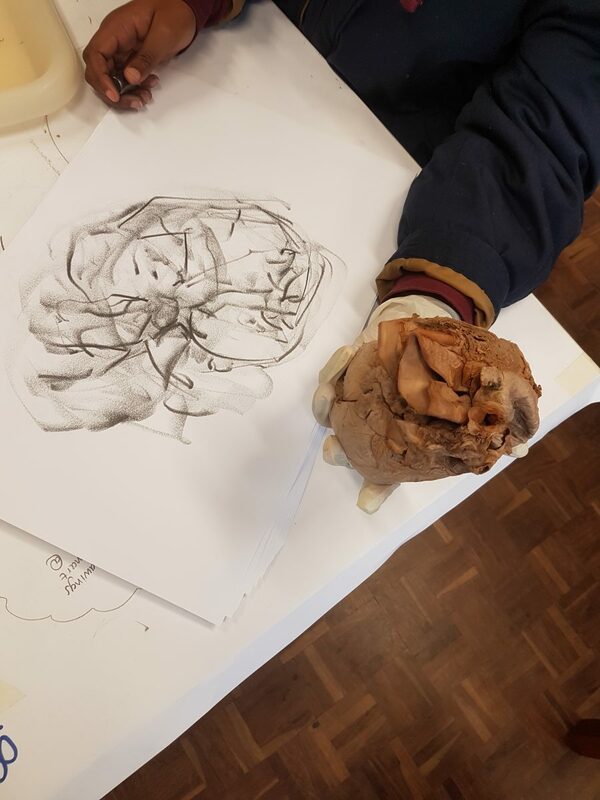 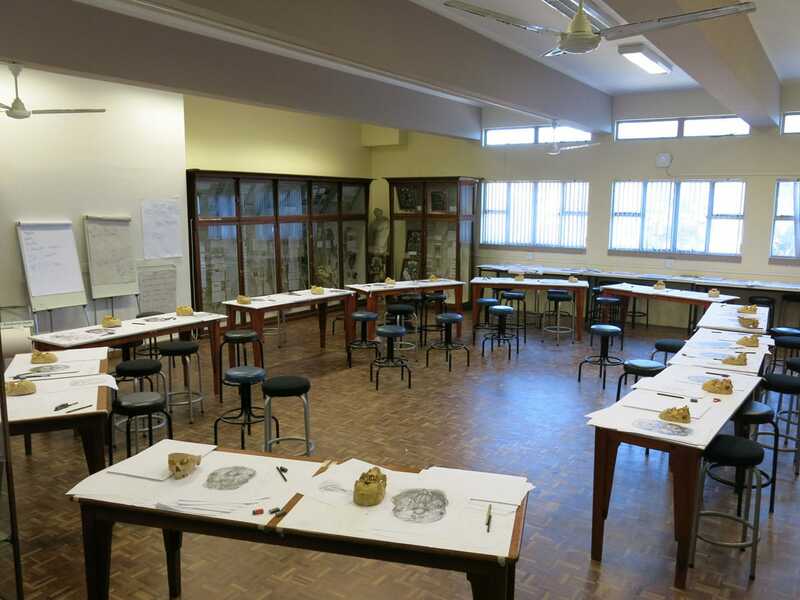 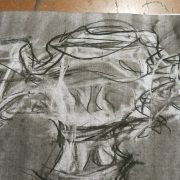 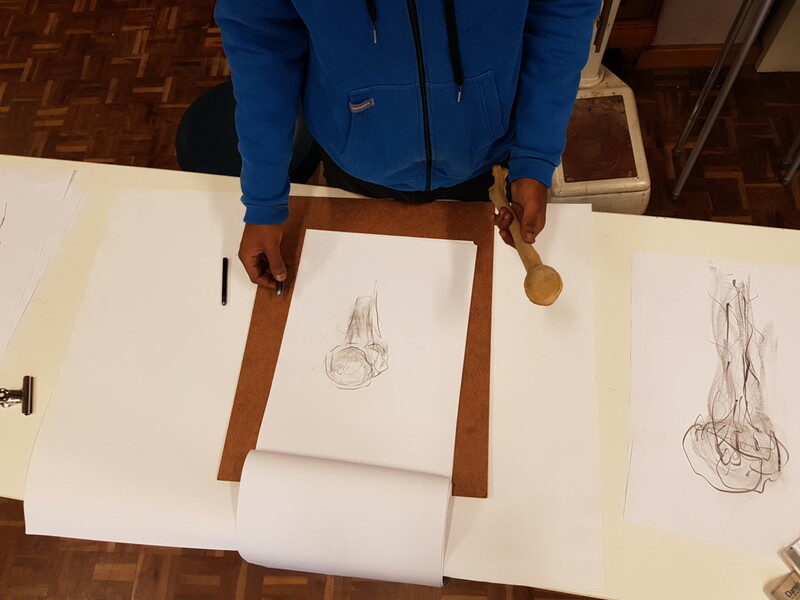 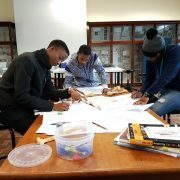 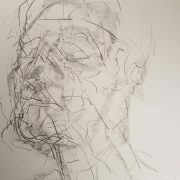 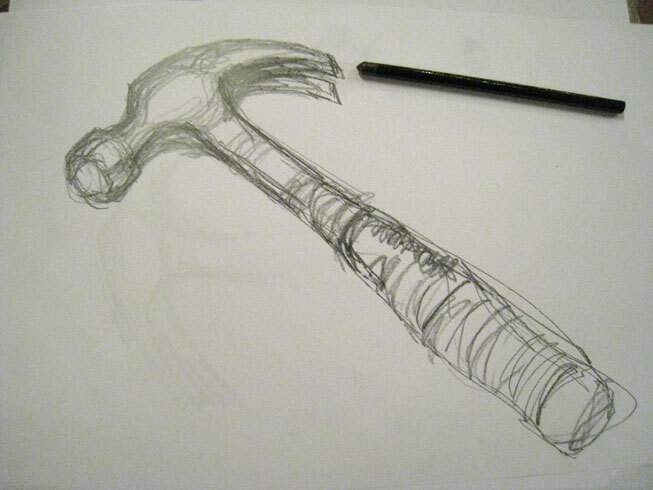 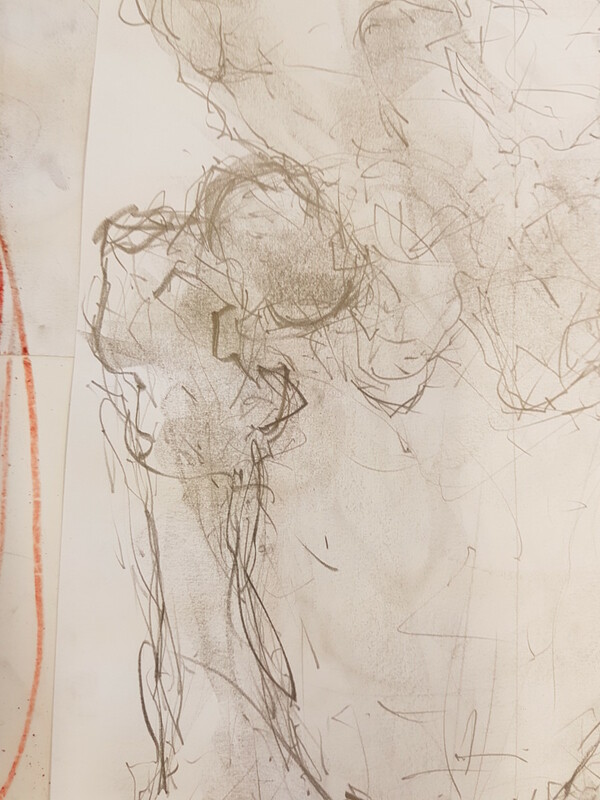 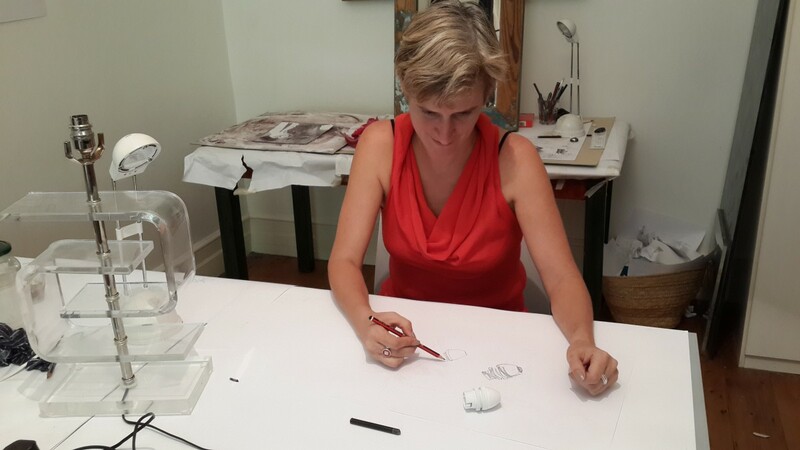 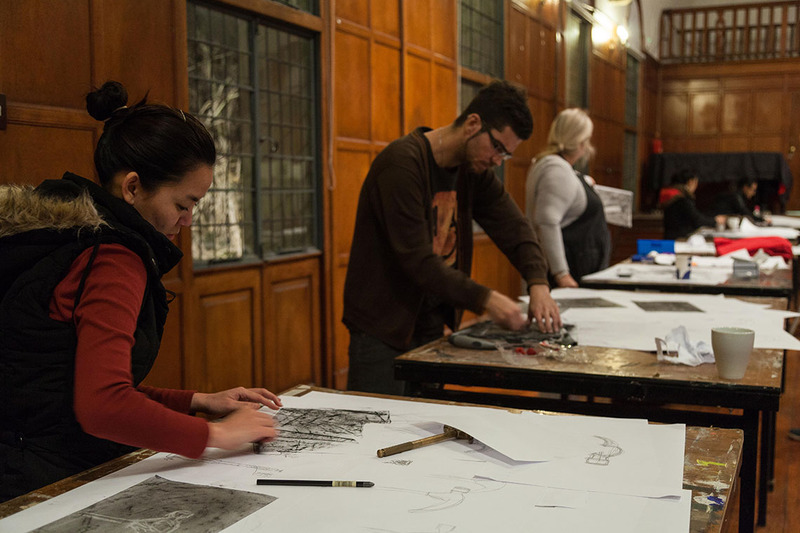 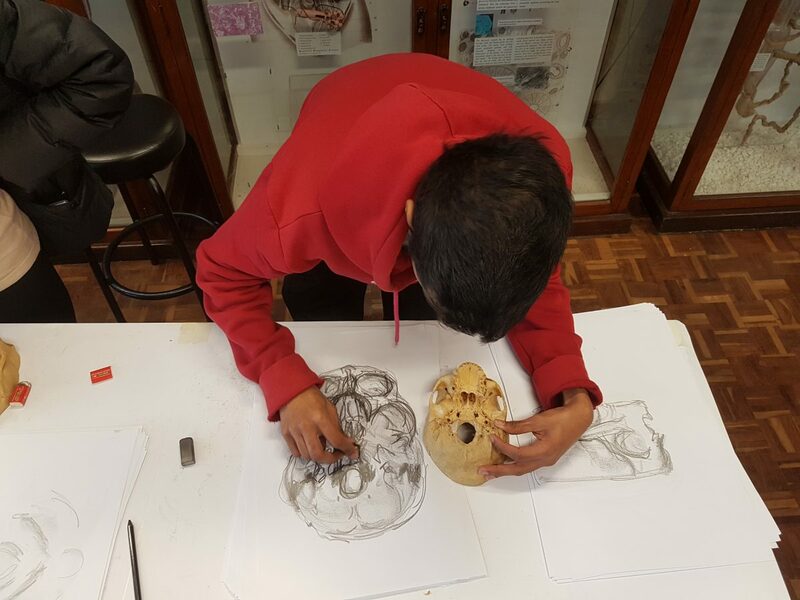 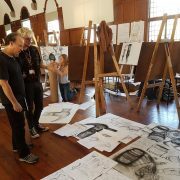 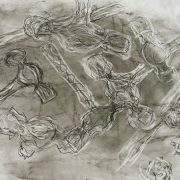 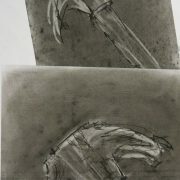 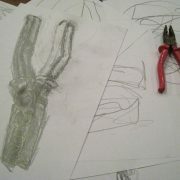 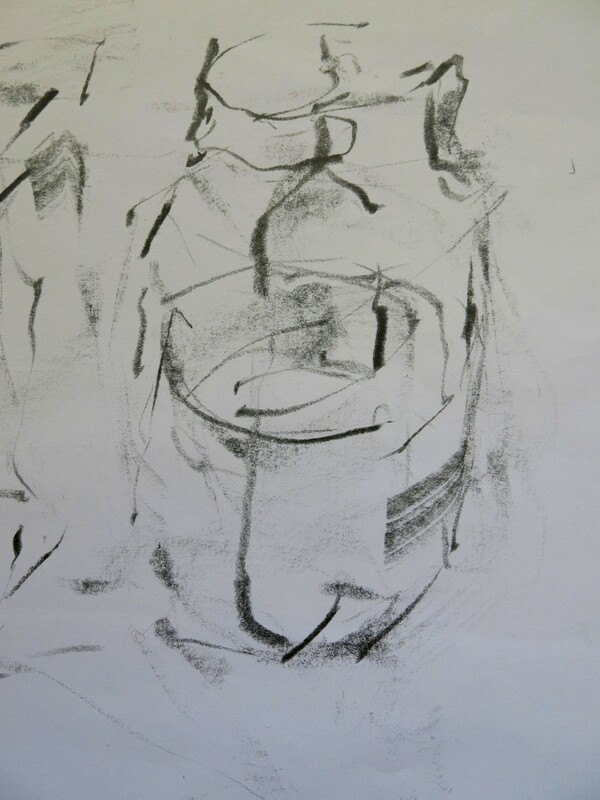 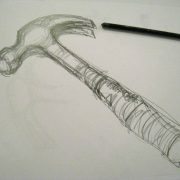 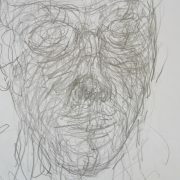 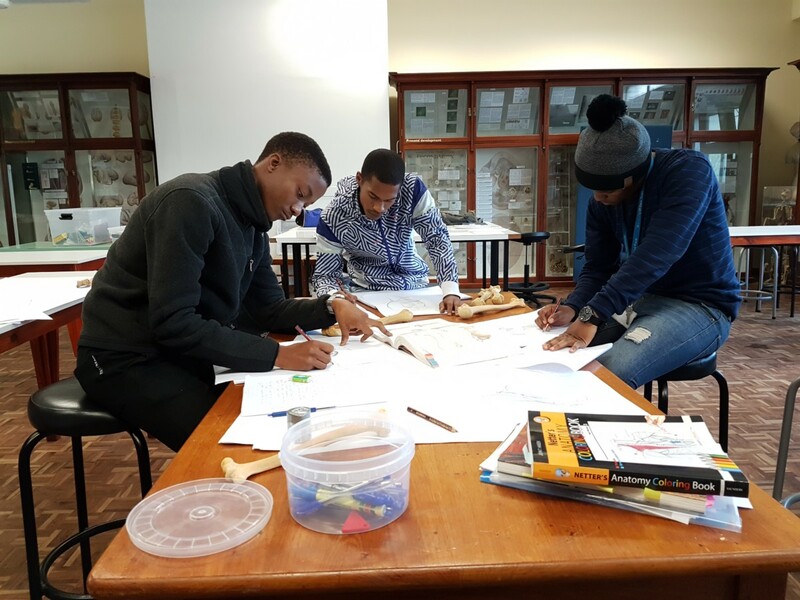 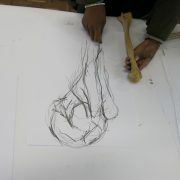 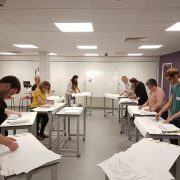 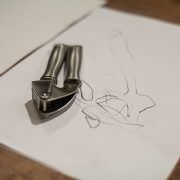 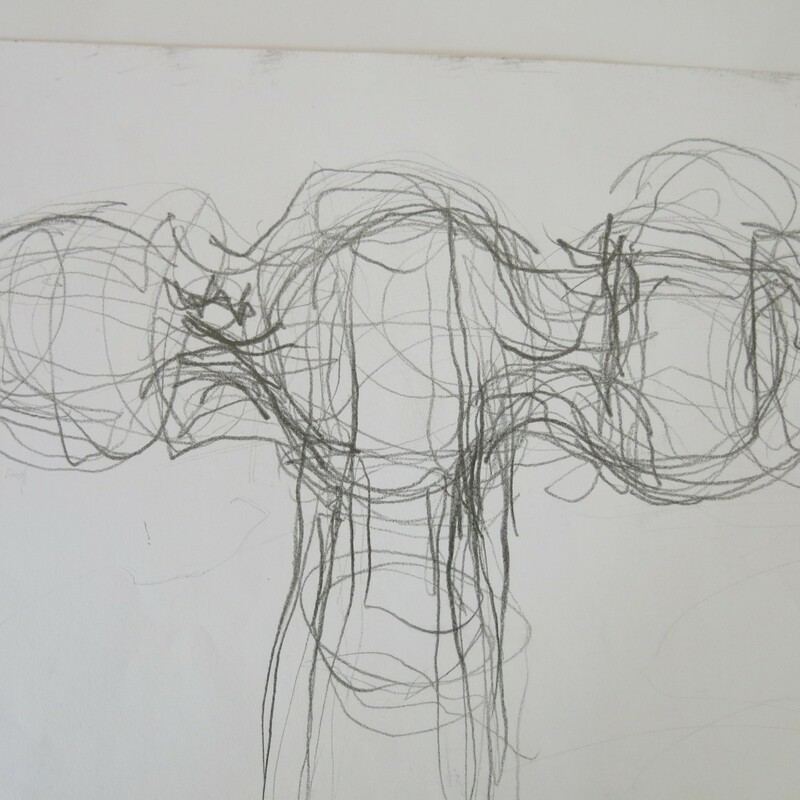 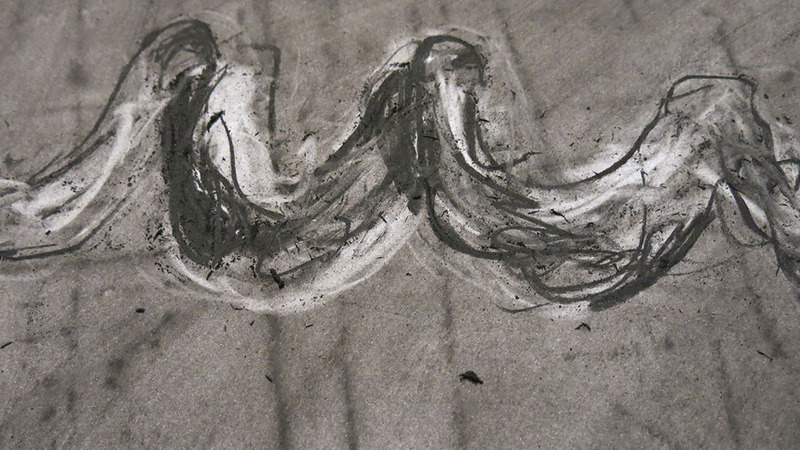 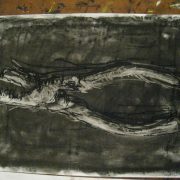 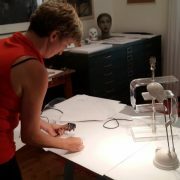 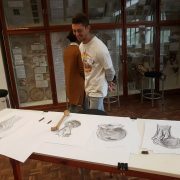 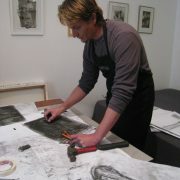 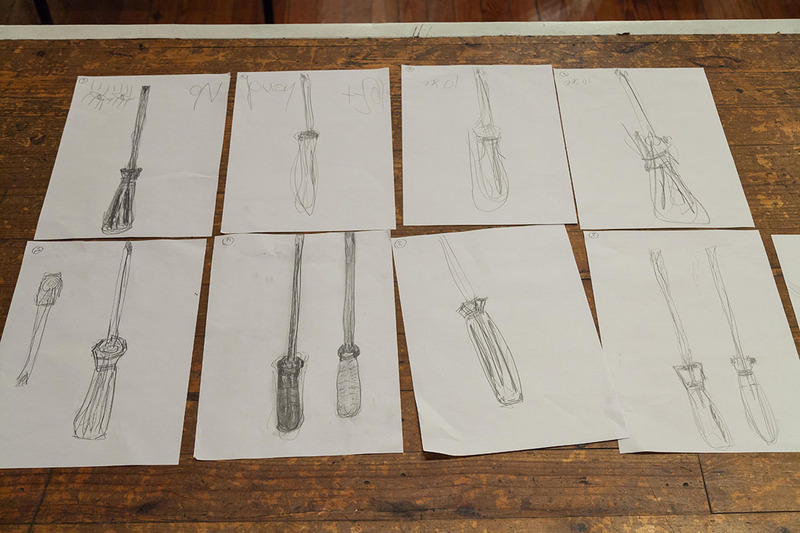 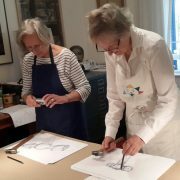 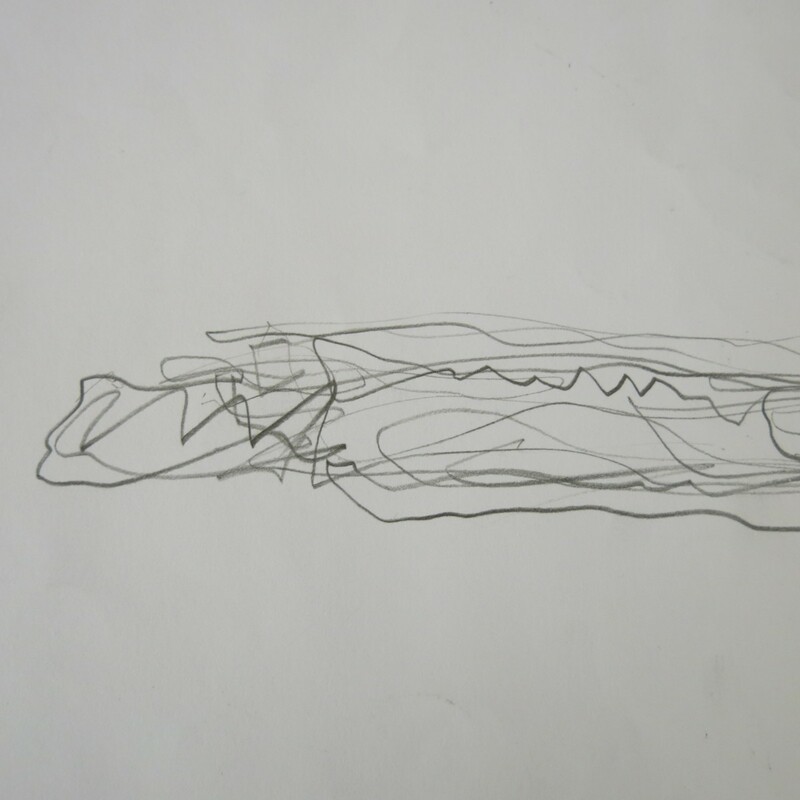 For information about drawing tuition and workshops, please visit the About Tuition page.